Our children are simply the best. 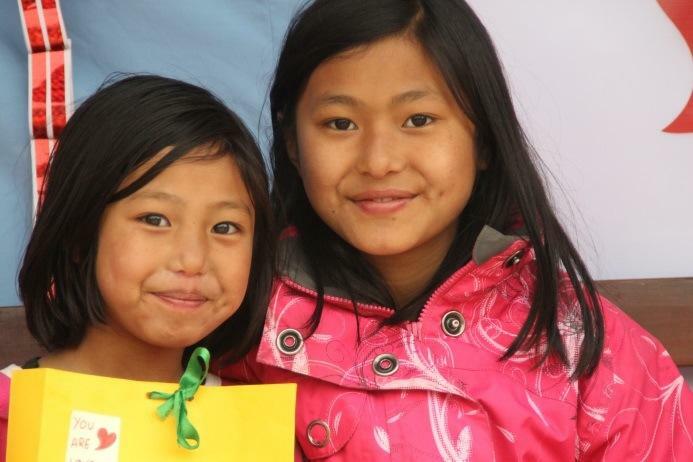 We had a call one day earlier this summer from the village of two sisters who live with us. 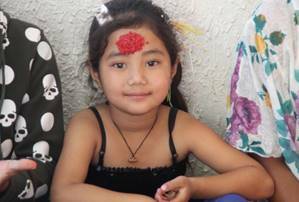 Their grandmother had suddenly died; she was their only family and has loved and cared for them every Dashain holiday since they have been with us. The caller said that they would be burning the body the next morning. 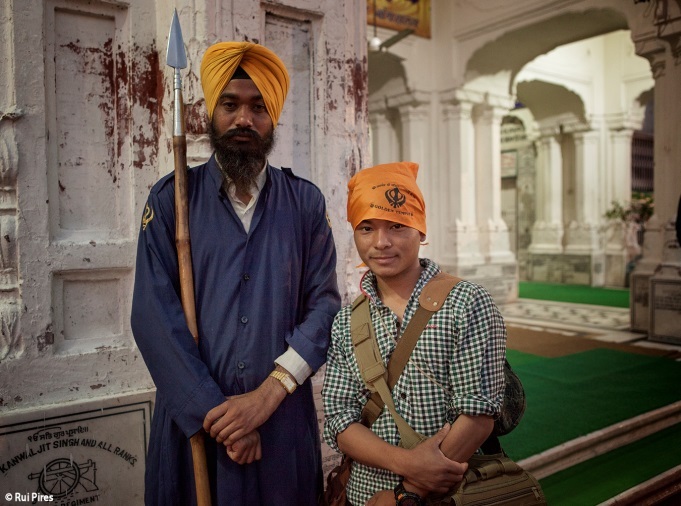 It was then 4pm, their village a 12-hour drive by bus. The next bus left at 5pm and the bus park is 20 minutes away. 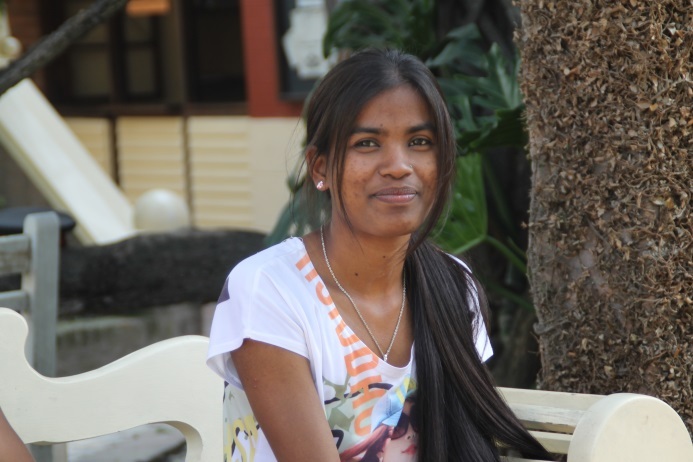 I told Anita Mahato, their manager, that it did not seem possible; our older boys who help take volunteers to their placements were all on assignments. Anita then called one of our college boys who was at work. She told Ram the situation and he said I will be there in 15 minutes. Anita called our taxi driver friend and he said the same. Ram asked his boss to forgive him, but said my family needs me, and ran up to Anita’s house, no change of clothes or toothbrush with him. The girls threw some clothes into a back pack and were ready when both Ram and the taxi arrived at the gate. They made it to the bus at last boarding and settled in for a 12-hour ride through the mountains in a bald tired, bolt-loosening vibrating old bus. 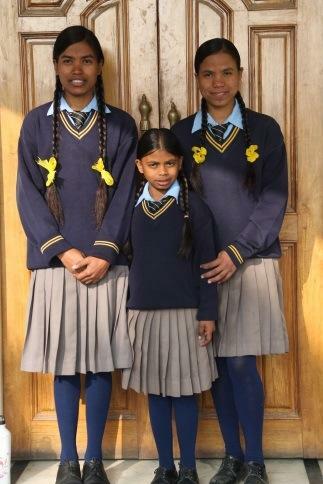 They arrived on time the next morning so that the girls could say goodbye. 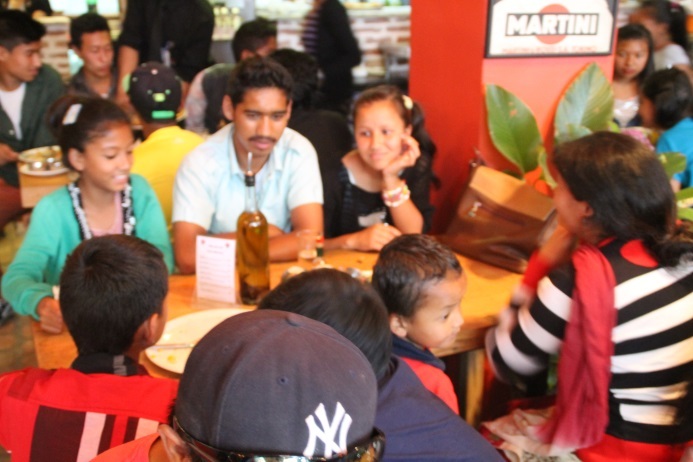 The other day some managers and older children sat together at lunch. I brought up having just heard from one of our older daughters who was now back in her village, married and with a child. 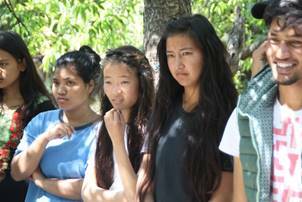 I asked, somewhat rhetorically, “How many of our girls are now married and with children?” and we began listing them. It did not take long for us to have 27 names on the list. 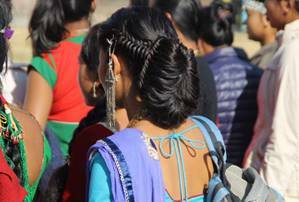 These were all the girls who had decided the village life was what they preferred, most but not all are married, those who are not live with a sister or brother and most likely will soon be. Of the married ones, most now have one child. We are lucky in their keeping in touch with us and occasionally we get a visit as well. 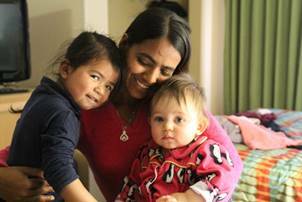 The last to visit is Binita with her little girl Ritu. 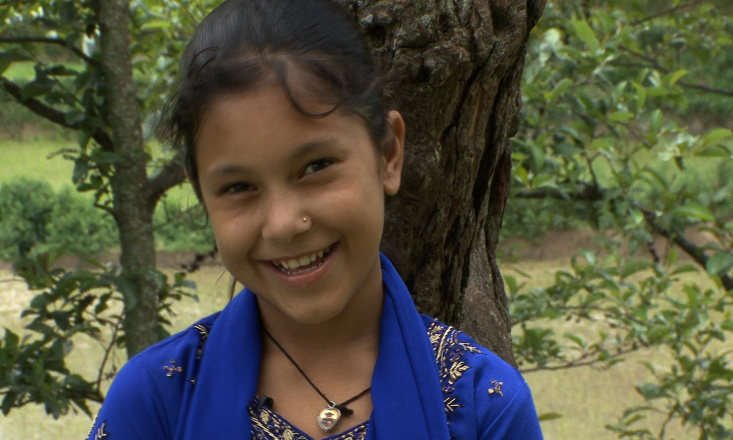 Hope fell in love with Ritu and bestowed upon her a bounty from her own younger days, now long gone by. 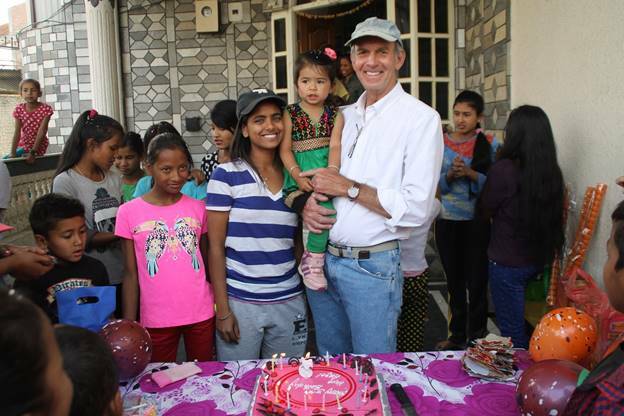 They stayed with us for a week in which every one of the girls in Binita’s previous house took turns holding, playing, and marveling at her little girl. 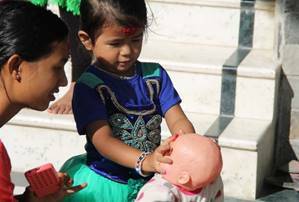 It was a great week to have Binita with us and in many ways educational for the girls to see, that despite the fun, a baby is a 100% commitment and on their terms, not yours. Binita and Ritu helped make me see the extended value of NOH. 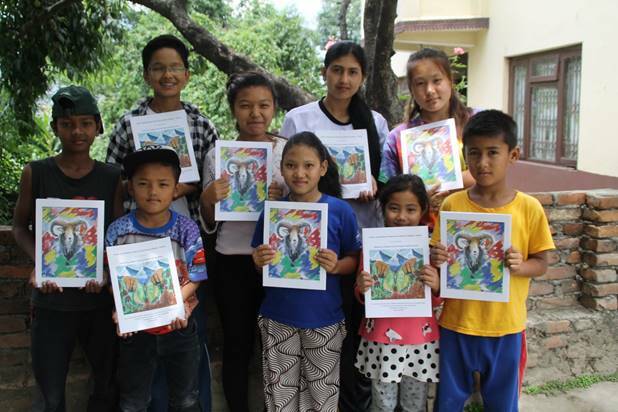 Ann Mayer asked our children to illustrate her second book on endemic and endangered wildlife in Nepal. 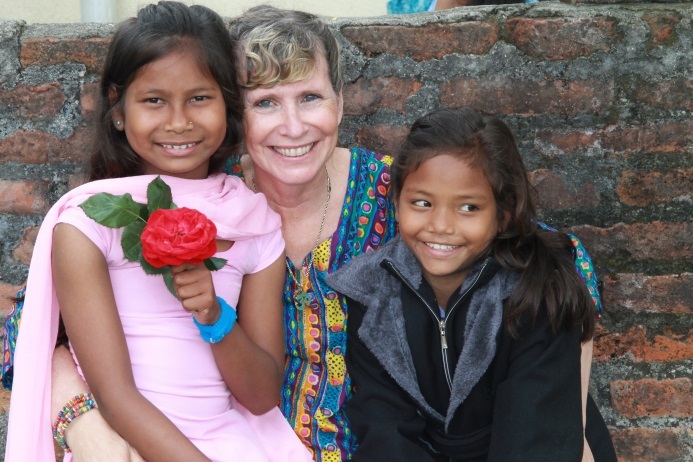 Ann has become a great friend to NOH and our children. 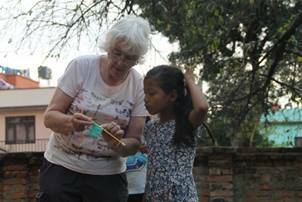 We thank her deeply for her generosity in the development of our children’s awareness of the fragility of Nepal’s Flora and Fauna. Ann Mayer is a graduate of Mount Holyoke College with a major in zoology. After obtaining a Master’s in Education from Harvard University, she taught in the primary grades for 21 years, mostly in upstate New York. 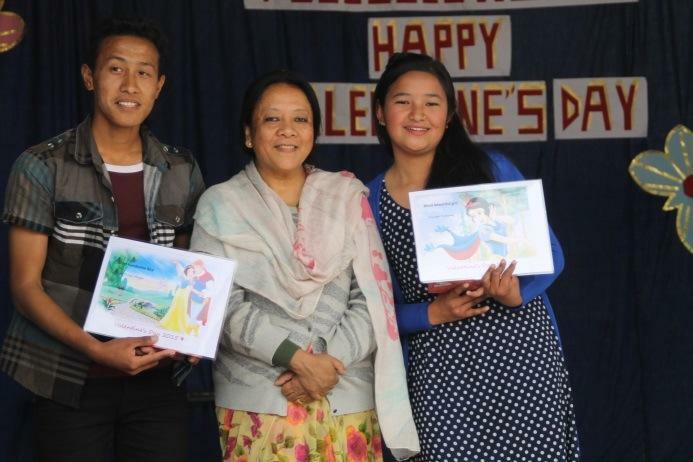 In her retirement, she has combined a lifelong interest in poetry and a fascination with animals to write poems for children. 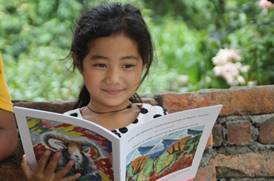 This is her second book of poems about wildlife in Nepal. 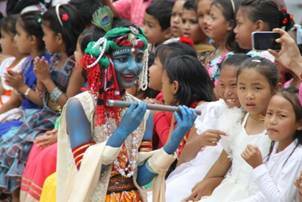 Flower Clown (alias Ron Fowler), who commutes from Cleveland, Ohio, to Bhaktipur, Nepal, on a yearly basis, returned to NOH to give an encore performance before he left Nepal. This guy put on a literally eye-popping show with his magic and balloon making art. 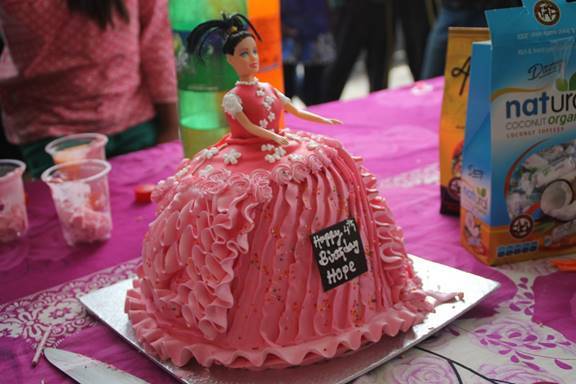 Hope turned four years old on April 30th and we were fortunate to have in attendance the people who brought us together 4 years ago. 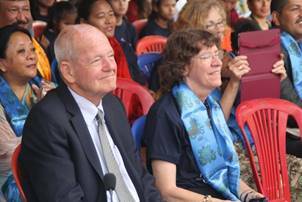 Regrettably partially hidden from one photo is my dear friend Elsie James who has given so much to the women and children of Nepal for over twenty years as the in-country Director of Medical Mercies of Canada. Our graduating class of twenty have had a great three months off. 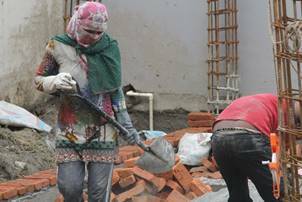 Ten boys and ten girls all finding temporary jobs and working hard. College will start soon. 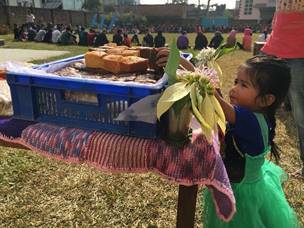 Every year we do an early morning send off for them, each child and all the managers offering blessings and a tika before they walk together for their first day of school. That day should have been here by now, the kids are registered and measured for new uniforms, but the government hasn’t yet decided which day school should start, so we wait. I had hoped to include photos of our college-bound crew, but I have put off this update long enough. 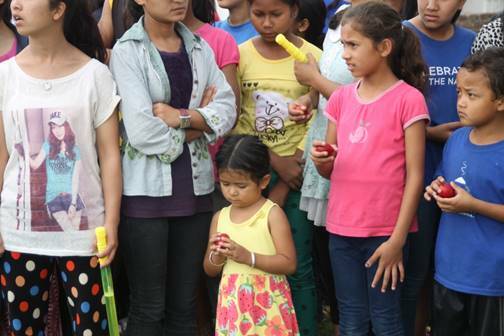 Last Saturday some of the Papa’s House board members decided to come and honor them and so below please see the children assembled, those with the red tika are college bound, the other four are on the board or staff members. We try to bring excitement into the family life and one of our traditional ways is to occasionally color and number hard boiled eggs that correspond with prizes along the lines of a meal out with one of the managers or at one of the other houses (Hope won a dinner at the college boys house and they made a really big evening for her), shopping trips with a friend and manager, lunch alone with the staff member of their choosing, in all we had 25 prizes, some rather simple, but all memorable. 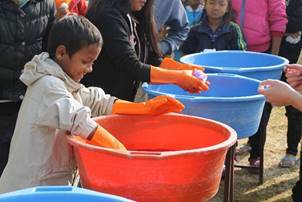 This particular time Carola Drosdeck, the Vice President of NOH and fill-in House Manager for the Sanctuary House while Kamali was away getting married, boiled, colored and numbered 130 eggs with the help of an enthusiastic crowd of Sanctuary House girls. 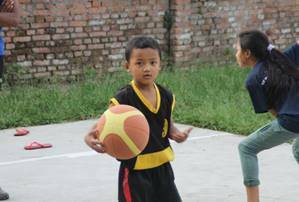 Every morning at 6am there is a basketball lesson taught by Sam when he is here, or Nama, one of our children, when he isn’t. 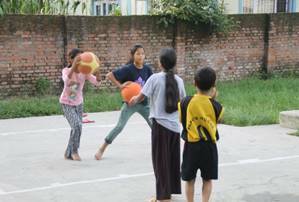 Nama is a sought after college basketball player presently trying out for the national team. Nama and four other boys have played basketball together all the time they have been growing up with us, and several colleges tried to recruit them as a group to come and play. 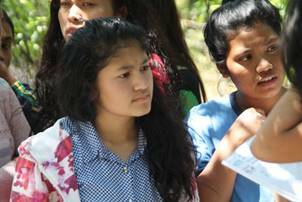 Finally they choose Morgan College which had years ago recruited Cila, our top girl player. 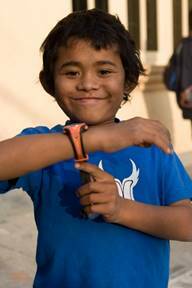 Today was a group of 11 and up kids; each day rotates to include all those who wish to play. My favorite group to watch are the under 11 children who can’t, despite a herculean effort, throw the ball as high as the hoop. These are photos of Anita’s House, my last stop in hair braiding. 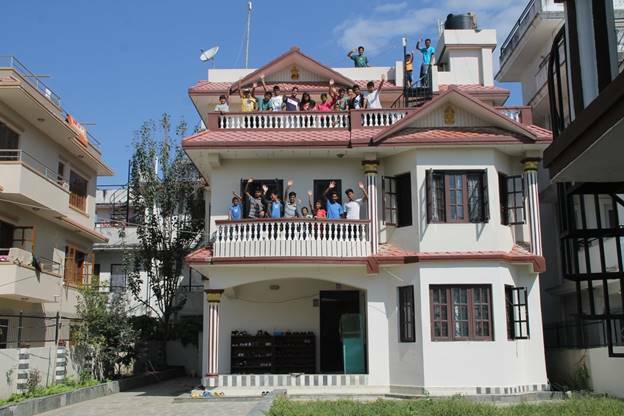 This year 10 of our 20 boys moved to the college house which left 10 mostly small boys in their home. So Anita and Hope, her best friends Kai and Pretty, and two class ten girls from Anita’s old house moved in so Anita, in Sam’s 6 months away, could manage it. 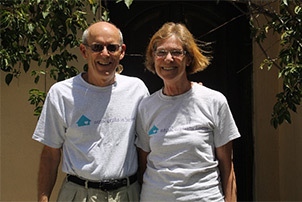 Our Sanctuary House, where Anita began her managing career around 9 years ago has been shuttered. It was a beautiful house, but the well had dried up and we were buying tankers of water several times a week. 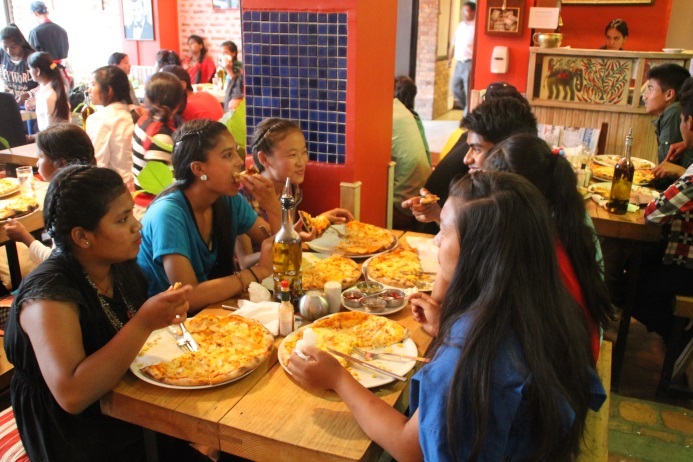 Papa’s House had room for the 14 other girls from Sanctuary House and so we combined them. 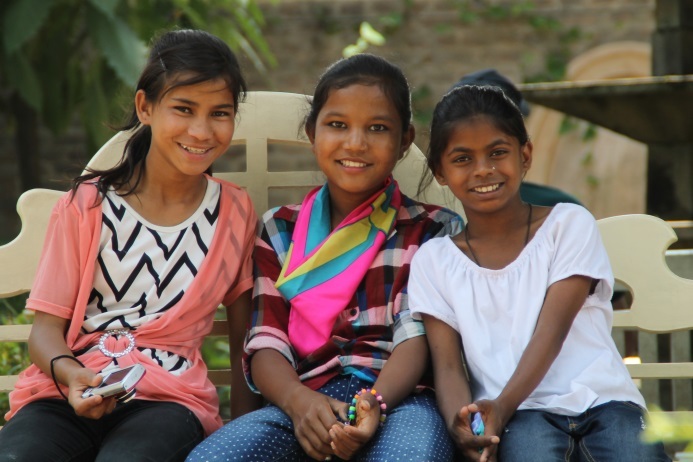 It was difficult to divide the house, almost all the girls had been together from the beginning, but they embraced this first change in 9 years and are enjoying getting to know their new homes. 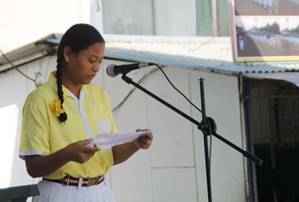 On Sunday the school celebrates “Teachers Day” where the children have developed a program to honor them. 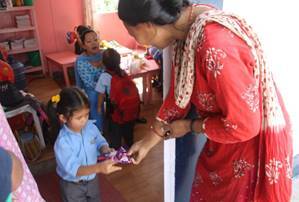 Hope wished to get things started by giving all the teachers in the kindergarten a “Dairy Milk” chocolate bar. 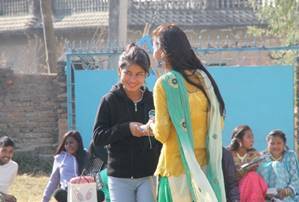 Notice the woman in the red kurta, how she touches her right arm with her left hand while receiving her chocolate, this is the proper way to receive anything in Nepal, but sadly a habit that is nearing extinction. Hope adores all of her teachers very much, so much that during the day she will request that she go and visit them randomly during class time, a request that for sake of Hope’s convincing personality is always granted. 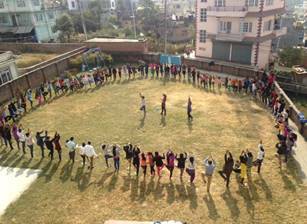 The view Ranjita has when she raises her eyes, over 600 students plus teachers. And that is this morning. The following is a collaboration between Sumi and me, coming from recent questions I have asked during our hair braiding time. The fluorescent light flickers on with a little ping, ping, ping, nothing is said. It is four in the morning; my roommates stir slightly then embrace their pillows tighter as they do every morning thinking somehow they will reclaim sleep. Sleep is never so sweet as to when it is denied. I don’t think, I just rise up quickly, I know the routine. I am the first to the toilet, I wash my face and brush my teeth, leaving the toilet pulling my hair tight, I tie it into a pony tail. 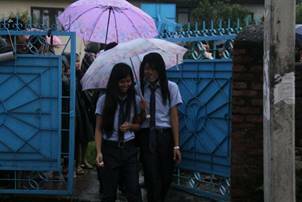 I go into the hall where the other girls walk like zombies to one bathroom or another, some smiling as they do when it is raining and they are slipping on the rain ponchos that make us all look childish. Few words are spoken, vowel sounds their communications. I don’t like anyone telling me what to do, I learned a long time ago that if you do the right thing on your own then people do not tell you what to do. I learned a long time ago what people expect from me or others. Sometimes I think that they don’t see me as an individual unique being, they just see objects that they need to corral so that they can feel they are doing their job. I make it easy for them; I know what I expect from myself and it is far more than the managers, or teachers, or house captains expect from any of us. 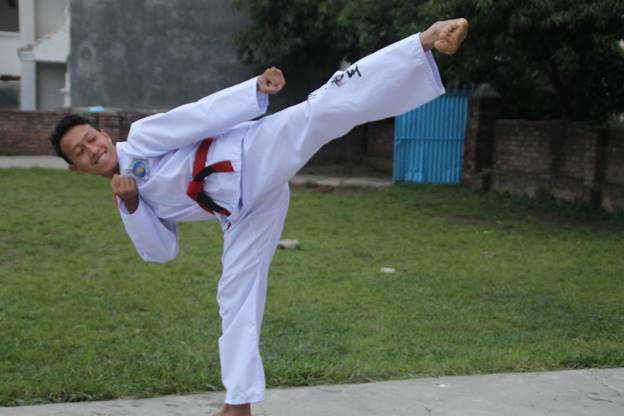 I tie my black and red belt tightly and neatly in front of my worn Taekwondo uniform and go down for tea, skip the puffs, and walk alone to Papa’s House for practice. Every other morning for six years I have done this; I never miss one, unless it’s raining and then no one comes. The others are good too, but over the years some have given up. 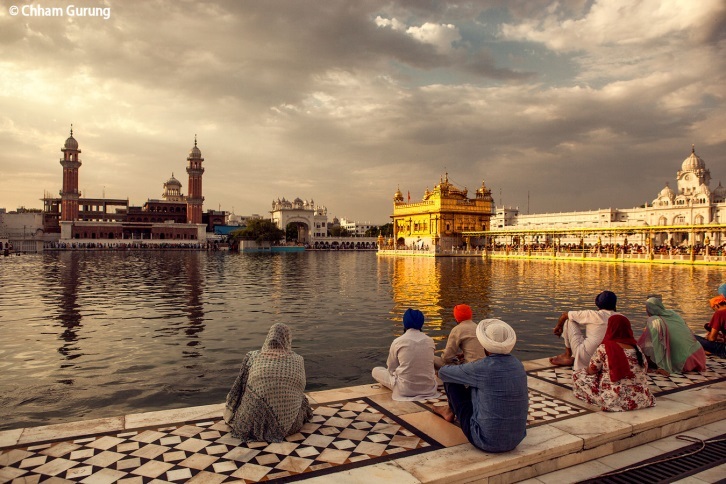 The winters are challenging; it is very cold and all you wish to do is huddle, but the Guru arrives and we must take off our jackets, shoes, and bow. Then it begins, the cold ground or concrete brings complaints from the others, but I like it. I feel alive, I feel something is testing me, something I don’t know but which is always present in my life and again I can show that I will pass this test also, with a smile. 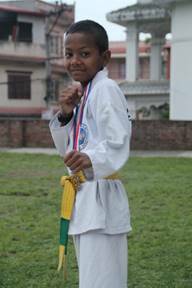 When I go through the gate at Papa’s House for Taekwondo I see Papa talking with some children; they have already finished their walk and exercise. Papa walks every morning; he used to run. When I was younger Papa ran everyday with the older boys, long runs to a temple 4 kilometers away. 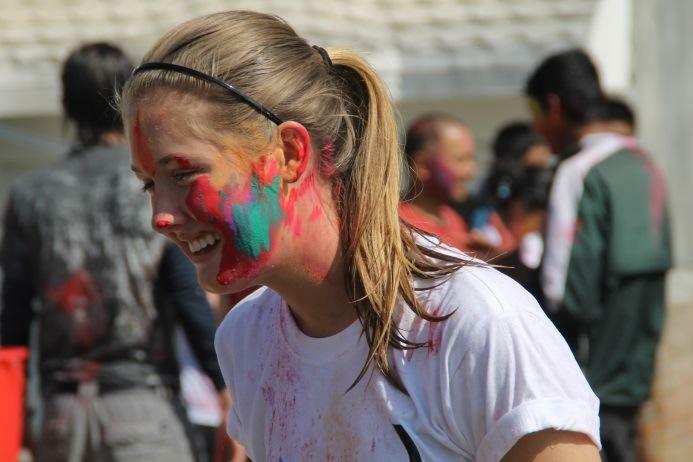 They would race and they had to stop at the Temple and put color on their foreheads to prove they ran the distance. Sometimes they ran together, sometimes in opposite directions as it was a large circle they ran in. Papa would be back on the grounds rested when the boys would come staggering in, bent over to catch their breath. But the years went by, the boys legs became long and strong and then it would be Papa staggering in, bent over trying to catch his breath while the boys sat rested, smiling at each other when Papa would look up and smile at them for what they had become. Papa is every day following his routine, no matter how sick he might be some days; he always is where we expect him to be. I am the same. Every morning Papa braids my hair; he does this for a lot of girls. He always asks a lot of questions that are supposed to make us think; sometimes he simply asks, “How are you?” and it is more than “How are you?” It is, “I want you to share with me, what is going on in your heart and mind.” These are the places I keep pretty much to myself, but when Papa asks I feel drawn to tell, like if a mother might ask. I laugh at this thought, Papa is my mother, he cares for me in a way I imagine a mother should care for her daughter, but he shouldn’t be my mother, my mother should be my mother but she isn’t. Papa is also my father watching me perform Taekwondo or winning the competition at school that decides the best athlete of the year, which is me; I know that he is there, watching, but I do not win for him, I suppose it is to show my mother, if she were to exist in my life, that I turned out great without her, was that her wish for me? Did she feel like she would hold me back if she kept me, did she give me away because she loved me or because I was in her way? Maybe I win because that is who I am; if you lead then no one tells you how to follow. I am in class ten now; this year there are only 7 of us from Papa’s House. It is early in the year, but in our exams I was first. After class ten you take an exam that determines your fitness for college. It is a matter of pride for students and parents to say that they have passed this exam. In the whole country on average 37% have been passing, but last year they changed the grading system to allow everyone to pass because they said, too many students were taking their own lives if they failed. There is no competition in that. 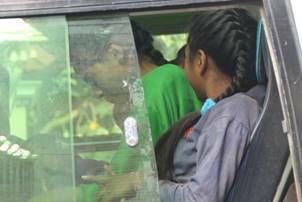 So after Taekwondo we have our breakfast and then begin to prepare for school, Papa will go house to house braiding hair; some girls in each house only want him, but many of them stay in their rooms and do each other’s hair. 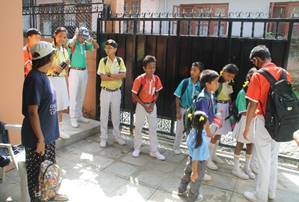 At nine we walk to school and meet Papa at the gate, he shakes our hands, calls us by name and tells us to have a good day. If our collar is up on one side he fixes it, like a mother would. School is a little boring, but I try hard to focus. Sometimes I find my focus is so strong that when the bell rings I rise and begin to walk to the next classroom while in my mind the remainder of a math problem or the vision of a poor family in remote areas with dysentery that we study in social slowly evaporates as I settle into the hard wooden bench of the next class. 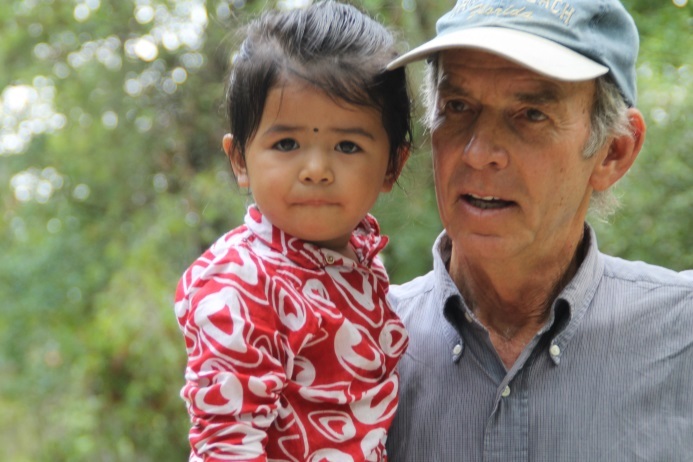 Sometimes I look out the window and see Papa walking across the school yard to Hope’s classroom and minutes later he carries her in his arms, smiling at her and asking, I imagine, to tell him about her morning. Then another bell and everyone races to the café for their lunch; it is named “Hope’s Café”. I wait until the crowd thins and then I take my lunch at the counter, walk around the corner and stand with my friends and eat. Our days are busy; Papa meets us after school and when our lines are made he again shakes our hands as we walk to our homes. When I was small Papa used to give every child a hug and kiss the top of their head when we arrived at school, but we had not so many children then and now we are big and maybe he could not reach the top of our heads. Still, I miss it. 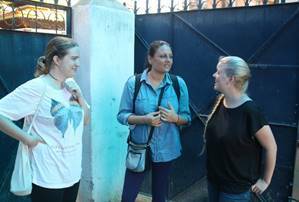 After we reach home we change into our regular clothes and have tea and biscuits and then walk to the Chelsea Center. We spend two hours there where good teachers help us with our homework or teach us computer and some learn the type of skill that one day they might use for work. I don’t know what I want to do with my life; I really don’t have any idea. But I try to do everything better than others so that I will be ready. 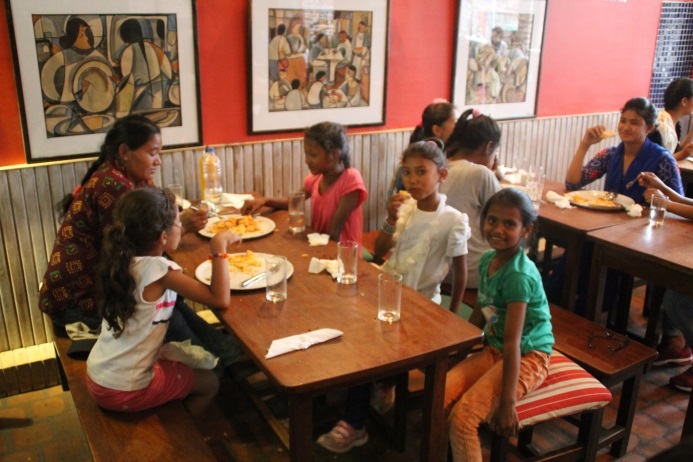 At six we go home and wash up for our evening meal, we all eat together and the girls are smiling and happy. After we eat we talk and slowly go about getting ready to do homework back in the dining room on the same benches. All the children help each other with homework or for any reason, this is how it has always been; I don’t know how it works in small families. When I was six I lived in a village very far away with my aunt. 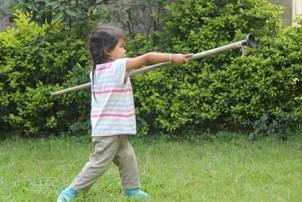 My mother had come to Kathmandu to find work; I had been a long time with my aunt. 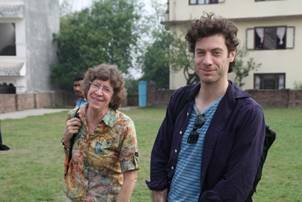 One day I was told, “You are going to go to Kathmandu to sit with your mother” and I was very excited. 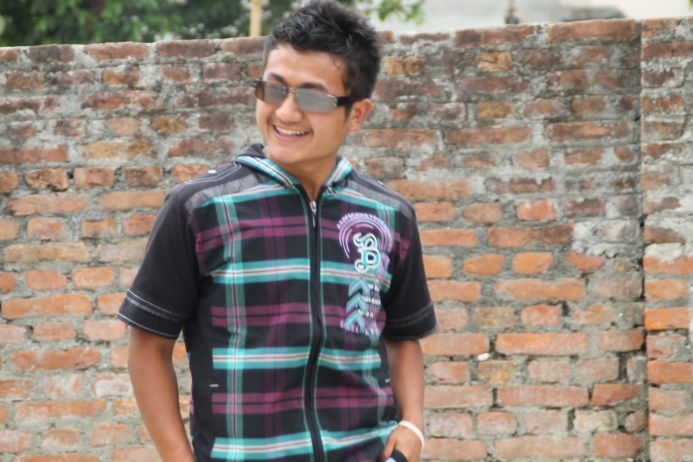 When I reached Kathmandu, my mother took me to her room and told me that it was not possible for me to stay with her; she worked for some rich people who would not allow it. These people found a small home with eleven other children in it and paid the owner $100 to take me in. I did not see my mother again. The owner of the home was not nice; in the evenings he drank alcohol with one of the two didis. They were unfriendly to us; they would sometimes beat us and lock us in our room. We all shared the same room. The other didi was a crippled woman who loved us very much and she did her best to feed and protect us. I was there for only about 2 months. One day Papa came and saw how we lived and he managed to have the owner leave. 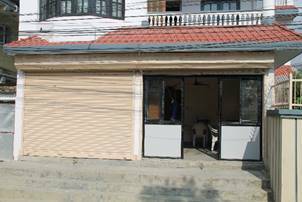 He asked Vinod, who worked with him, to stay with us and then Papa found a new house to move us into where Vinod became our manager. Eleven of the 12 of us are still together, some of the older ones in college, a couple have finished college and work for Papa, but we are still together. 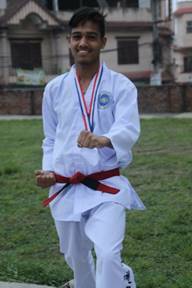 This month I will test for my black belt in Taekwondo. I have to break a brick as part of the test. Yesterday Papa was telling me, “Your body can handle this; it has the strength to do it without any problem, but it is in your mind that you will succeed. If you imagine yourself smashing through the brick it will be done; if you have any doubt in you, if you hesitate you will only hurt your hand. Believe in yourself Sumi, I believe in you, I know you will do this.” I know that I will do it; I believe in me, but more, I believe in Papa. 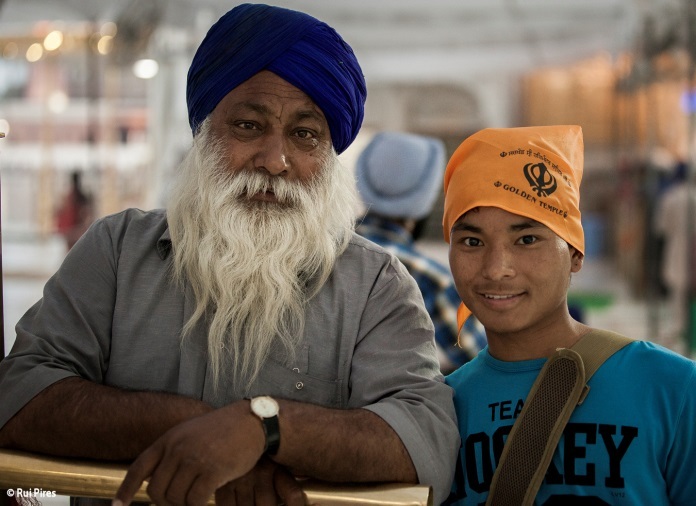 I am a little scared about growing up and being on my own; my only grain of comfort is that I know Papa will always be there for me if I collapse. If ever there was an example of a dog possessing supernatural powers, she would be Smiley. One day in 2008 a young and beautiful dog appeared at our door. Her eyes were expressive, and she was gentle, quiet, and humble. 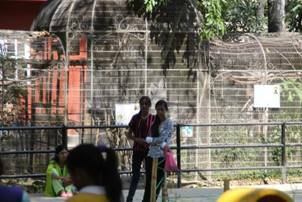 There were no indications of ownership with her, indeed, watching her greet everyone and check out the surroundings I felt as if I should search for the pod that carried her to us from another planet. Once she had secured the property and received pats and kind words from us all she sat down near the gate and began eight and one half years of uncanny vigilance. 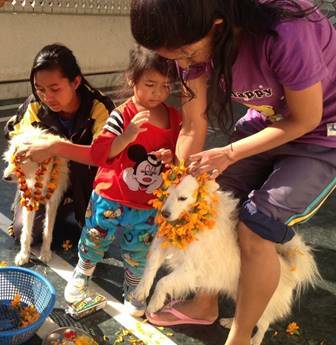 As children came into our homes, as other dogs were born to us, Smiley accepted them all under her watchful eye. Volunteers who came to know Smiley would often remark that when they would be making their way back home at night Smiley would appear out of nowhere and walk beside them to their door and then disappear into the night. We have a lot of homes and no one was ever too sure where Smiley was; we only knew we were at all times safe. Smiley walked the line of children to school each day then would come into the school grounds and know which kids were ours. 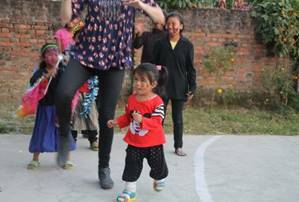 If other children were playing a little too robustly and seemed like they were running towards one of ours, Smiley would quickly place herself between our child and the other. She never missed anything; six hundred children on the open ground and she was everywhere at once. Smiley would return at lunch time to patrol the grounds as the children ate, talked, and played, then again to receive the homeward bound children at schools end. How she knew the time was anyone’s guess. Smiley was the alpha dog; though she was somewhat small and gentle looking, all the street dogs of Dhapasi bowed down when she would pass. 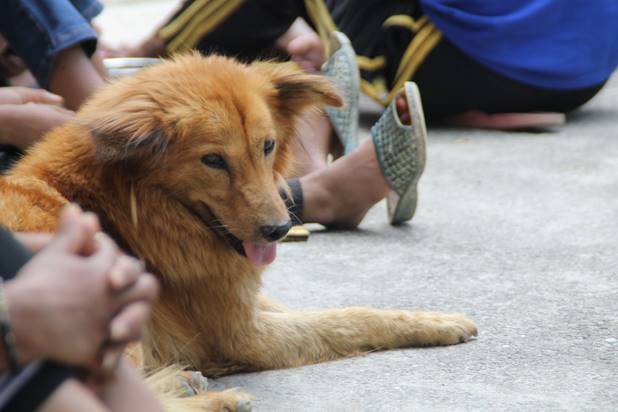 In the past two years as Smiley was aging there were other dogs who, sensing her slight infirmities, wished to challenge her authority as we walked through territories ruled by gangs of street dogs. Smiley, knowing the danger to herself never once hesitated to walk us through these dog “No Trespass” zones, leaving me many times charging aggressive dogs snarling back at her. Smiley was a dog whose very existence caused all to wonder about the relationship between man and their dogs. Countless times over the years Smiley was the subject of tales of head scratching appearances just when they were needed the most. Smiley was put to sleep Monday afternoon April 17th, after about a year’s battle with cancer. 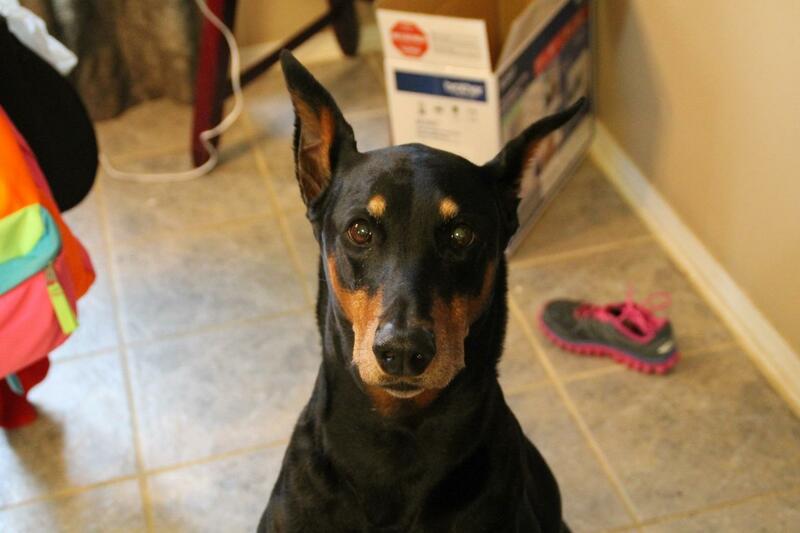 A legend among dogs for the hundreds who knew her. She will be missed. Another Skylark school year begins on Sunday April 23rd, and all the children are excited. This year NOH will have only 7 children in the graduating class, they are sandwiched between 20 last year and 21 next year. What they lack in numbers they make up for in individual prowess; they are the Seal Team Six of NOH at this time. 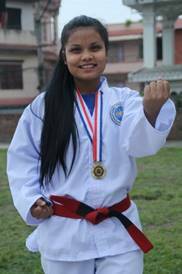 House Captains, Taekwondo champions, academic leaders, and voted as leaders among their peers. We are going to enjoy watching them leave their marks this year. 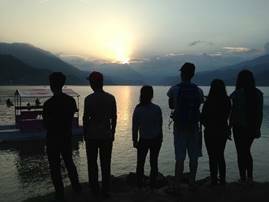 And later that same day, Fewa Lake! 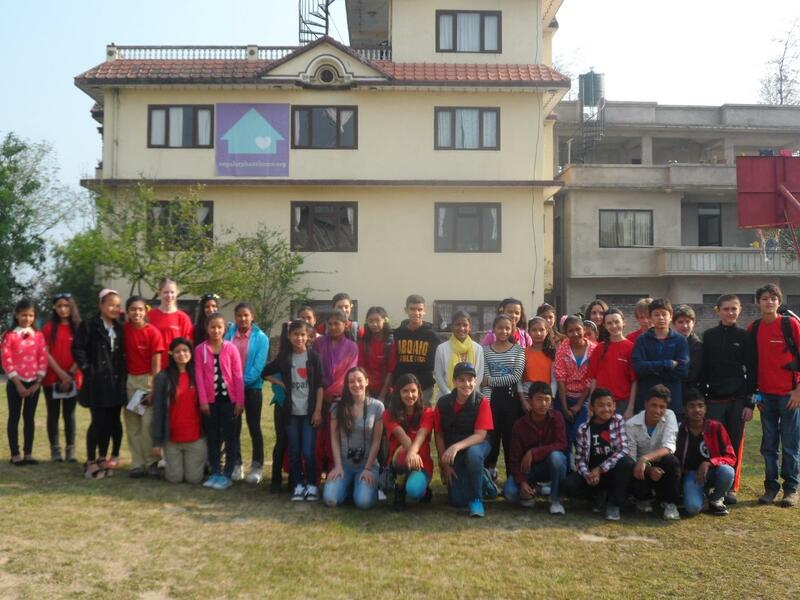 On March 25th we moved our twenty graduates into the college/transition house in the morning, and after lunch managed to move the volunteers from their house to the old Chelsea Center and the boys to the old Volunteer House. As the evening sun began to set, everyone was in their new residence, tired but excited for their new beginning. 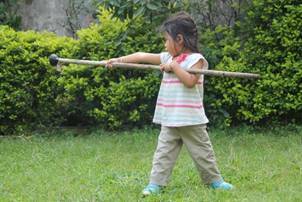 Our children have become phenomenal at moving; imagine households of twenty or more achieving a complete move, on foot, in about 2 hours’ time. Credit goes to having 100 or more participants focused on the mission. 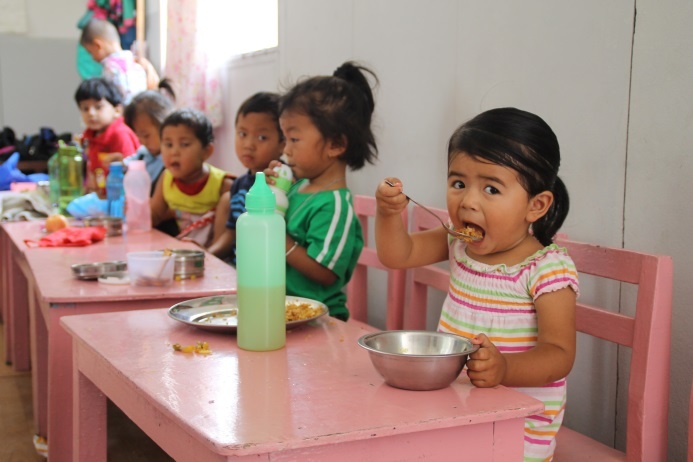 On Saturdays the younger children serve lunch to all the others. 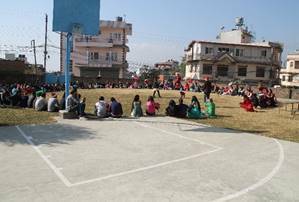 After lunch we had a long talk with the new graduates concerning sharing a building in their separate flats, suggestions on establishing routines and people in charge of different aspects of keeping the house functioning as it should. We spoke of respect, responsibility, honoring oneself, bringing balance in one’s life, finding work or volunteer opportunities and the importance of not hesitating if any problems arise in seeking advice. The children were leaving “Papa’s House,” their emotional cradle, their rooms and roommates, the environment, the family, the certainty, and took their first big step into adulthood. 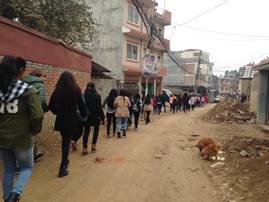 After the talk they walked through the gates together back to their own house and crossed the threshold into their futures, a journey of 40 meters and yet a passing from youth to young adults, from innocence to self-determination. NOH continues to pay for everything in their lives, but they alone must set budgets and learn to live on their own and as a team. By the end of the second week of April all twenty of these kids had found part time jobs. They have quickly shown that they have what it takes. And a moment of tearful goodbyes for others. 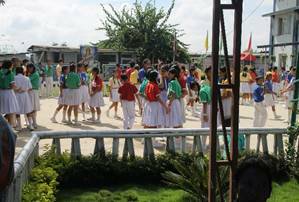 On Friday, March 31st, the school year ended and a brief holiday began. Days went from rigid scheduling from 5am until bedtimes to complete flexibility. A few of those who always meet for walks or runs at 4:30 continued while others waited for dawn. School books were combed through and passed down to lower levels and children were measured for new uniforms having gone through growth spurts the year before. The sun rose and the sun set, days of rain interrupted days of bright warmth streaming together, films were watched and books were read, then out of nowhere the halfway mark came, tilting thoughts toward the beginning of school approaching. 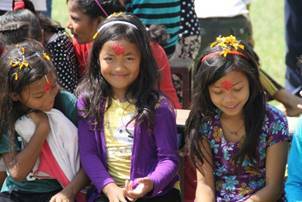 The beginning of the Nepali New Year is as important an event here as December 31st to other parts of the world. It is a time celebrated during the day with family and friends. We are fortunate to have a lot of both. The women in the Chelsea Centers Community Room named after Barbara “Boo” Hess for her many years of dedicated work as Treasurer of NOH and winning Charity Status for the USA. 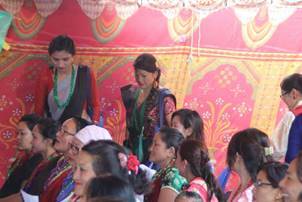 After the rains came the ceremony had to be moved inside the new center, women of the CECC down in the meeting room and all the children and staff upstairs in the classrooms. 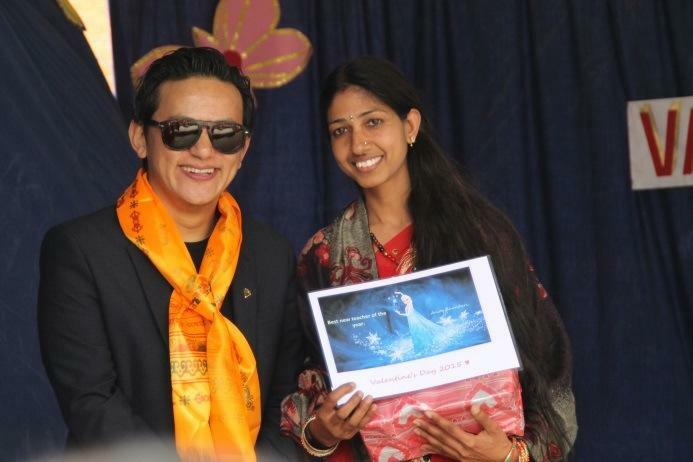 This was a wonderful day for Nepal Orphans Home, having been recognized by the Foundation as a charity organization with the dedication to change for the better the lives of many and validating that recognition with such an enabling grant wasn’t something we ever thought would be in our future. 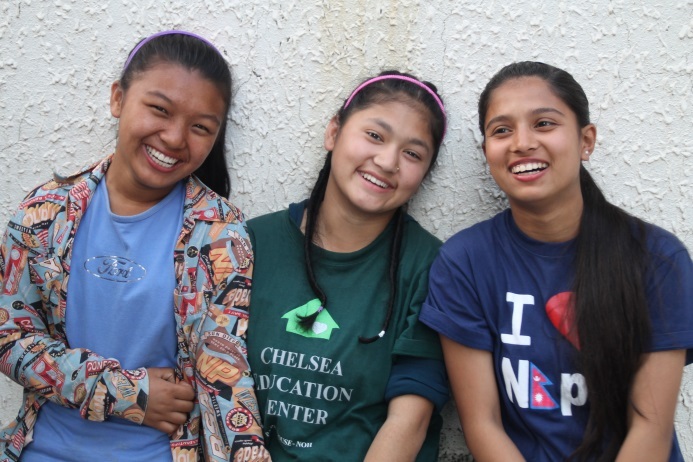 The Chelsea Education and Community Center will long into the future be able to carry forth our aspiration to educate and inspire individuals to recognize and achieve their dreams and by so doing to collectively improve the country of Nepal. In Chelsea’s honor, this will be. 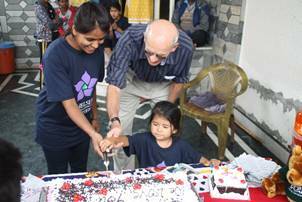 After the Chelsea Center’s Dedication Ceremony Anita was honored at her house by all the children, staff and some board members on the occasion of her 27th birthday. Anita with some of her girls. 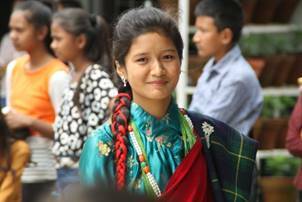 Anita Mahato grew up quickly and despite not being so much older than many of the children of NOH has earned enormous respect, adulation, and affection from them all. The NOH family has along the way attracted the very best. Anita came to us at 16, quiet, shy and dedicated to learning and helping anyway that she could; she never rested, and by that and her innate understanding of our children has served and lived in ways many wish to pattern their lives after. 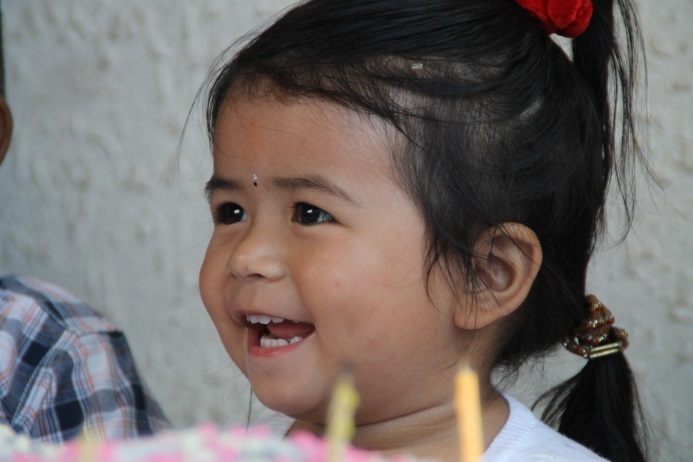 On Sunday our Hope Angel turns four. It seems quite hard to imagine. She has become, by her own words, “a big girl now”. 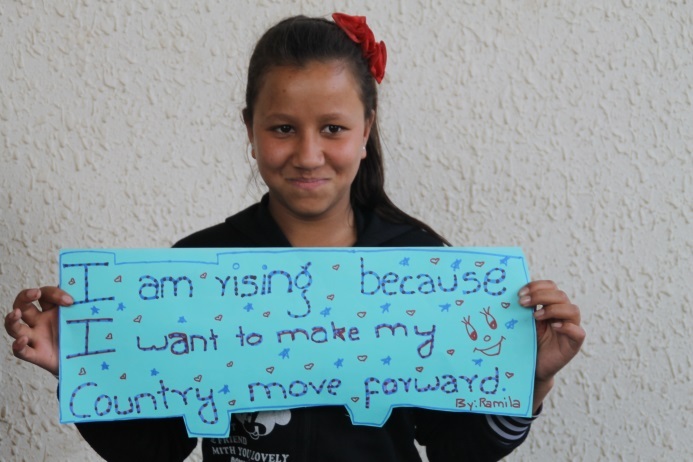 She is a girl full of ideas and the determination to see them through. Till then, the best to you from the NOH family. The Chelsea Education and Community Center’s new building has turned the last corner and is headed for the finish line. We will soon be entering the decorative stage and have already begun to seek furnishings that will accommodate the growing population and diverse offerings. 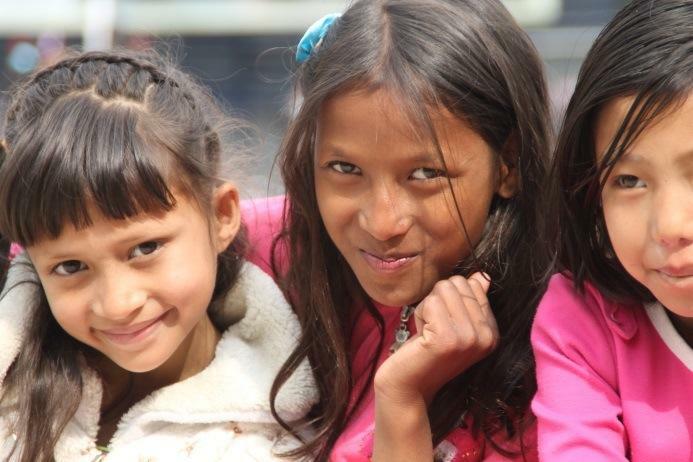 Members of the Nepal Orphans Home Board of Directors and Advisors, those who are able, will be arriving in Kathmandu in mid April for a week’s worth of meetings and an opening ceremony on the 22nd. 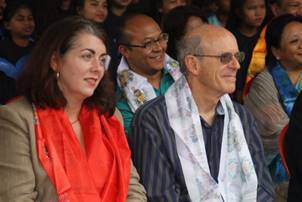 We have invited the US Ambassador to Nepal and a few Nepali dignitaries who have come to know our work well, and a Representative of the Foundation that made the creation of this building possible. 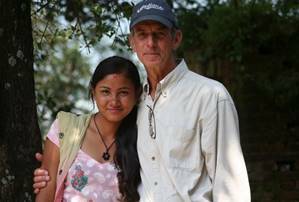 It is going to be a very proud moment in the 12-year history of Nepal Orphans Home, and a particularly poignant day in the life of Board Member Glenn Detrick of Washington University as we honor his late daughter Chelsea for whom the Chelsea Center’s concept and building are named. Before the festivities began we spoke about the meaning of family, of Thanksgiving, about the purity of heart, and the intrinsic nature of our souls and to always keep this as our guide. Then we began to have some fun. We sat in a large circle before we began the yoga and spoke about the meaning of Thanksgiving, asked everyone to hold hands and turning to one another tell them what it is about them that they loved. In the spirit of Thanksgiving a few donors gave generously for our feast, allowing us the purchase of apple pie, carrot cake and banana bread from a phenomenal, recently opened, bakery. In addition we had a vegetarian meal of rice, vegetables, apple stuffing, and mushroom gravy. In December we had the children in each house vote on the one person who they felt showed exemplary character all year long, the one person whose existence in their house made their lives richer for it. 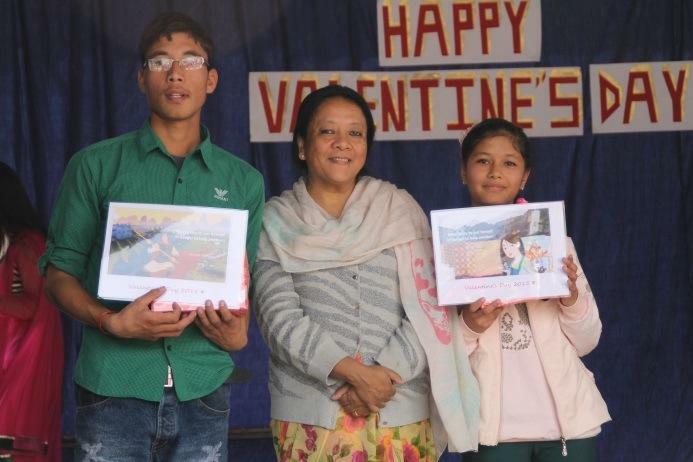 The winners received exquisite quilts made by our friend and artist Silke Steuxner. 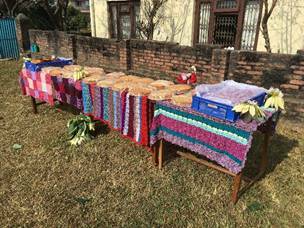 Silke has made these for our children many years running, and they are very highly valued by our children. Please visit her website www.silketouchquilting.com to learn more about her. 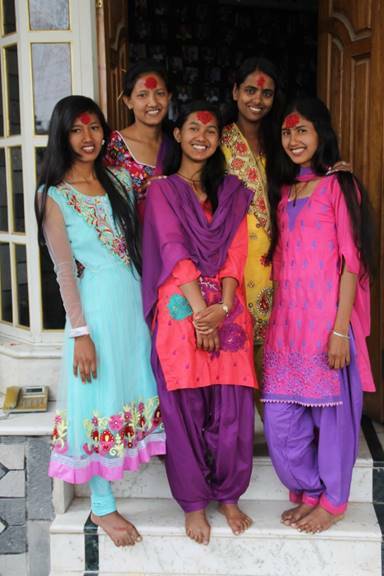 Tilak, Anita, Juna, and Bhumika were the chosen ones. Four of the beautiful quilts sent by Silke this year. 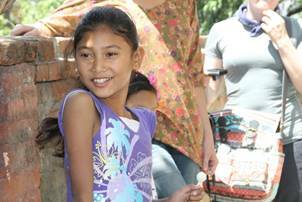 For several years a German filmmaker and our friend Susan Gluth had been making a documentary on Urmila Chaudhary, one of our first daughters when we opened our homes in the Dang district for rescued Kamlaris. 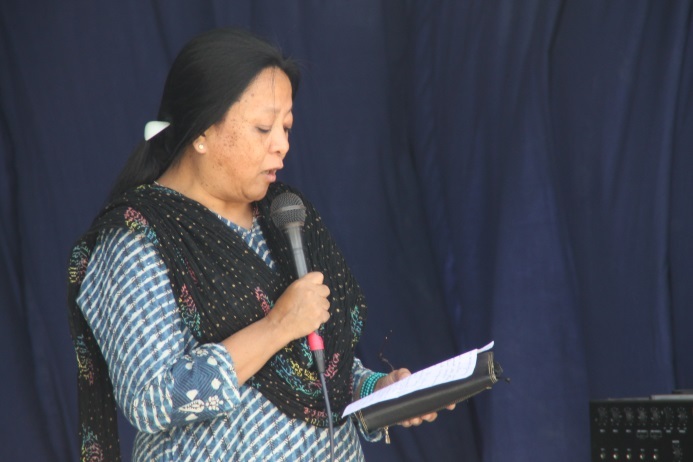 Urmila has received quite a bit of notoriety over the years with a biographical book and subsequent book tours across Germany all the while keeping her work as President of the Freed Kamlari Association and her continued education foremost in her life. 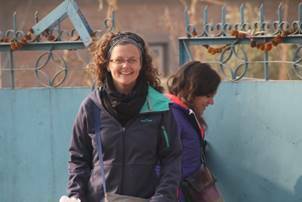 Susan’s film was accepted into the Kathmandu International Mountain Film Festival and had its Nepali premiere on December 10th. 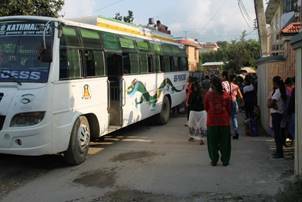 We housed and provided transportation for 30 former Kamlari for their time in Kathmandu. Susan’s film won. 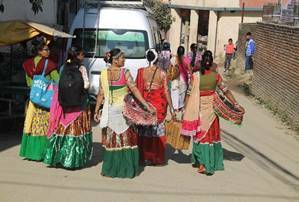 Wearing their cultural (Tharu) dress these young women became as strong as they were beautiful. 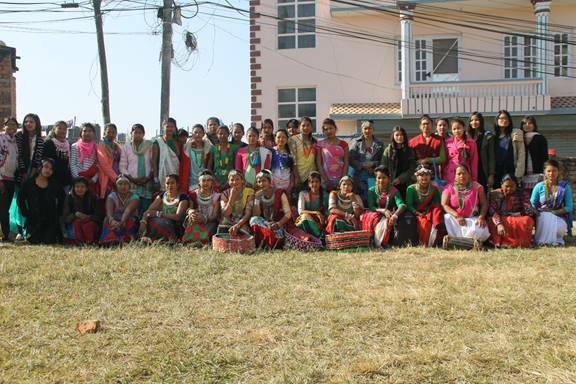 Around 70 of our daughters are former Kamlari, each a role model for me. 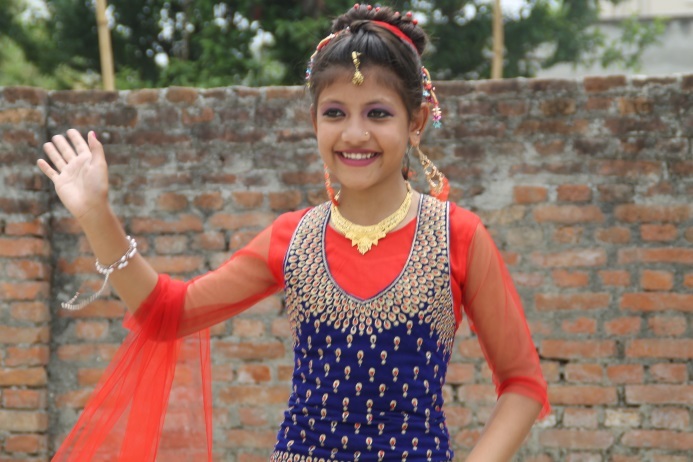 I was informed that when the film ended you could hear a pin drop, then from the back of the theater doors opened, and in these beautiful girls proudly marched to the stage and stood for a moment, surrounding Urmila, they then did Namaste and left to an emotional and thunderous applause. 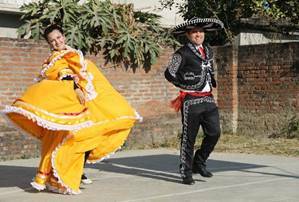 One Saturday we had a group of people from Mexico come to entertain us in a fun-filled, professionally done, and interactive ninety minutes. 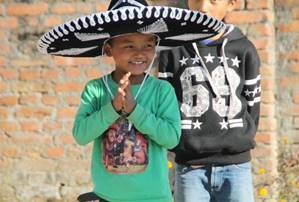 The kids learned a lot about Mexico. 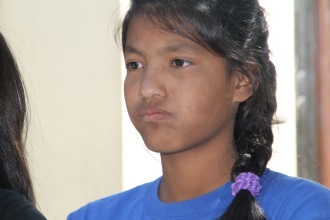 Sanjeep was one of the younger children trying to do the “Mexican Yell” taught by one of the troupe’s males. 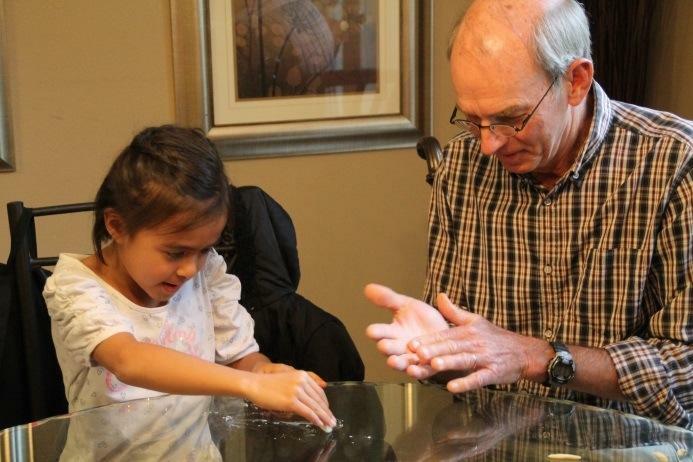 It is deceptively difficult, but very entertaining when performed by small children. Christmas Eve, hot chocolate, photos spanning 11 years appearing like apparitions on the wall, carols half sung then sputtering to hums before a new one whose first line was well rehearsed, the joy of the moment and joy in anticipation of the many pleasant hours to follow that have become our Christmas Eve traditions. 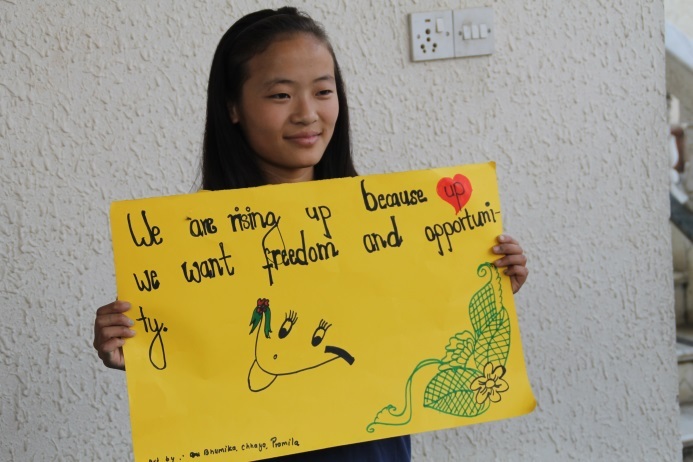 A simple message from our kids to the world, fitting in this time of agonizing intolerance and xenophobia. 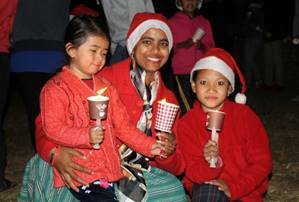 The parents of one of our volunteers, Mackenzie Perras of Canada, wished to do something special for the children and thus a trip to the Cinema Hall was organized. Upon arrival the kids found that the complete theater sat in wait and we were offered our choice of one of seven films to watch. The children had a great time and will long remember the day. Thank you very much Mr. and Mrs. Perras for this gift and the deeper gift of Mackenzie who is fondly remembered by our children and staff. 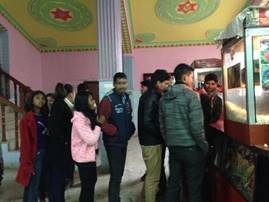 We have been supporting the school and a hot lunch program for the teachers and students, and the English teachers’ salaries for the past 7 years. 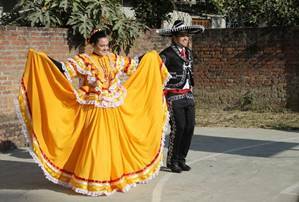 On February 17th there will be a ceremony for the opening of the new school. 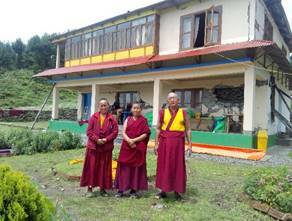 The Head Lama and assistants of the Bigu Monastery. Four of the 80 nuns at Bigu. 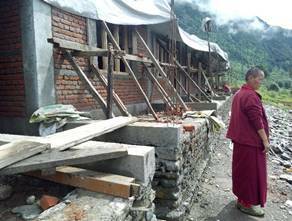 NOH has had a many year commitment with funds and volunteers with this Monastery. 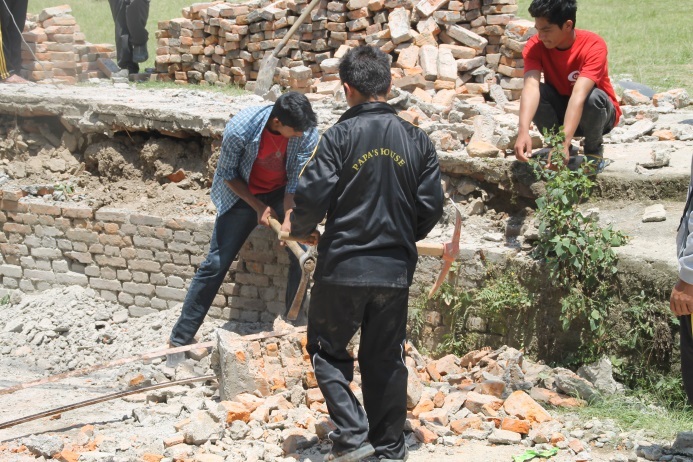 Presently we are helping to support the rebuilding of their completely devastated campus. 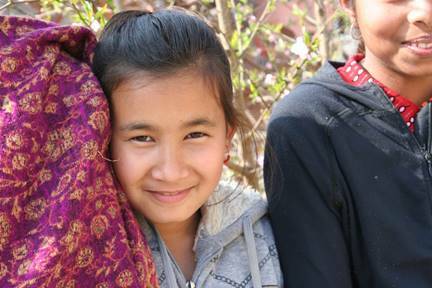 NOH has provided salary, sometimes food, and education support for over two years. 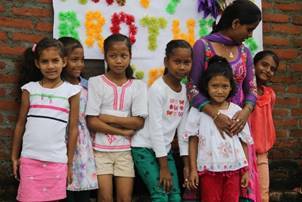 The children shown here wearing new Christmas clothes. 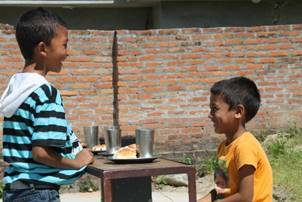 One of our sons Rabindra has made it his job to check on them twice a week and while so doing he spends hours helping with their homework, talking with the children, bringing them special treats and sharing life. Easing the pain, cost of medications, and trying to give some fun and comfort for terminally ill children. 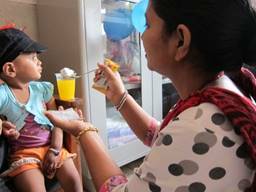 NOH continues to supply terminally ill children in the cancer ward at Kanti Hospital with fresh fruit and food treats twice a week. 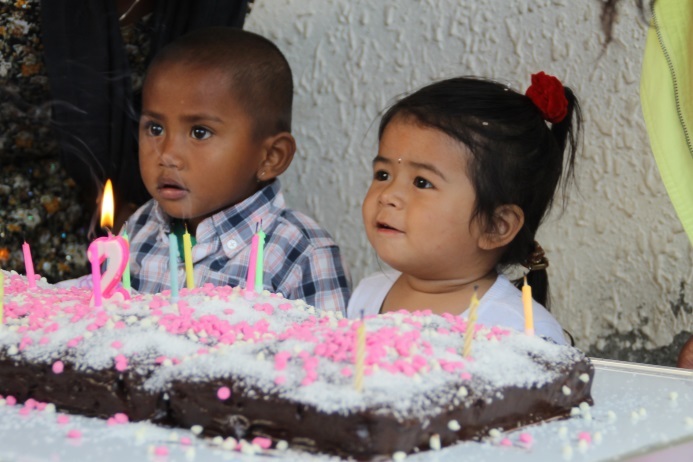 Birthdays of the children are celebrated, complete with birthday cake, candles, presents, balloons and sweets. 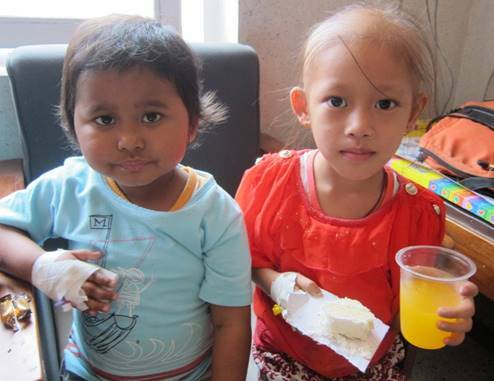 Support (generally for pain medications) is provided for poor families who cannot afford the medical costs. 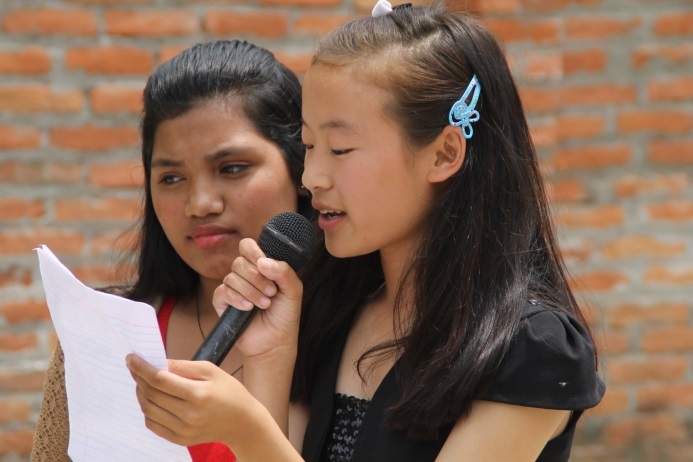 These are some of the outreach programs that NOH is committed to serving. In our area there are many people being helped with the cost of medical, educational, shelter, and food issues. We are very proud of our support to so many, and are deeply grateful to the donors who make it possible. 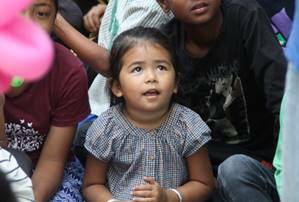 In a recent essay the children were asked, “If God came to you and said you may ask anything that you wished to know the absolute truth about, what would you ask?” Below are some of their questions. God, why did you put people only on earth? God, where does our soul go when we die? God, why can’t I watch movies all the time? God, how many hairs are on my head? God, why are people jealous of one another? God, where were you born? God, why do children die? God, my parents wanted a son, why did you make me a girl? God, why is there discrimination? God, why do poor people have so many more problems? God, is there any real right and wrong? God, are you in control of everything? God, why did you let my parents give birth to me and then you took them from me? God, why make women carry babies for 9 months, you could have made it for 1 day? God, in whose image are we made? Some people are ugly and others beautiful. God, when will I die? God, why did you make Hell? God, why do white people make problems for black people? God, why don’t you appear? God, what are your plans for me? God, why don’t humans use more than 10% of their brain? God, why are people never satisfied? God, why did you make different planets? God, why am I afraid to fall in love? 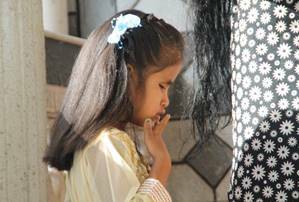 God, will we ever meet our beloved ones who have died? God, will you give me back my mother who you took when I was still nursing? God, why do rich people take poor people’s children as servants? God, why did you give animals smaller brains? These essays opened some doors to the children’s thoughts that have been warmly invaluable to me. I have said goodbye to a daughter. 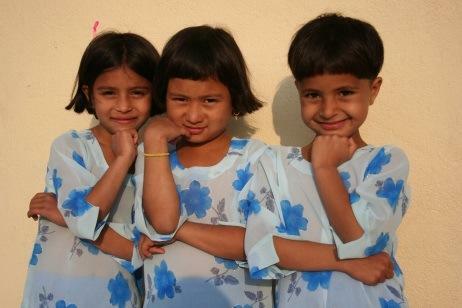 In 2007 NOH asked those involved in rescuing the Kamlari why all the girls were sold again after being rescued and they said it was because there were no shelters for them. 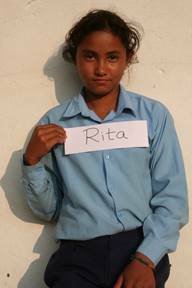 So we opened two homes in the district where selling girls (from the age of seven) was most prevalent, Rita was in the first fifty girls that we took in. These girls will always be very special to me. 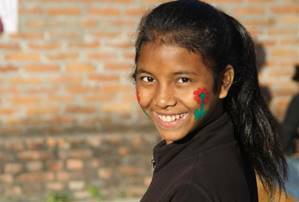 As sometimes happens when our children go back to their village during the month-long October holiday, Rita met a young man and fell in love. That was three years ago, Two years ago they found their affection had deepened, and this last year they had a religious ceremony to unite body and soul. Rita returned after the holiday without saying anything about this. Then one day after Christmas we sat down together and reminiscent from the scene in “Fiddler on The Roof” when the Papa says goodbye to his daughter, with the song “Little Bird” playing in my head, Rita told me that she was married and wished to return to her village and live with him. I gave her my blessing, happy for the joy in her eyes, but sad for the uphill battle, though steeped in love, that will become their life. A few days later her newly minted husband arrived from an all-night bus ride and collected his young wife. He is a good boy and has been working hard to ready a home for them; Rita is a good girl. They are in love. I slipped some money into her bag while she said her goodbyes. Then I walked them to the gate and swung it open to their future together. I gave Rita a hug; she was crying. Her husband struggled to lift Rita’s much too large bag containing ten years of her life at Papa’s House, and then walk awkwardly by its burden out onto the road where they will find an indifferent old bus to hurry them on board and ferry them, the God of busses willing, fourteen hours to a very poor village to scratch out a life together. Hope will become four years old on April 30th. 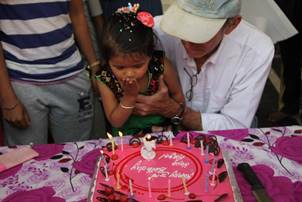 Every moment of her life has been a gift to me, every development the best yet and of late they are coming fast. Then last week when the time came for her to go with Anita to the classroom and for her and I to say goodbye, Hope announced that we could leave, “Papa you go do your work and make my tiffin and Mama you go home and come back, I will walk myself to my classroom” in sight but some distance away. She insisted on this and then took her back pack, slipped it over her shoulders, gave us kisses and turned on her heel and walked away. We of course followed every step of her journey over this threshold into being a “big girl”, she turned once about halfway and waved without breaking stride, and then again when she reached the classroom door. 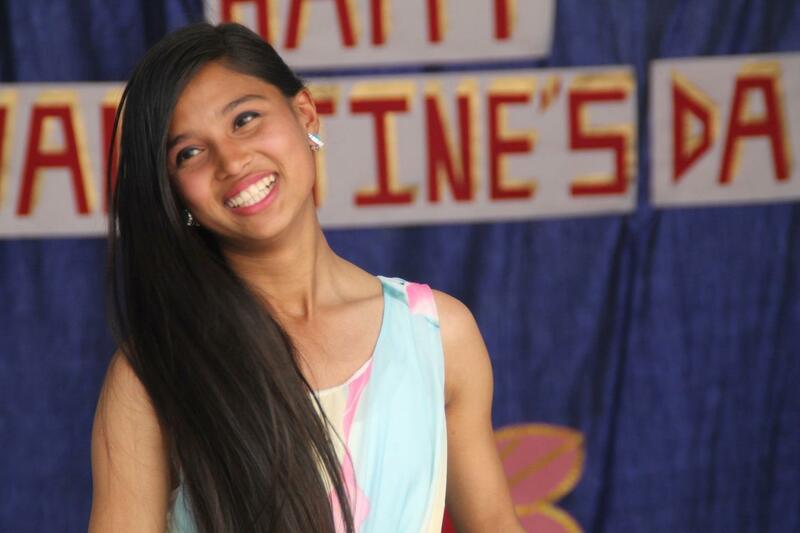 I remember a few years ago when Hope made her first solo walk, on Valentine’s Day, of 20’ to my excited arms and unbelieving eyes, her smile so large and her hug so strong, she knew what she had accomplished so unexpectedly. Now I watch her walk away alone to her classroom. These are the moments we bring up many times as our children become adults, perhaps even more so then to compensate for the loss of their youth. Hope is more insistent upon walking unaided and accepting stumbles with a slightly weary “I am fine,” as she gets up. She walks up and down stairs alone though with me near, and has been trying jumping from very small heights. Some of her insights are remarkable and now she questions everything until she has been satisfied with your answer. She likes to sit in front of me on the scooter where she will start it up and then be in charge of the horn and alerting me to things I should be aware of. 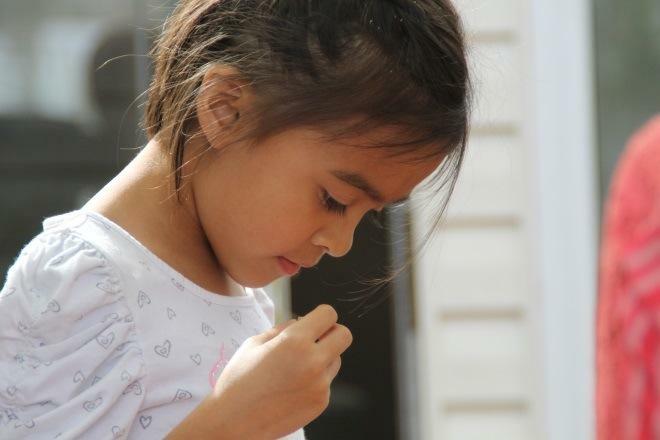 For some reason I am occasionally startled to see how my little baby girl has grown up. The third story of Passages is one for NOH. 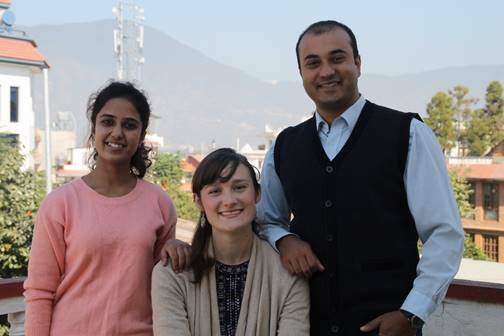 The consistent reader will remember Sanjeev Dahal who I introduced in the last update, along with our Director of the Chelsea Center Hillary and our new Director of Communications for Volunteer Nepal Shreya. These three folks have been working hard with a dedication rarely seen, and the skills to ensure performance. 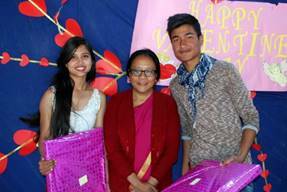 Along with them Mrs. Pandey has been sharing the directorship of our Outreach Program and Volunteer Nepal, and Anita Mahato whose thoughts on issues pertaining to the children and other managers I have always highly valued, have in combination, made life very smooth. I had planned to retire in the fall. I have for a few years wished to spend a few months each year in America with Hope and being able to get to know my grandchildren better than I do now, and while in Nepal to have the time away from the desk to be with the children, help where they need it, keep them thinking with writing essays, talking, continuing my Friday night suppers for five, cooking Saturday tiffins, maybe trying some teaching; anything and everything I can think of to do to encourage their self-reliance, instill them with confidence, help them to believe in themselves, and to see the beauty and good in everything, even what is on the surface bad. Above all I wish to have the time with each child to ensure they feel the love of a parent as I was fortunate enough to have. In their recent essay a few have asked, “Why did you take my parents from me when I was small?” Some have stated that God must not care about them to have done that. This sense of loss and bewilderment touches me deeply, I wish that no child feel this and perhaps this is the reason for what I began some time ago. We have evolved to the point where we are doing a lot of wonderful things for many communities and individuals, but in doing so I have had less time to be a dedicated Papa to our children, and I do not wish my life to be consumed by administration any longer. 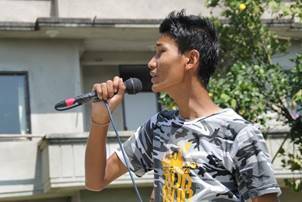 Effective on January first Sanjeev Dahal has been handed the baton and is now the Director of Operations for Nepal Orphans Home. Anita Mahato is now the Director of Managers for NOH and sees to it that the children’s needs and schedules are met and as she has for the last two years she will continue to dole out the funds necessary for the managers to buy the daily needs of the children and be keeper of the daily log for it. What we have become makes a huge difference in the lives of several hundred individuals every day, but it has also led me astray from being the best Father, Papa and Grandfather that I could be. I will be available if ever called upon by Sanjeev, and will continue in my efforts to raise funds, raise good children, and write about the kids. 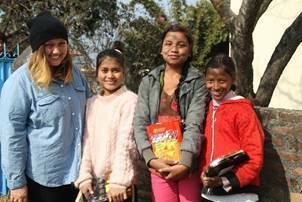 With the talent that has been assembled I can say with conviction the very best days of Nepal Orphans Home, the Chelsea Center, our Outreach Programs and our Volunteer Program lay ahead, and I will return to the children. How precious, kind and compassionate our children are. I have learned so much about the meaning of life, how to live a better life, and how to rise above the damage done by other troubled souls. These children, not by words, but by their way of life, are little prophets one and all who make it easy to believe that one’s own life can bring remarkable change in a world that is abundantly lopsided in its equality. The making of men and women. 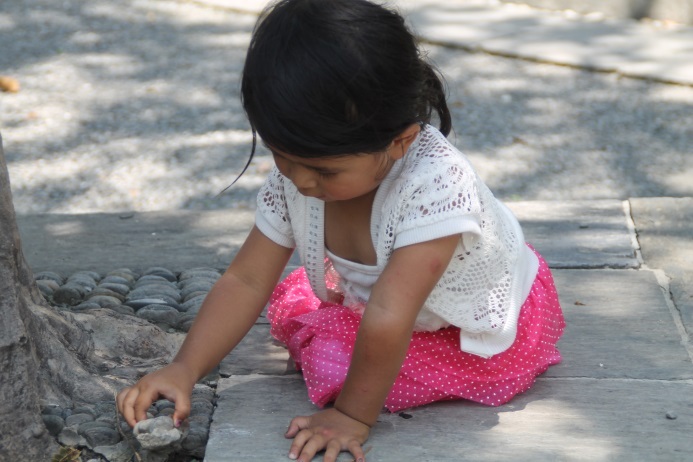 Something that everyone who visits the homes of NOH will remark upon is how close a relationship the children have. 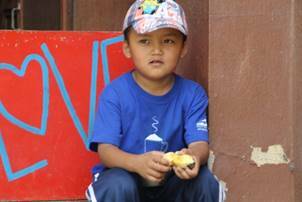 Our older children are always available to play, talk with and listen to the youngest children. They know how to share the moments, to be inclusive, and to feel what their brothers and sisters are feeling. They know when to play the fool and when to take seriously the mood of the moment of the little ones; you will as often see our teenagers hanging out with our smallest children as you will see them with each other. 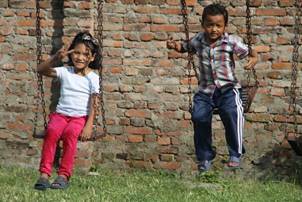 Our older children help to make Nepal Orphans Home a happy and nurturing place for us all to grow up in. Our new Chelsea Education and Community Center has once again resumed a pace which will allow the opening of its doors by early spring. The month of October is a holy month and work is slowed to between a crawl and nonexistent. The building is going to provide a space where individuals will recognize their potential and have the guidance and tools to achieve personal greatness. Education is the key to all that is important to the human endeavor, and here its collective energy is ushering in a dynamic change in our community. 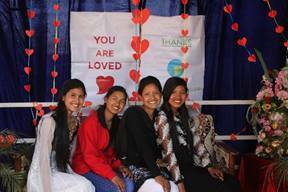 Parbati, Tara, Minu, Sabitri, and Sabina make up our Women’s Council. These women bring to the task a combination of experience and tradition, the spirit of young women yearning to be heard and those who straddle both. They meet with our Chelsea staff every Friday afternoon to discuss the CECC and our community. 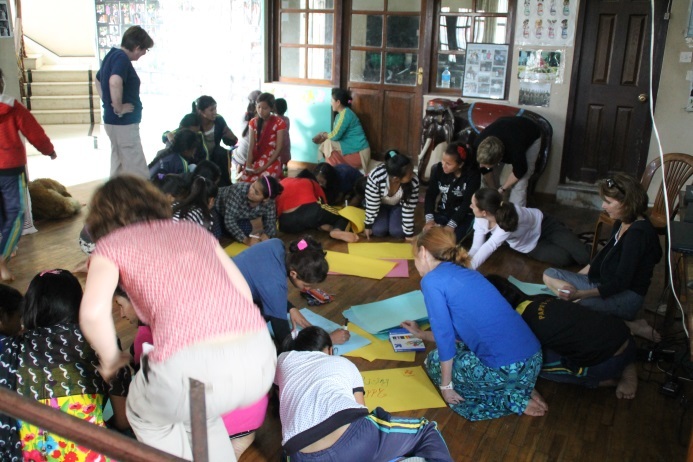 They suggest workshops that they feel would be helpful or enlightening, and discuss ways in which the community might better serve the individual and how we might play a small part in making our world a bit more just and equitable. 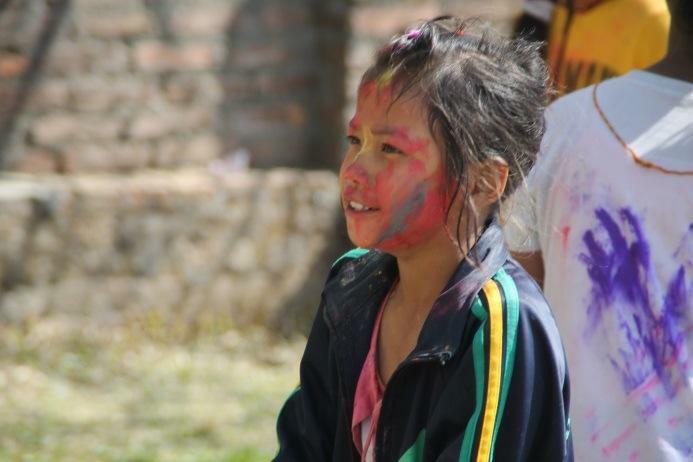 The NOH Outreach means a great deal to the staff, our children, and the Board members of Nepal Orphans Home. We are very proud of the dedication to this and the result thereof. 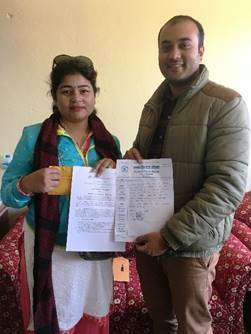 Sanjeev Dahal shown here with support money and an agreement with Mrs. Mina Thapa who is the founder and director of Mother-Sister Nepal, an NGO serving the women of remote Sindhupalchowk as well as caring for children who lost both parents in the earthquakes of 2015. 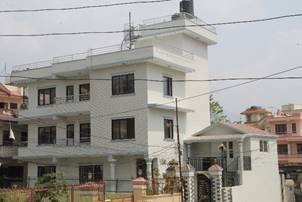 This is one of two orphanages that would not be able to provide optimum care for the children if it were not for our help. Our work here varies. 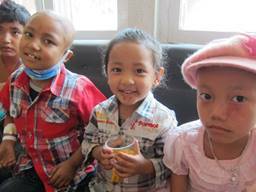 In some months we are able to grant wishes to the children such as the one described in the last update. 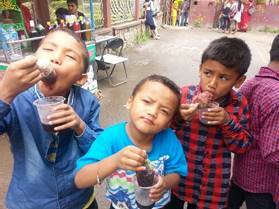 In addition, Saroj and Himal, two of our college and post college boys, work in this outreach program, and have been taking children who are feeling well enough out to fun places for the day. We also help when needed with buying pain medications, chemo treatments, and necessary testing. 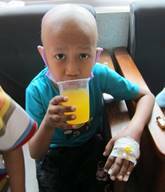 These occurrences are when children’s parents have absolutely no means to provide any sort of medical treatment. Without prepayment for medical care the service is not given. 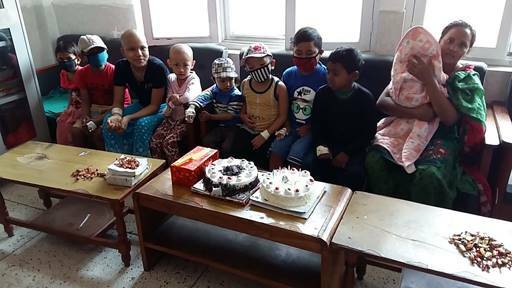 We also celebrate a lot of birthdays with the children and provide enough cakes, balloons, and other treats to turn the ward very festive. 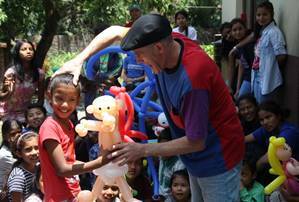 Early last month we arranged for “Clowns without Borders” to put on an afternoon performance attended by most of the hospital. 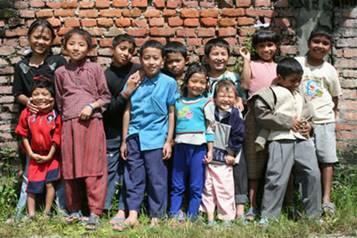 The village of Dhumrikhaka is an area where NOH has been helping for the past 7-8 years. 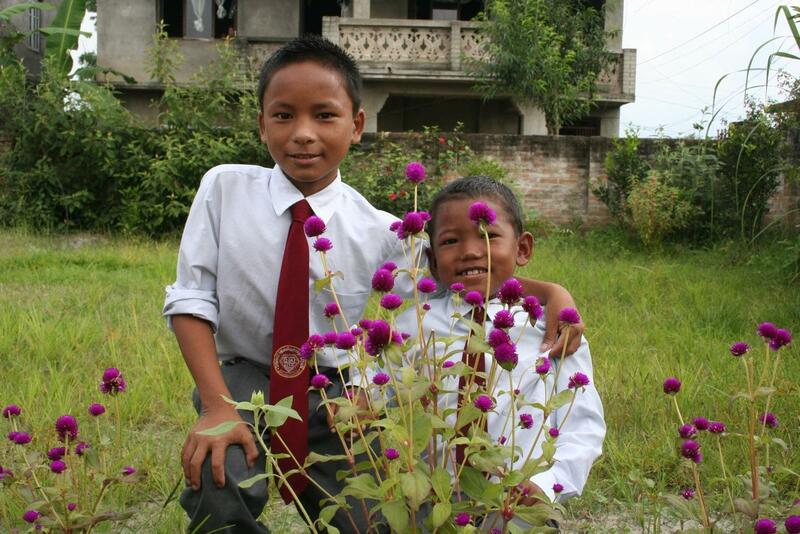 Their school was heavily damaged in the first earthquake, but then completely lost in the second one two weeks later. The village sits two and a half hours’ hike (for the young) up a very steep mountain. It is a small village of very limited means. 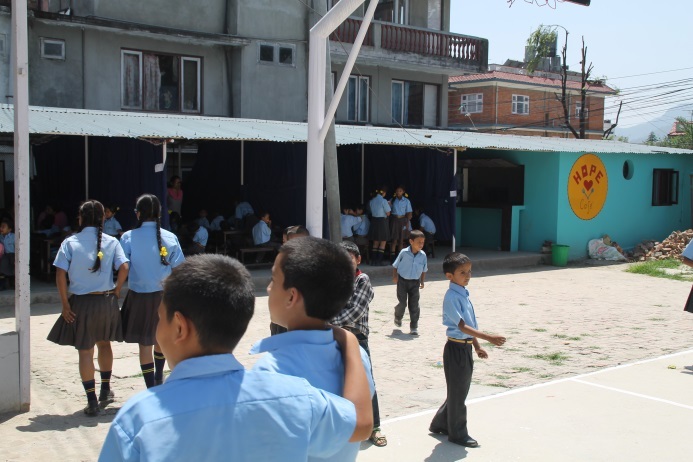 We have supported the school there with teacher salaries and a hot lunch program for the 80 to 100 (on average) students in the school. This is also a very popular destination for our volunteers. The people are lovely. Life there is exasperatingly difficult. 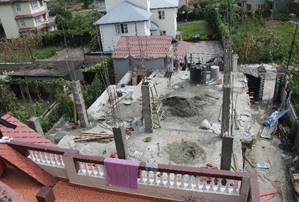 If you were curious by the construction timeline, it is because they have so little water available that mixing concrete has to have water set aside over a period of time before they can do it. We have encouraged the village elders to get a price on having water delivered from a boring down below using lift stations; this would provide all the water needs of each household in the village from a single tap. We will do our best to pay for having this done in the next few months. 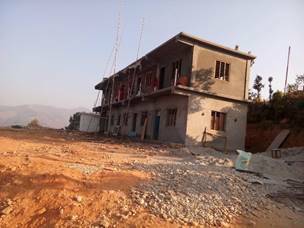 NOH is building the school and we are hopeful now to have a completion ceremony in April in time for the start of the new school year. The destruction was complete in the earthquake. They lost every building save the one in the above photo which sustained severe damage. 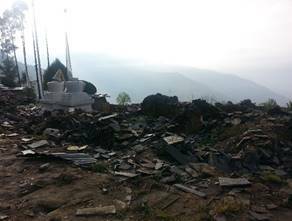 Immediately after the quake, NOH provided emergency funds for tents, blankets and food. 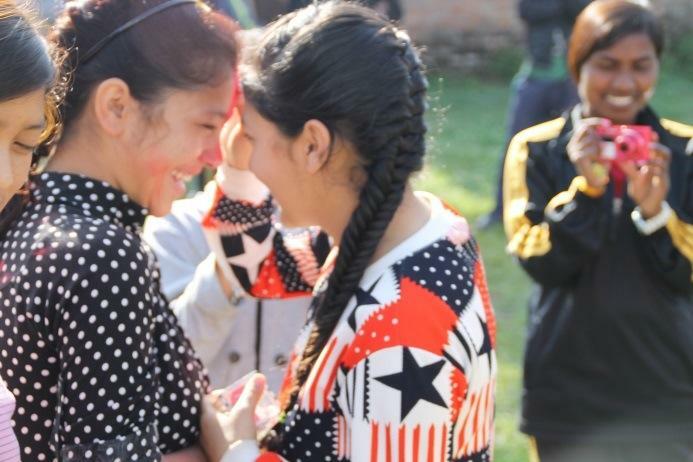 Then after a plan was decided upon and they wished to move everyone to Kathmandu, NOH was there for them. Now is the time when all have returned and construction is going on quickly in an attempt to get under shelter before the snow flies. 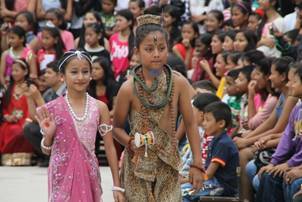 NOH has committed a substantial amount of money for the construction. 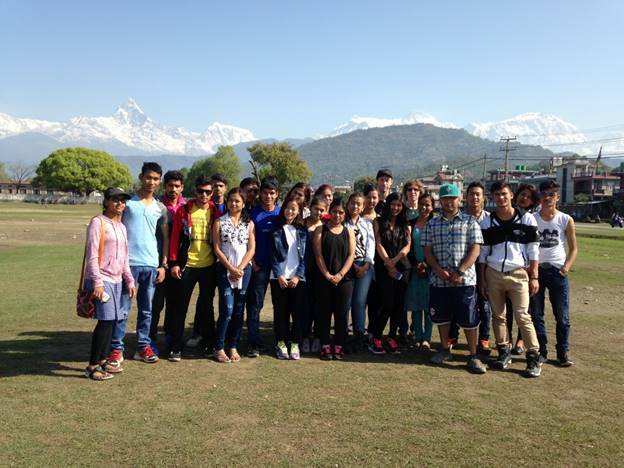 Bigu sits on a mountain top, a bus ride and two days’ hike from Kathmandu. It is a very spiritual place and a favorite also of our volunteers who teach, help with maintenance, or work in the gardens or kitchen. 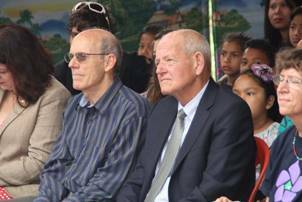 Several years ago my son had his wedding performed by the Lama and attended by all the nuns, from seven years of age to eighty years old. 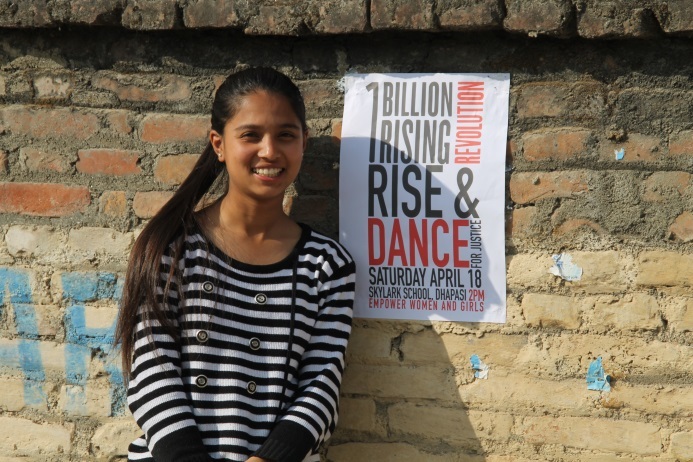 NOH has been involved with Bigu for seven years now and we look forward to our next generation carrying on with it. 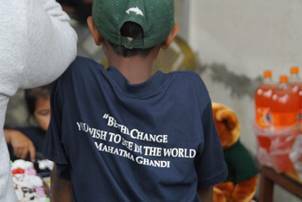 These are a few of our ongoing outreach programs which we believe strongly in. In our newsletter you will have been introduced to these wonderful new hires. They are exceptional people with hearts set on making a difference in the lives of many. 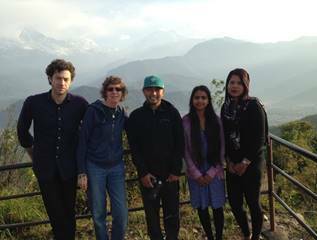 Shreya is our Volunteer Nepal Communications Director, Hillary has been hired to be the Director of our Chelsea Education and Community Center, and Sanjeev is our new Director of Education and Outreach Programs. 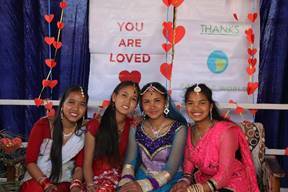 This was the 4th annual “Sisters Day” celebration which happened on September 17th. The program is completely put on by the boys and includes a fine meal that they have prepared and served for all the girls. 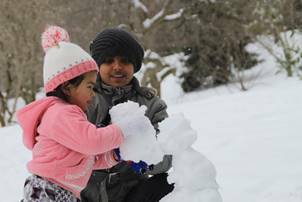 It is an occasion which further galvanizes our family’s togetherness and helps make it a little smaller with the blessings from all the boys to all the girls. 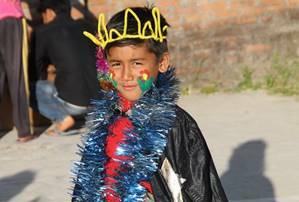 Tihar is a five-day festival with each day honoring a different deity. The third day honors dogs. 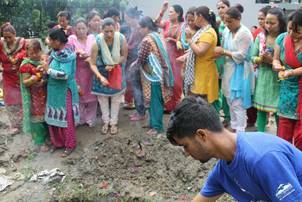 The fourth day honors cows and is called Laxmi Puja. 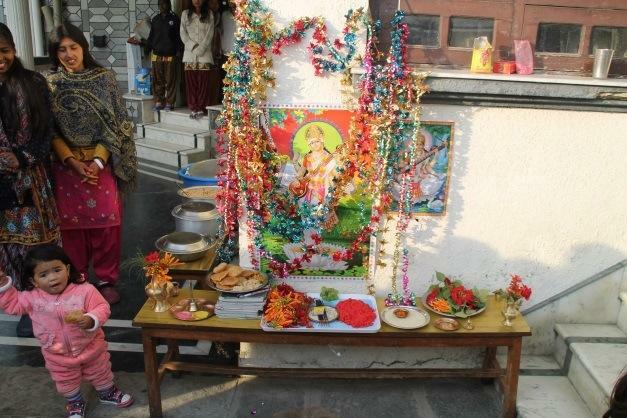 The Goddess Laxmi will come to every house and business to bring wealth to it in the following year. 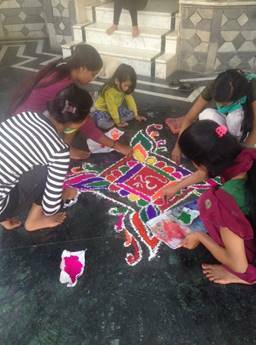 Mandalas are created by the entrance and painted footsteps lead to the house’s interior Puja room. 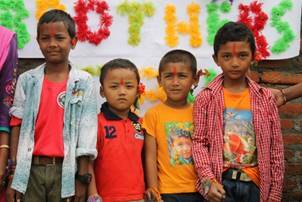 During Tihar the fifth day is when brothers are honored. 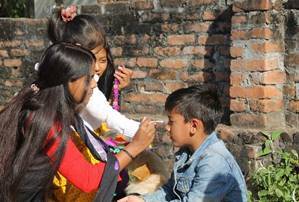 They receive flowered “mallas" and carefully applied Tikas from all the girls, then in return they offer the same to their sisters. After this the first meal of the day is broken together. 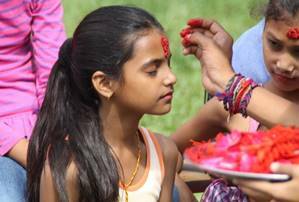 Dashain is a period of reverence that spans three weeks. There are certain days within that are sacred, and on these days families come together in ritual. 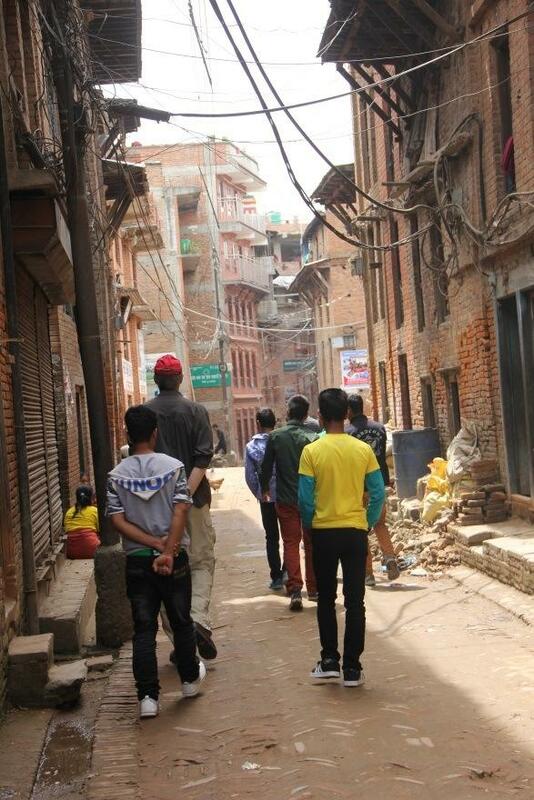 Kathmandu is a ghost town for a few lovely days as most return to their village birth place. 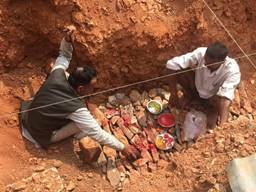 On Tika day a banquet is prepared the day before. 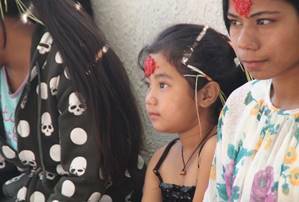 In the morning the women all bathe and do Puja alone, and then all the children gather to receive a blessing. 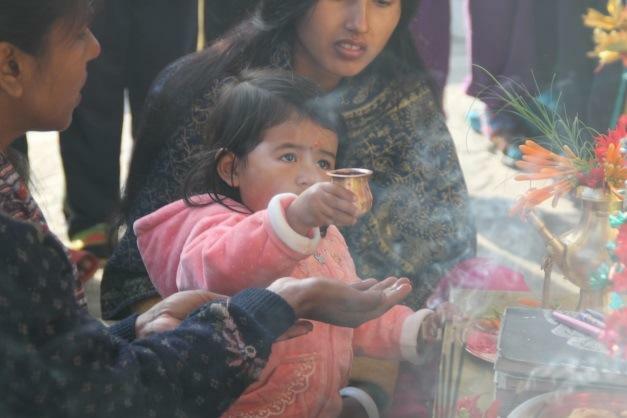 The elder is the first to offer Tika, and a blessing to every person younger, which in my case is most of Kathmandu. This then is followed by our senior staff. 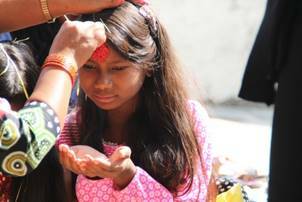 In addition to the Tika and separate blessings to each member you also apply “Jamala” a special type of wheat grown for this occasion only, into the hair. When all is done the banquet is served and after that the day quiets down to walks and resting. Each community will erect a “Ping” three very tall bamboo pieces forming a tripod from which a heavy rope and swing is attached. 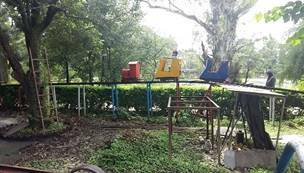 Children play on these for several days leading up to “Tika” day but at sunset on that day these are removed for the year. 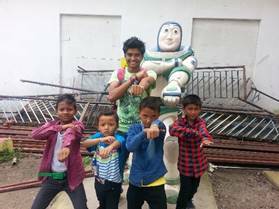 Suman, Sanjiv, Davit, and Sandip, the fabulous four enjoying a day at the Kathmandu fun park courtesy of our elder son Saroj, who is also a part-time manager in their house. 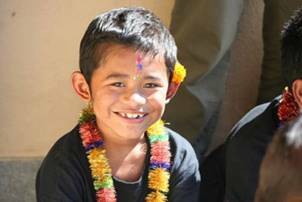 Saroj and his sister Sangita were the first two children of NOH. 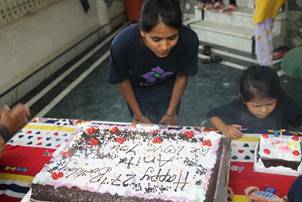 Sangita is now 25 and living on her own while Saroj at 22 is an all-around help with the outreach department, volunteer department and co-manager of the boys. 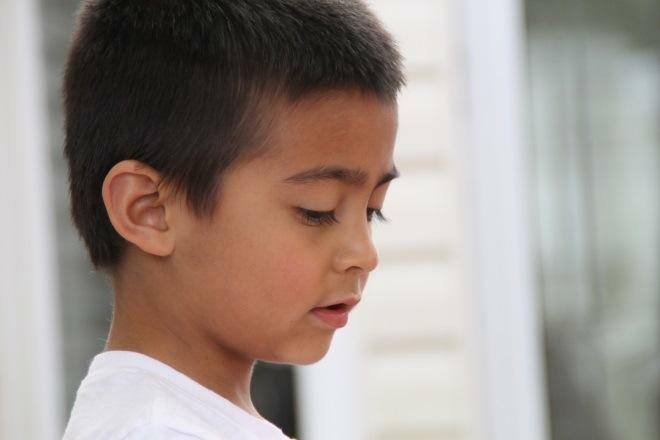 I think he is one of several of our children who will lead the next generation of work done by NOH. 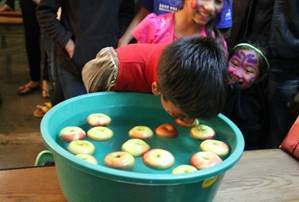 With deep gratitude to Hillary and volunteers Amanda and Romina, the kids had a very active and fun Halloween party. 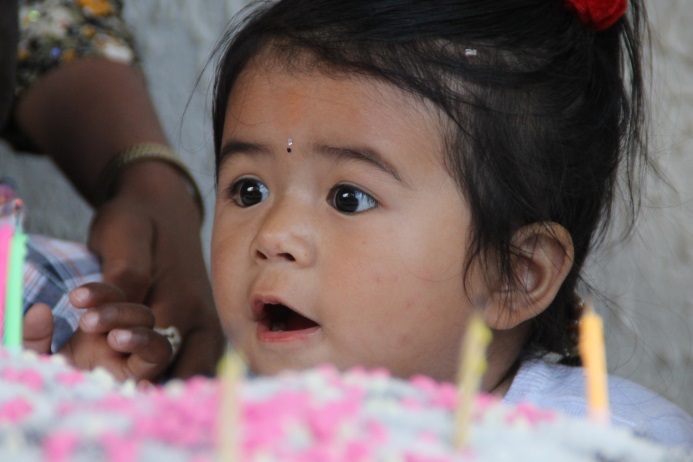 I think we had the only jack-o-lantern-worthy pumpkin in Nepal. Manisha, tongue in cheek, making the “trick or treat” rounds. 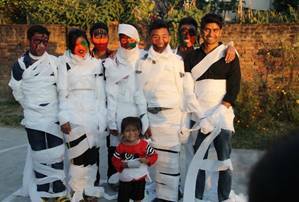 A “mummy”-making contest And the mummies. Then Hillary led a brave young group in learning “The Monster Mash” while Hope tried to keep up. Hope has brought us all heightened sensitivities. Being around her leads us to recognize our own potential and strengthens our resolve to be better people and to work hard to acquire the skills necessary to make a difference with our lives, and to know that it does matter. 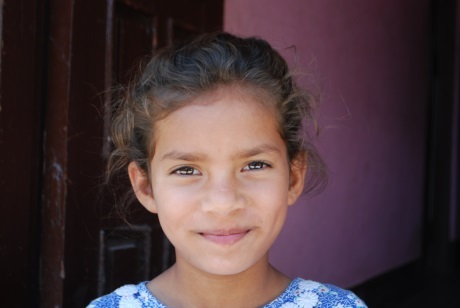 Every morning Hope stands next to me to welcome each of her sisters and brothers as they enter the school gate, and I have learned that in the blue moon when I am not present she stands alone to do so. Hope has been patient with my tendency to hover around her in protection, but lately she is asking me to give her space and allow her to fall, just like others do. It has been the hardest lesson for me coming from her, but I have witnessed that she recognizes her abilities and is as careful as the situation demands it to be. Most importantly I am allowing her the requested space to grow. We will soon be celebrating Thanksgiving. I have been quietly making this our most significant celebration of the year. Last year the nation was held in siege by politics that closed the border to trade and thus we had fire wood only with which to cook and nothing to cook beyond rice and dhal. 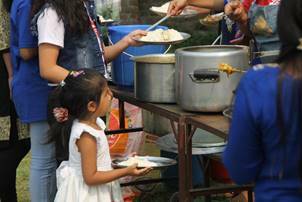 Last year, in advance of Thanksgiving, a couple of donors contributed towards a memorable feast; as it turned out, what we lacked in food was made up for with sharing our feelings. So this year we still have last year’s contributions and some new ones and the day will long be remembered as much for the meal as for the reflection of what abundant blessings each one of us has to be thankful for. 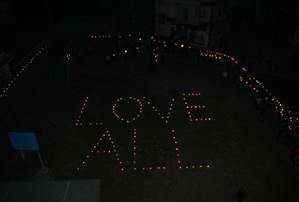 I hope that your own Thanksgiving brings with it the appreciation of pure love for one another. 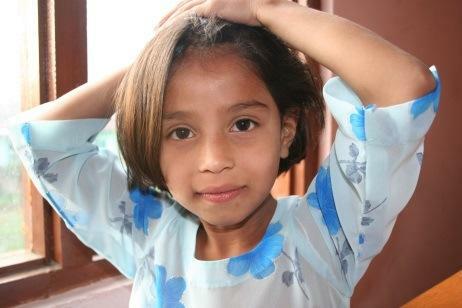 ​11 years ago, a child alone, bereft of hope, my inspiration. Now, full of Hope. NOH received a grant in 2015 to construct its own facility for our Chelsea Education and Community Center. In the June update I wrote about the center. 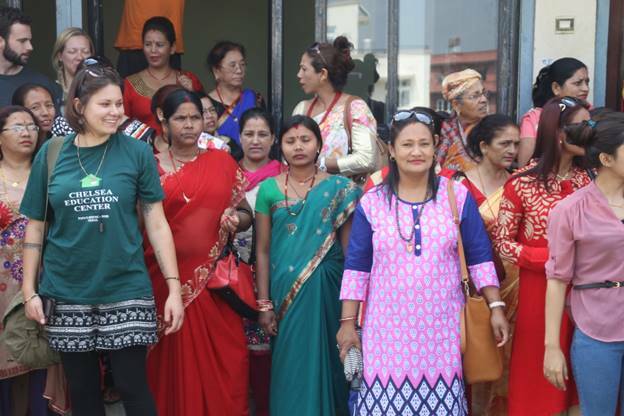 In 2015 we opened the doors to the women of Dhapasi to attend free classes in English, Math, Nepali and computers. 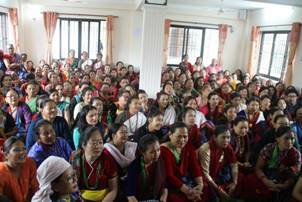 As of this writing we have 250+ women attending daily classes. The women attend from 10am until 3pm with an average of five classes simultaneously in session. 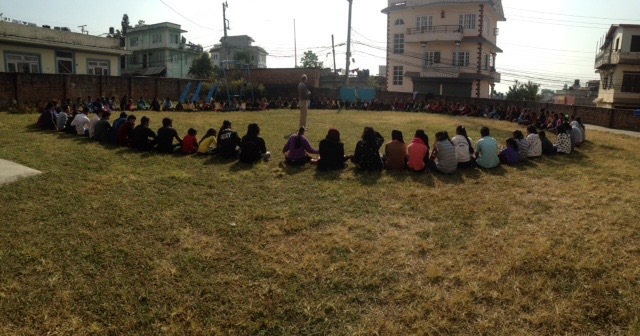 We had a ceremony to bless the ground and building on July 20th, eight days after site work had begun, attended by many of our students and teachers. 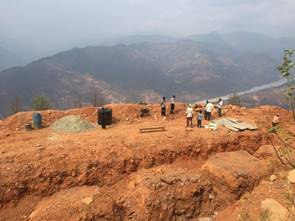 The monsoon season is a tricky time to begin a project like this and it has indeed hampered our progress, but as of August 11th we were almost out of the ground and will begin to make up time. 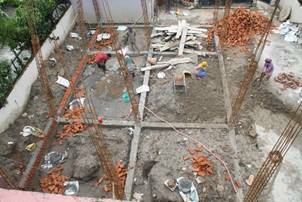 We are building a foundation which begins 5’ below ground level and has many tie beams strengthening the structure. The photos below show the progress of three weeks. 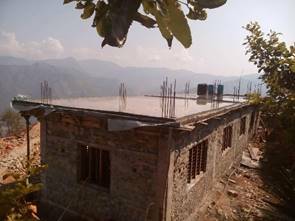 In stark contrast to our Chelsea Center is the school we are building in Ramechhap, also mentioned in June’s update. There the problem is they have so little water that mixing cement is not possible for days. 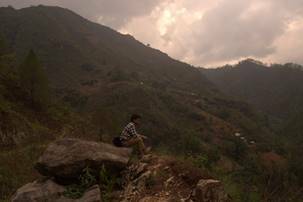 The ability to collect rain water to use is nonexistent as the rains keep skirting this hill (mountain) top village. I will have new photos of that in our next update. 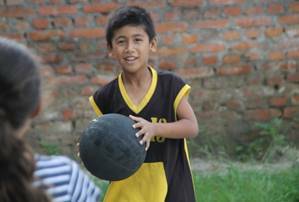 Every morning a group of children from different homes will meet just before 5 and walk, run, practice Taekwondo, or play basketball. 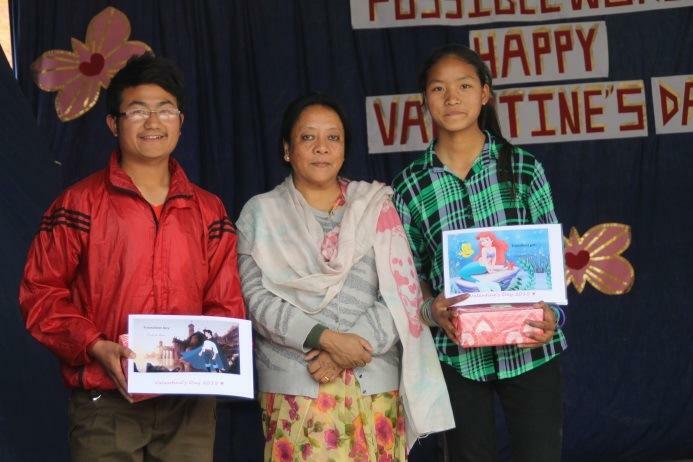 One of those with me is Asmita, 2nd from left in left photo being honored for her school work, and above. 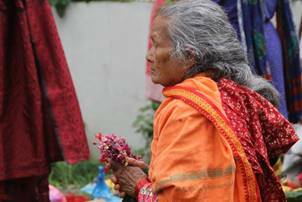 One morning we had passed an elderly woman sitting along the road side, I did not think too much about it and kept walking. 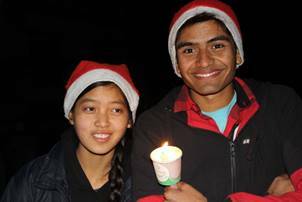 As we were about to make a sharp turn on our path I noticed Asmita was not with us. It is dark at that hour, but when I scanned the distance behind us I saw her escorting the elderly lady. 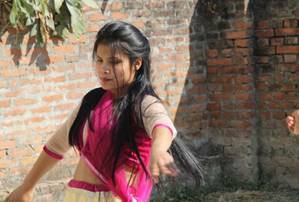 The pace of the older woman was such that Asmita had fallen way behind. 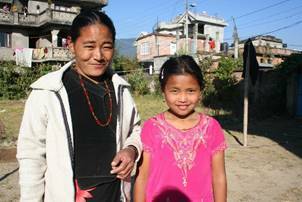 The woman needed support as she walked and Asmita provided it all the way to the woman’s house which was on our route but some distance ahead. I could hear Asmita chatting amiably with the woman, calming her and perhaps flooding her with memories of her own daughter long ago. 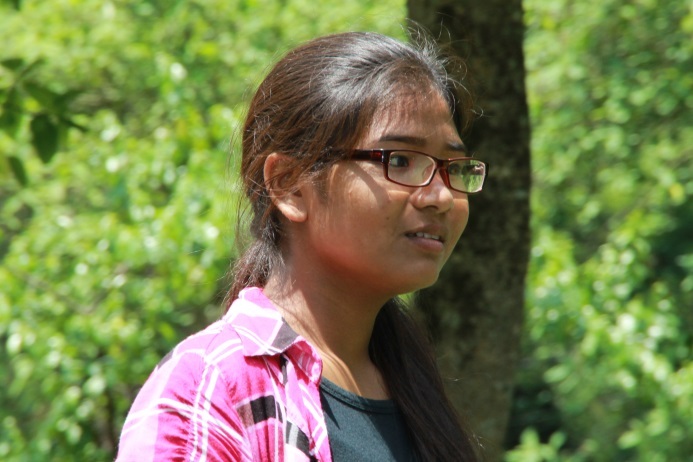 Unlike me, Asmita had stopped and asked the woman if she was okay and the woman replied that she could not walk the rest of the way home alone. 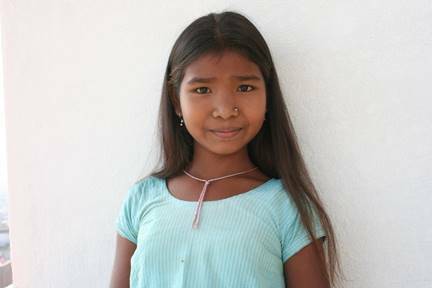 Asmita has been with us for 7 years, one half of her life. 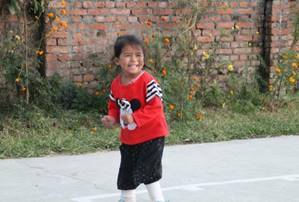 She is always cheerful and works very hard at school finishing in the top three each term. I was very proud of her for doing this. 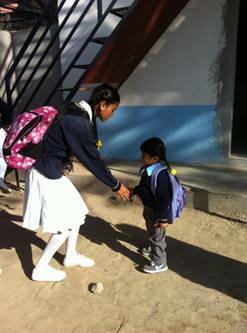 It is not uncommon at all to find our children quietly helping others. 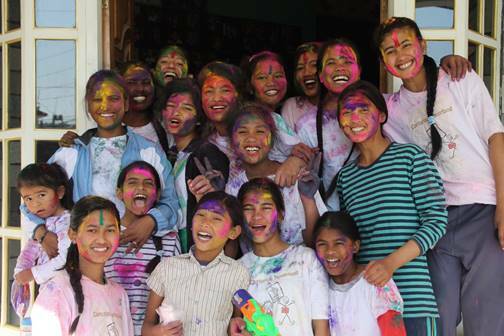 On July 31st we sent 12 more children off to college. 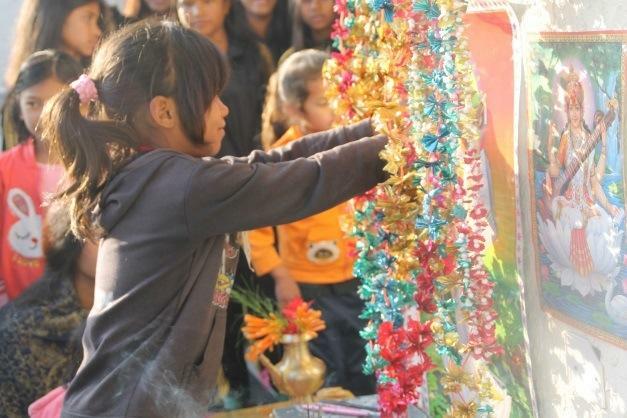 As we do each year, we gather with them to offer our blessings and give them a tika, and as the weather does every year it rained. School begins at 6am and as they have to walk about two miles, so we had the ceremony at 5am. This year’s 12 did very well on their School Leaving Exams with the highest scoring a 3.6 GPA and the lowest a 2.8 GPA. So now we have 24 children attending college and two in university. 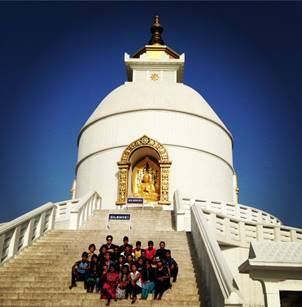 As a congratulatory gesture and to have the children gain some more exposure to life, we arranged for two of our managers and these 12 children to go to Pokhara, a destination of choice among anyone you might ask anywhere in Nepal. 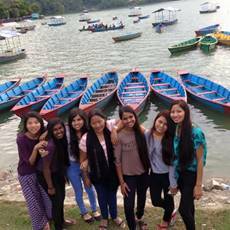 Pokhara is called the Switzerland of Nepal, mist-covered lakes with majestic mountains on their edge rising craggily into the clouds. 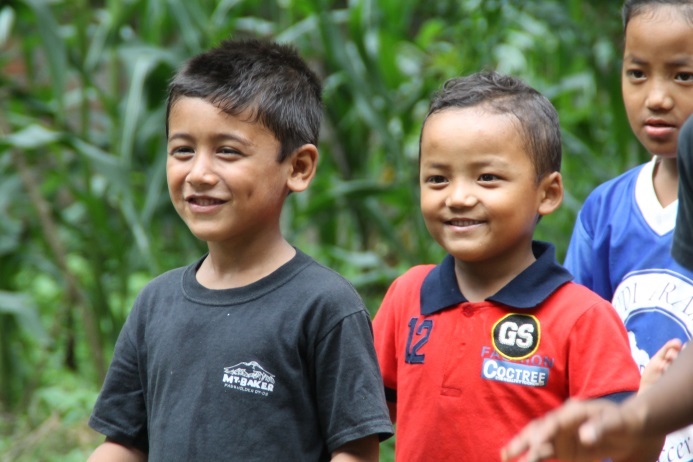 They spent four days exploring; everything they did was a new experience for them and they returned seeming a little worldlier and deeply appreciative. 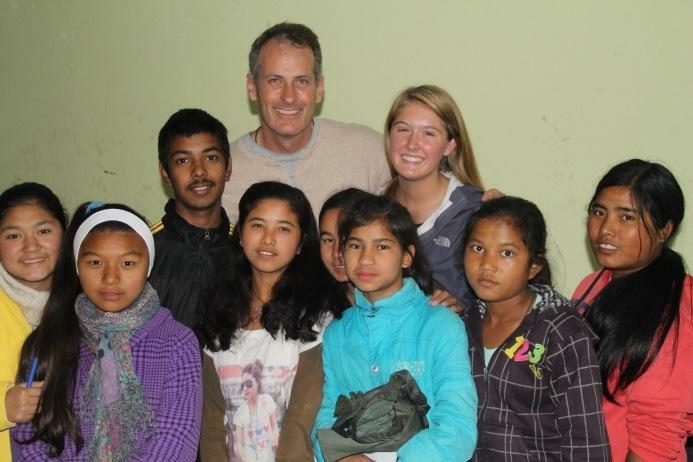 After last year’s earthquake we accepted Sarita (far left). 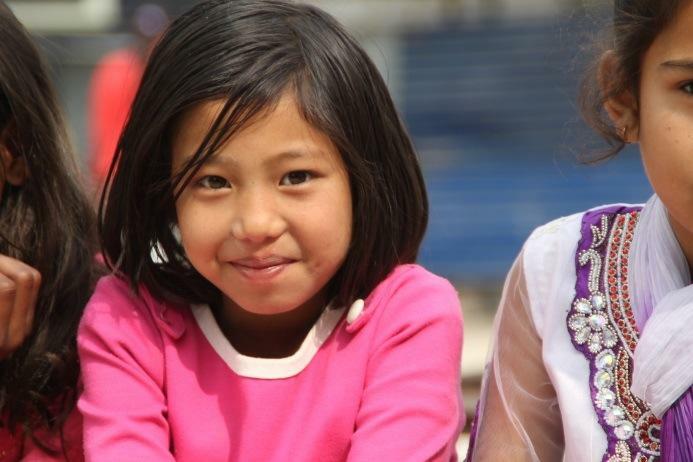 She has been a joy to have around; she is quiet and a little shy, but quick with a smile. She is a good student who has learned English very quickly. 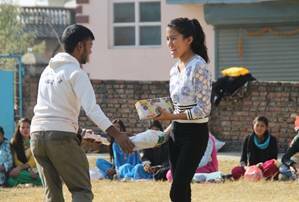 In addition we had brother and sister Samita and Sanjeep delivered last year at the exact moment the earthquake occurred. 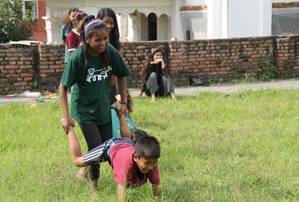 They too have brought a lot of fun to the family, serious students but with a welcomed amount of mischievousness from Sanjeep. 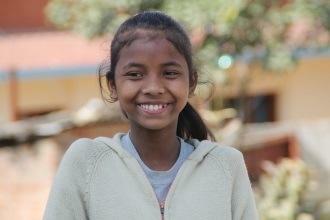 Samita is also a faithful walker with me every morning. 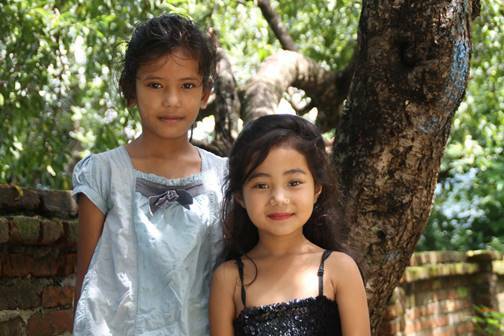 In the last couple months we have welcomed Ranjhana on the left and Manisha on the right. 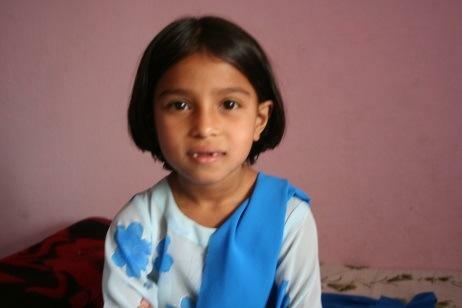 Manisha came to us just three weeks ago; she is 6 and has charmed all her house mates. 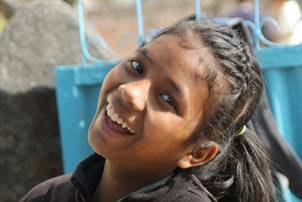 Ranjhana is quiet and very polite; she has become part of an inseparable group of girls in her home. It is heartbreaking to find children in the situations that demand help; we are fortunate to have the type of donor support that allows us to bring them into our family where they thrive in an environment of kindness and well being. Some leaders are born to it. This is Hope at school. 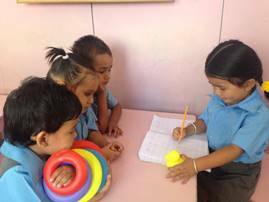 She attends Nursery Class each morning for a few hours, and as these photos display she thinks that she is the teacher’s assistant. In her first ever exam she finished rather quickly, put her pencil down, called the teacher’s attention to it and then got up and walked around the room helping others who seemed to be having trouble. The concept of this being a test of an individual’s knowledge seemed less important to her then making sure the students understood. Her exceptional teacher, seen standing just past Hope in the second photo has been charmed into submission by Hope; then again I believe we all have. On August 7th we marked the three year anniversary of Hopes coming home to us. 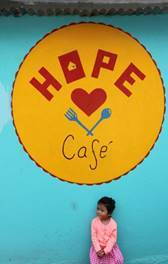 Hope has received donations over the years and has only used a small portion of them. So we use the “Hope Fund” to help other children with medical needs. I am working on making a website for her. The website will be part of the NOH website. Her website, once built, may use what you see below as a logo. I welcome comments and ideas on the logo. 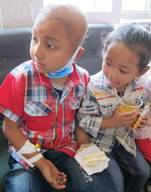 Our Hope Fund continues to help the sick and disabled. Sometimes this is heart wrenching and brings us closer to the mysteries of life and death, and in some cases brings pause in the belief that there is a higher order to life. 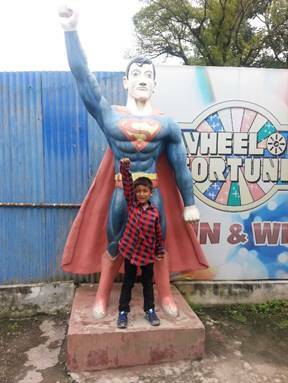 Yesterday an eight year old boy received his wish, a remote controlled helicopter. Sadly his wish was only the day before informed. He is being sent home now, the medical options for him exhausted. He is no longer ambulatory and speaking is difficult, but he can sit with help and his face and searching eyes are an ocean of thought and emotion. His very loving father sat behind him on the bed propping him up against his chest when a very large remote controlled helicopter was presented. The boy smiled at it, his eyes caressed every part of the gift, and his father too smiled, feeling his son’s momentary departure from the misery of dying. The helicopter was started up and the blades sent a gentle breeze fluttering the boys eyes, widened at the sight of potential for what the helicopter can do. The father and mother soon after carried the boy and his helicopter from the ward to go home. In my daydream I see the father and his son sitting in their yard, his son propped against him, a brilliantly blue sky with wisps of fluffy white clouds sailing through as the father sends the helicopter above them to his son’s delight and as it rises higher and higher the son will close his eyes and let go to follow the helicopter to a place peaceful and free of anxiety, pain, and sadness. 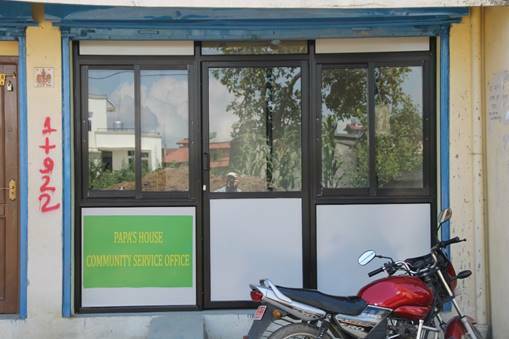 Nepal Orphans Home has just opened an office in our Chelsea Center to handle all our outreach programs. 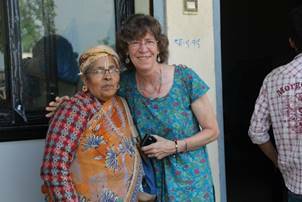 Present staff are doubling up; using the office full time is Mrs. Pandey who also serves as manager of our volunteer program under director Eileen Witham. 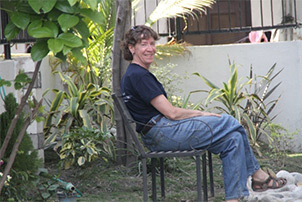 Merging our staff in these related endeavors has increased our capacity and performance in the care of many projects. 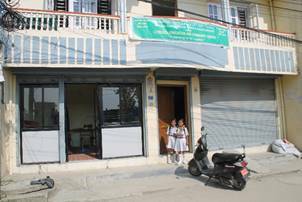 Below are photos of the new office and the Shoe and Tailoring shops run by our children as independent contractors. And that’s the way it is for August 13th, 2016. 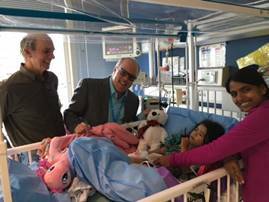 In late January Hope, Anita and I flew to America where Shriners Children’s Hospital in Boston had accepted her as a patient. Shriners would be a great model for how the planet should work. Phenomenal medical personnel, incredible attention to detail and bedside care beyond belief. Everyone on “Hope’s Team” deserves special mention, but the head of it all, Bernadette Hannigan, will never be forgotten. 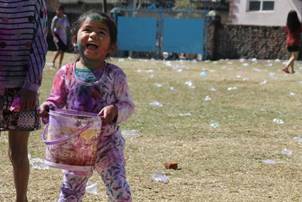 This was an occasion to marvel once again at Hope, a little girl who has never once complained about her situation, who makes do with enthusiasm and smiles for every challenge before her. For Anita and me, the thought of Hope enduring all that an operation entails flooded our thoughts with anguish as the day approached. Shriners’ staff knows a parent’s anxiety and has polished their craft to eliminating it in the way they relate to the patient. The morning of the operation filled us with dread; for Hope, she was simply enjoying her morning as we drove to the hospital with her stomach empty; she did not question her rising in the dark, why she missed her morning bottle or complain about her hunger or departure from routine. Anita had done a remarkable job of letting Hope know everything about this trip and allowing her to be free of concern. Once in the hospital things move swiftly while surgeons and anesthesiologist, nurses and nurse practitioners all come to brief you and entertain Hope. 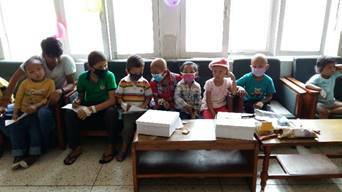 The anesthesiologists, two of them, brought in the mask that they would use and had Hope pick out some scents she liked to cake the inside with. They explained to us their methodology to eliminate as much post-operative pain and grogginess as possible by using an ultrasound to locate a vein and induce a blocker, and, along with the surgeon’s visit, it all helped to eliminate any fear we had. But still. We were instructed to put a gown on Hope and ourselves, along with masks, as they were allowing us to wheel Hope into the OR as we requested. Suddenly it was time and people were pulling and pushing the gurney as we walked on either side talking to Hope who was sitting quietly taking it all in. Inside the OR the medical staff turned from what they were doing and started to entertain Hope with stuffed animals; before I knew it, the anesthesiologist from behind her gently placed the mask on Hope while we held her in a sitting position. She did not look confused or scared, and in just a moment she slumped down and was out. The staff then became business-oriented and asked us to kiss her and leave, their smiles kind and assuring us that she would be fine. The call came and we rushed to the recovery room; our little Angel had a massive cast to her thigh, one arm full of monitors and another with an IV needle heavily bandaged to keep it in place. Her eyes were closed. They positioned the gurney and a nursing staff began monitoring and adjusting with us on one side of the gurney. We began to call her name. We watched her eye lids flutter and soon they opened; she looked at us quizzically, then smiled weakly. In short order she asked for something to drink; the nurses listened for gurgling sounds in her and then okayed sips of juice. Maybe an hour’s time passed before they started disconnecting many monitors and prepared her to move to her room. My brother Bob arrived minutes later and took this first photo. 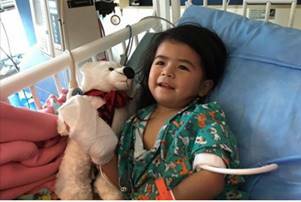 This is Hope, less than 2 hours out of surgery and her smile never faded despite restricted movements with her cast, fluids and monitors. Hope’s recovery was quick. After 5 weeks we were allowed to go to Connecticut to be fitted for new prosthetics; we worked with NEOPS whose staff led with their hearts in wishing to produce the best possible devices for Hope. We remained in Boston with my brother Bob and drove each time the 2.5 hour journey for her visits. One day the new prosthetics were done and we went to try them out. They brought them into one of the rooms and set them down before Hope who was quick to examine them closely. She particulary loved the feet with rubber toes. This was a touching 10 weeks with time spent with our families. My brothers Peter and Bob and sister in law Boo, my aunt Beth, uncle George, cousin Liz, my sons Jerry and Aaron and daughter-in-law Jo and my beautiful grandchildren; Kathy Procranik who was largely responsible for bringing Hope into our lives, and her husband Tony; Anita’s brother Vinod and sister in law Alecia, her parents and grandmother, all went out of their way to welcome and care for us on this journey. 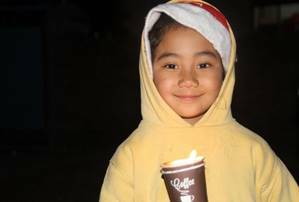 None of this would have happened if not for Margaret Ikeda, a pediatrician and family friend who made the application to Shriner’s in our behalf and spent a considerable amount of time and professional courtesy over six months of paperwork between herself and Shriners which made this all possible. In addition she arranged with Devon Bell, the prosthetics craftsman at NEOPS, to take Hope on as a patient, his youngest ever, which requires a whole new set of skills to accomplish. 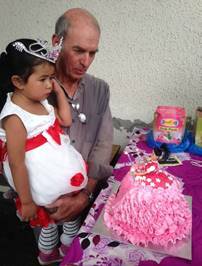 And finally to the donors who unsolicited had contributed to Hope’s care made this journey an outstanding success. We have left America with deepened relationships and many new friends as well. Thank you all. 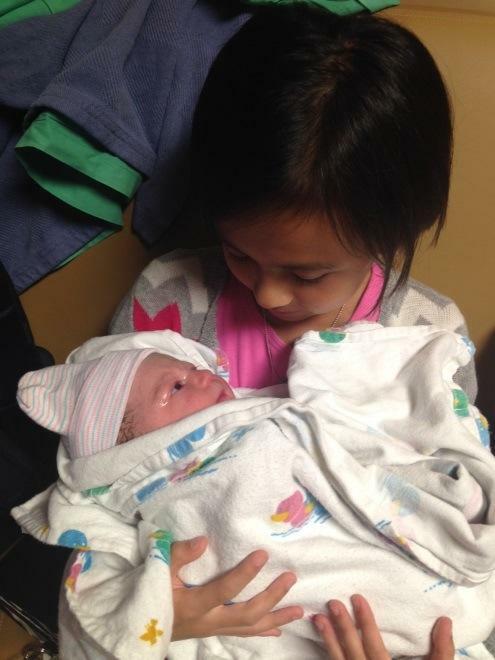 Arriving home and in the embrace of our children made the previous 10 weeks surreal. Hope had sharply increased her communication much to the astonishment of her brothers and sisters. She got swept up in a tide of attention and love. 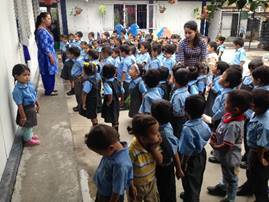 Our managers had done a splendid job of keeping the children safe and on schedule. They all proved their mettle, especially Sam who was in charge and whose hair was turning grey quicker than a new president’s. 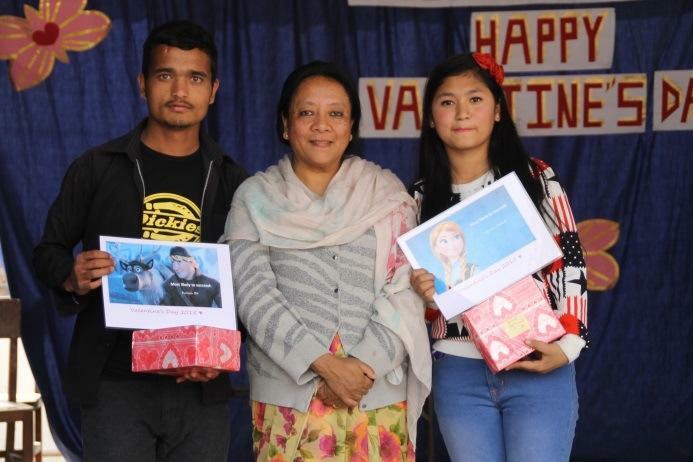 We missed many important occasions beginning with Valentine’s Day, produced once again by the staff of Volunteer Nepal with funding by Toni Thomson and her Possible Worlds of Canada NGO. Our children were voted by the school as the recipients of many of the superlatives. 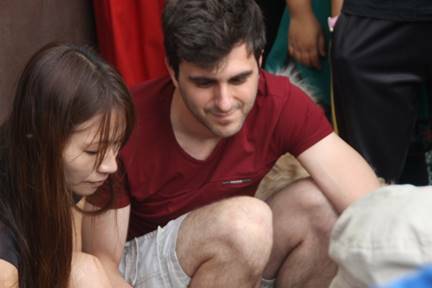 On May 17th Panos Karan and Fumiko Tanaka arrived after a few months of e-mail exchange. 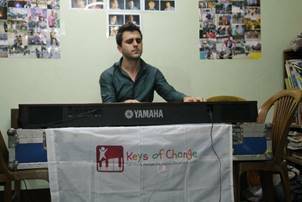 “Keys of Change” www.keysofchange.org is an NGO they started to bring classical music to underserved countries. Assembled on a dark and thundering day were 30 of our most musically interested children to listen to Panos play lots of Beethoven, and a Franz Liszt piece that commands all 88 keys. Panos has performed in over 50 countries in, as he said, “serious venues for serious people,” and decided it was time to have fun with his music and inspire children. During his 40 minute recital he instructed the children by telling stories in a very compelling way and asking them questions as he would finish a piece. There are many videos of Panos performing on YouTube, one recent one from April at Boston Symphony Hall with a youth orchestra from Japan that he has worked with since the tsunami and arranged for their trip to perform in Boston. 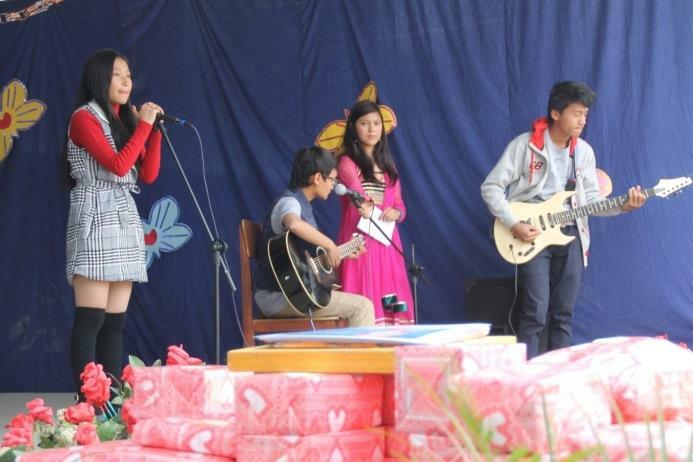 It is a moving performance. 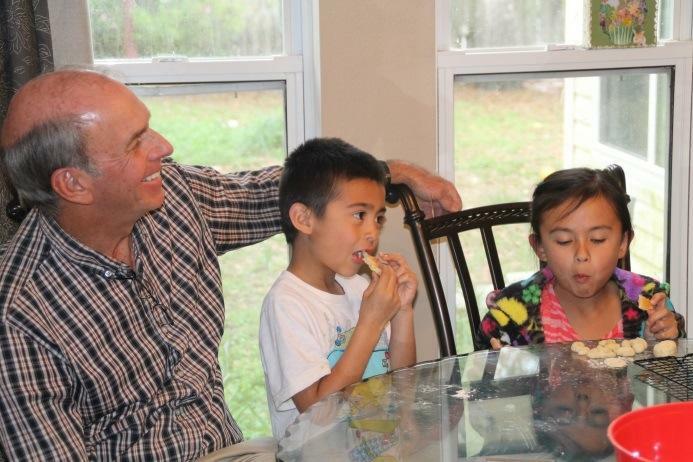 Panos and Fumiko returned to our home two Saturdays after to visit with our kids. They helped to serve lunch and clean up after. This is an amazing and highly accomplished young man who has and could continue to dazzle the musical world, but has chosen time out to inspire children. 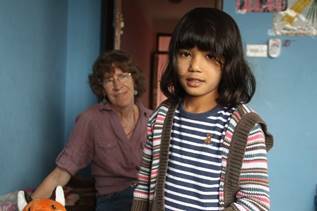 Nepal Orphans Home’s newest daughter Ranjana arrived in the middle of board member Carola Drosdeck’s 6 week presence. 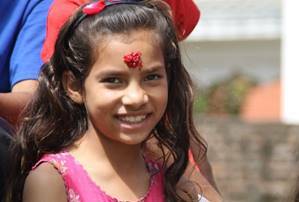 House manager Anita Chaudhary and I welcomed Ranjana at the gate to our home and then Carola and Anita took over, cleaned her up, made her comfortable in her room, helped her pick out new clothes and walked her to school to meet her brothers and sisters for lunch. 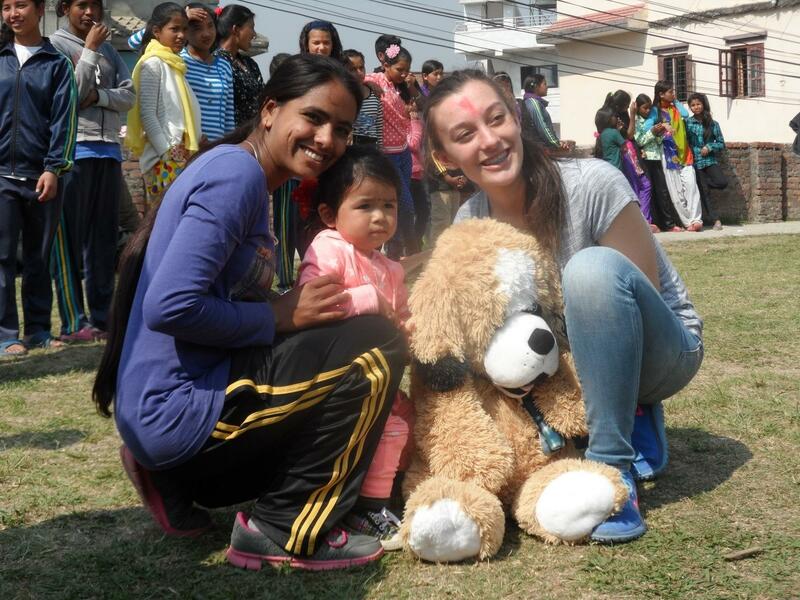 Carola spent the day with her and enabled the softest of landings for Ranjana’s new life. 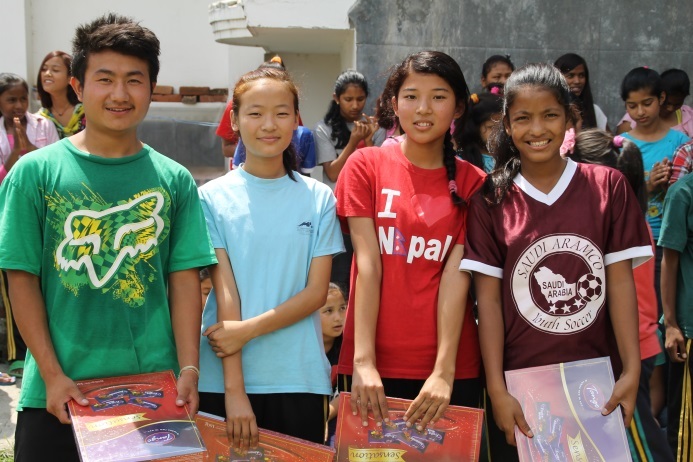 The students are learning English, Math, Computer and Nepali from 10am till 3pm all for free. From 4pm until 6pm our own children are at the Chelsea Center where the grad students work closely with them emphasizing math and computer. 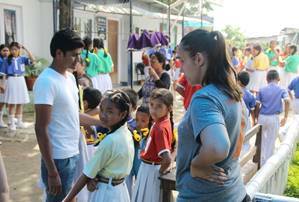 An incredible young woman, Manon Pruvost, has joined NOH and has been restructuring the CECC with a more systematic and structured curriculum that enables the student population to expand and the teaching to be more effective. She also has fun and helped to organize a field trip to the National Gardens. This was a joyous occasion which had 200 women groaning at day’s end when told it was time to board the busses for home. Some of the assembled before the busses arrived. Carola with our oldest student, so eager to learn and grateful for this opportunity, she helps give confidence and inspiration to all the other women. 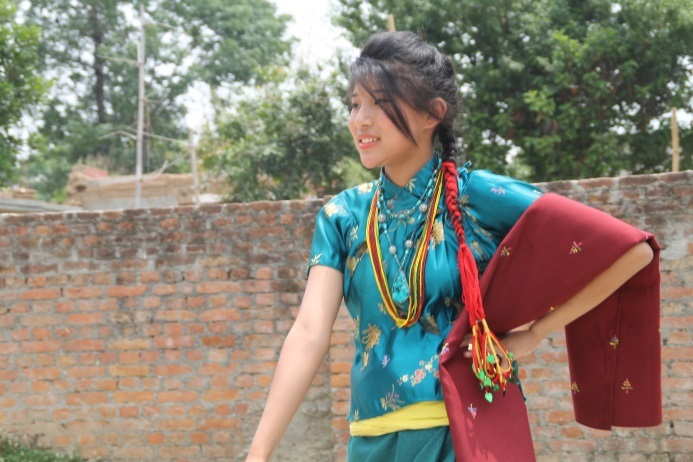 NOH began their vocational school many years before now; the first two years we focused on teaching the trades as well as music and basic computer skills. 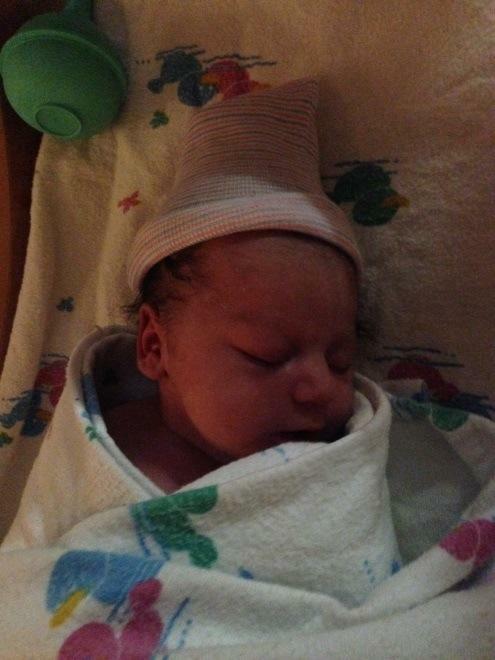 Then, Glenn Detrick came into our lives. Glenn visited NOH one rainy day to deliver his daughter Chelsea’s large Beanie Baby collection to our children. Chelsea had fought cancer for a few years and had succumbed to it in the previous year. 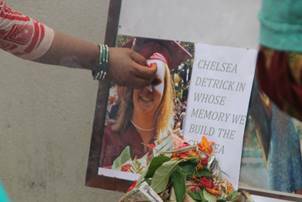 In her honor Glenn had established the Chelsea Center in St. Louis at Webster Groves High School. It flourishes today. 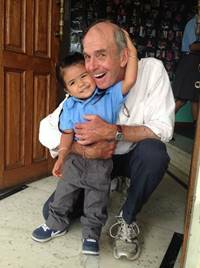 Glenn was swept up in the atmosphere of our homes, the incredible children and their dedication to learning and said he would like to help. Glenn Detrick, alone and with his friends, has enabled the humble vocational center we began to develop into a large, robust, community, and personal life changing center. Very soon NOH will break ground on building a new Chelsea Educational and Community Center for which we will have a dedication ceremony early next spring. This is Chelsea, by numerous accounts and from her father’s insightful and emotionally thought-provoking book about her life, I have learned what an exceptional person she was, gracing the earth for such a short while. 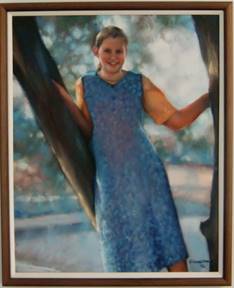 We recently posted a large photo of Chelsea in the CECC. 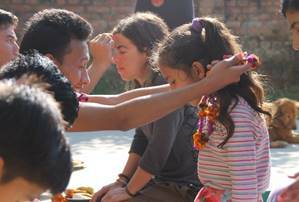 The women asked about her and in pure Nepali fashion, unprompted, in an act of the highest respect, kissed their fingers and touched Chelsea’s forehead and said a prayer. 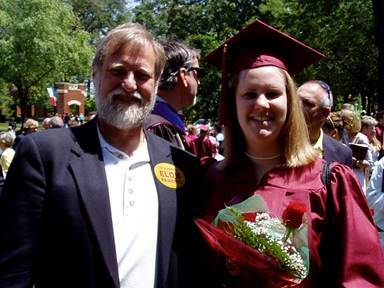 A father’s tribute to the inspiration he received by his daughter has made life easier and better, through education, for hundreds. People like this are, to me, saintly. NOH stays very busy trying to make a difference for people in need. We listen, we see, we learn and act without hesitation to find a way to remove burdens from people’s lives. 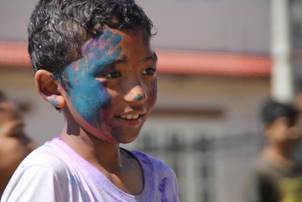 One program in its earliest stages is working with children who are terminally ill and in the final stages of their lives. 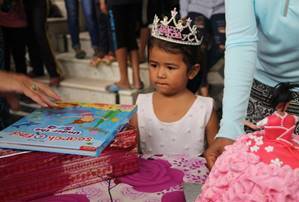 We have started small, being a presence in the ward two times a week, bringing fruits and sweets, organizing birthday parties and being ready to help poor families with the cost of medicine or other care. 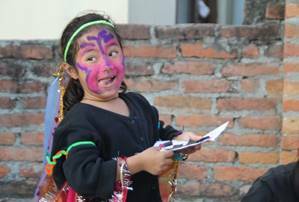 We hope to develop this further into a program modeled after the “Make A Wish Foundation”. 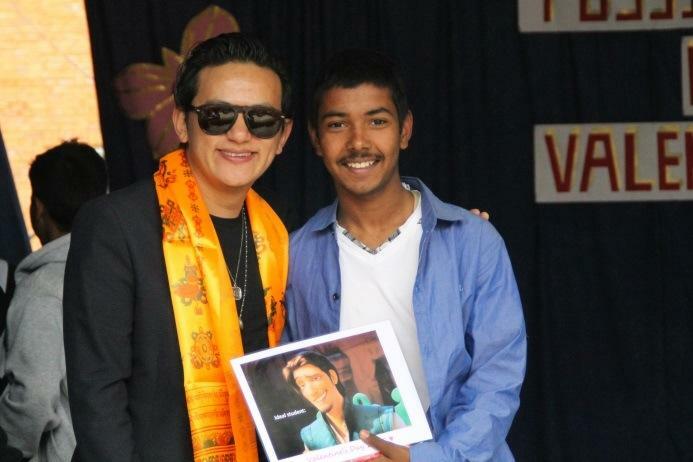 We had tried before the earthquake with a young boy who wished to meet his favorite actor. We did everything we could think of to get the actor to come for an hour or two, but he said he couldn’t spare the time. The boy died a little while after that. This failed at that time as I had not established enough of what was needed before offering a wish to this child. 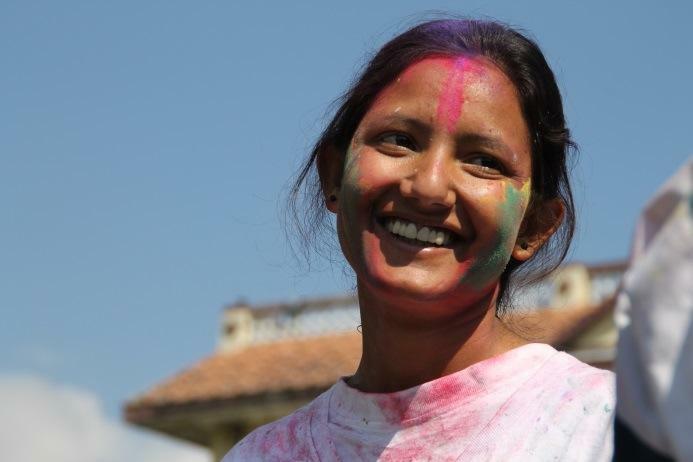 Sunita Pandey who co-manages our Volunteer Nepal arm has taken on the work at Kanti Children’s Hospital and serves it well. Unless you have a galvanized heart you may wish to not look at these photos. Such beautiful children. 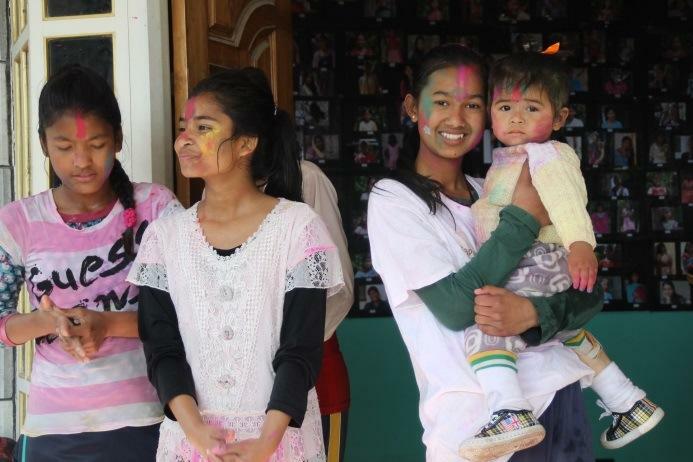 Saroj, my first son, is in the first photo far left; Mrs. Pandey can be found feeding the little girl with the thousand yard stare. The birthday party was for the little boy with the red shirt in the second photo. Such beautiful and courageous little people. Sometimes you really do not know a person until you see them interacting in a situation like this, they then become deeply human, transformed before your eyes. Volunteers and staff alike never leave this ward with dry eyes. 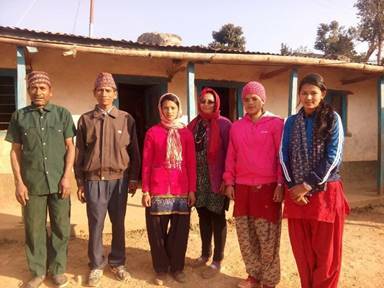 We have helped a Dalit (untouchables by the arcane practice of religious hierarchy) village in the hills of Ramechhap for many years. 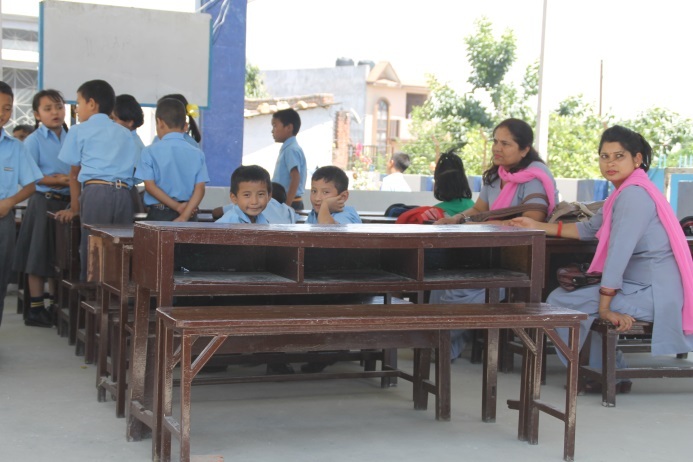 We primarily support the school with a hot lunch program, teacher salaries and other educational support when needed. 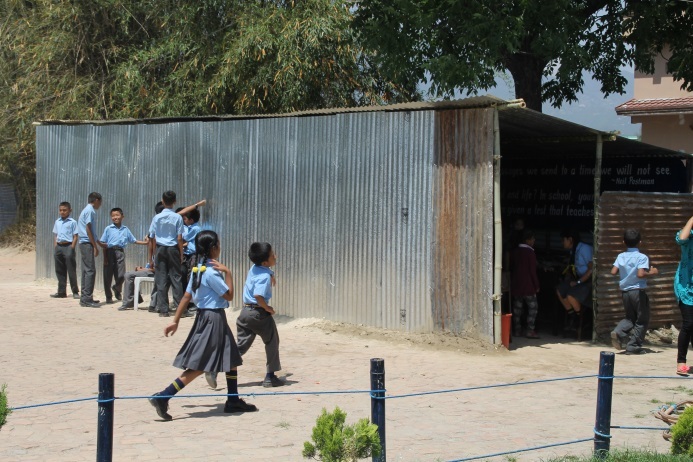 The school was destroyed in the second earthquake. 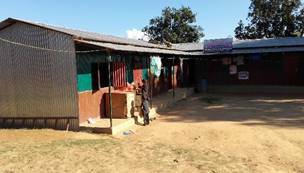 We helped then to get a temporary school put together and since have been working to build a new school. 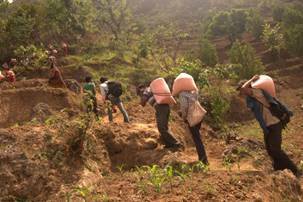 Numerous hurdles have kept that from happening and many natural hurdles remain; the area is hard to reach and water in very anemic supply. Yet we have been able to recently begin the construction. 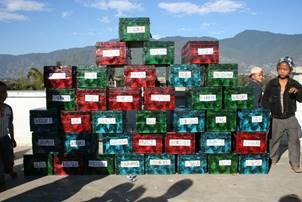 NOH received donations for earthquake relief from donors who knew we would use every penny of it properly. 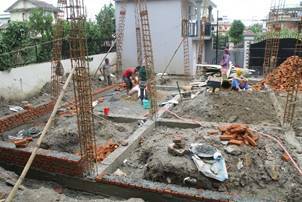 We hired an engineer who designed a school and gave an estimate of its construction. NOH has agreed to pay for the complete job. 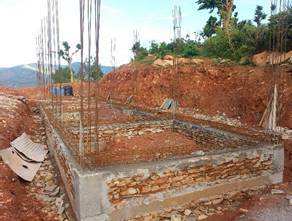 We hope, barring the seasonal rains inhibiting things too much, to have the school completed by the end of the year. 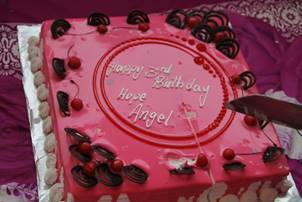 On April 30th Hope Angel turned three years old! A year makes a big difference. 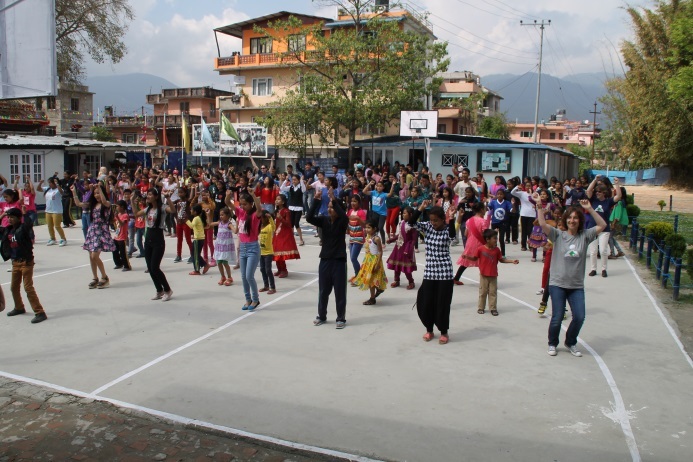 Last year we celebrated 5 days after the earthquake as a means to forget for a few hours, and though we are still receiving aftershocks in the mid four range, we have this year moved on and are no longer weighed down with anxiety. The other day the girls were working in the yard, and Hope was hanging with them. I with my camera came around the corner and saw this. Hope had picked up a long drain plunger and did a series of moves that had pretty accurate precision. In a letter to a friend I shared these photos with the idea that Hope had been a Ninja warrior in a past life. Then, with a moments further reflection I remembered she had just watched the Ninja Turtles. I still admire the form. NOH has at this time 24 of our children in College or University. We have 20 more who will join them next spring. Next year our college transition houses may have more children in them than some of our regular houses. Fortunately, we still have many young ones among us. 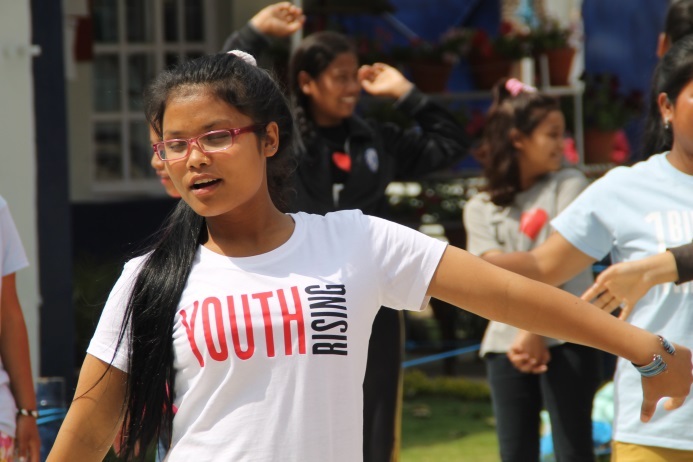 Watching these younger children, some who have been with us since 4 years old, will be fascinating; they will undoubtedly set new academic standards few others will approach. Our children now fill about half of our 43 staff positions. Others are managing their own business under our watchful eye. Two that deserve their own space now are below. 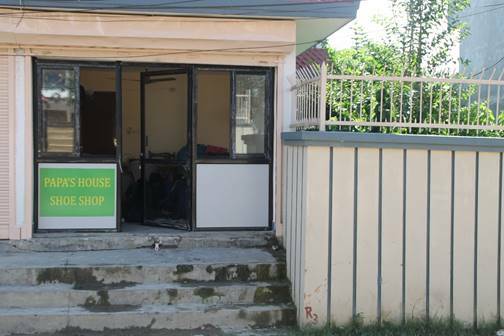 Our new Shoe Shop on the ground floor of the Sanctuary House. 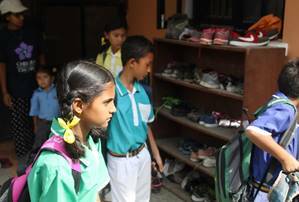 The children make all our school shoes as well as sell them to other students’ parents. Our new Tailoring Shop on the ground floor of the Chelsea Center. 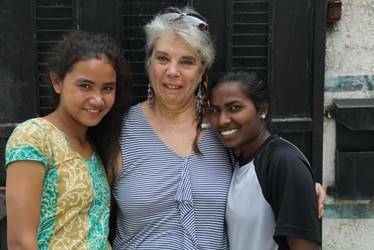 Here three of our girls manage the shop during the day and teach sewing between 4 and 6 pm. Since opening the shop they have been kept busy with many new orders. 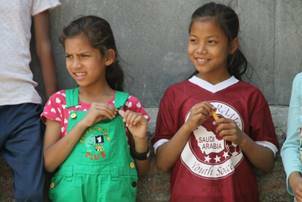 They have long been making our uniforms as well as the uniforms for Gholadunga, a home for the blind that we support. There is still painting to do and signs to be made and hung. Around two weeks ago I read a newspaper article which spoke of a remote village of 29 families surviving on nettle soup. 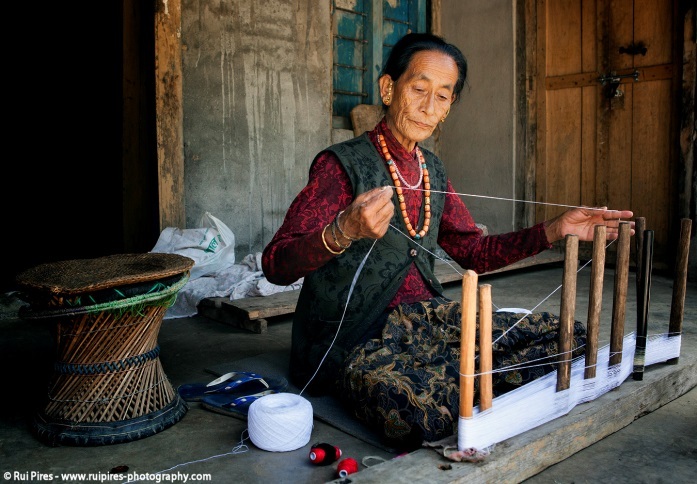 The community there is Chepang, formerly a nomadic people who lived in the forest and did quite well in their own way. A few years ago the government decided that they were hurting the forest and made them settle in villages together and learn to be farmers or tradesmen. 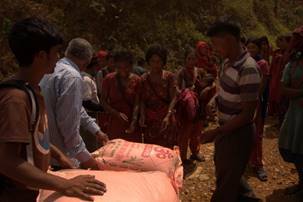 The article said that these 29 families were slowly starving; their crops were insufficient to feed them for more than 4 months and had earlier run out. We were curious to learn more about them and how to address their inability to be self-sustaining, but most importantly we wished to feed them. 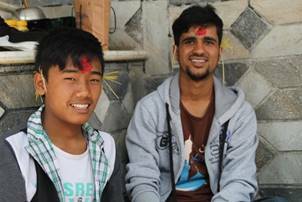 I called two of our older boys who were on their college break; both these boys are immensely capable in remote travel; Chham has a government earned trekking license and Rabindra is from one of the harshest and most unforgiving areas of Nepal and well-seasoned in hard work and innovation. 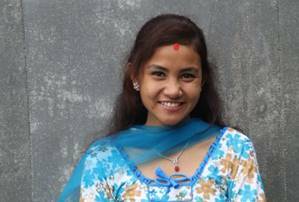 We met at 9:30 and I proposed that they take a bus to Dhading Besi, the district seat of the land where the village is and hire a 4-wheel truck, load it with rice, dhal, oil, salt, and flour and try and deliver it to the village. 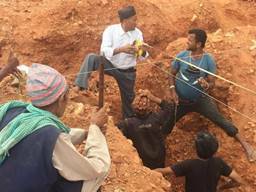 We have two good friends in Dhading, honorary uncles of Hope and I called them to meet Chham and Rabindra in Dhading Besi and help them secure a truck and guide them to where to buy the goods. 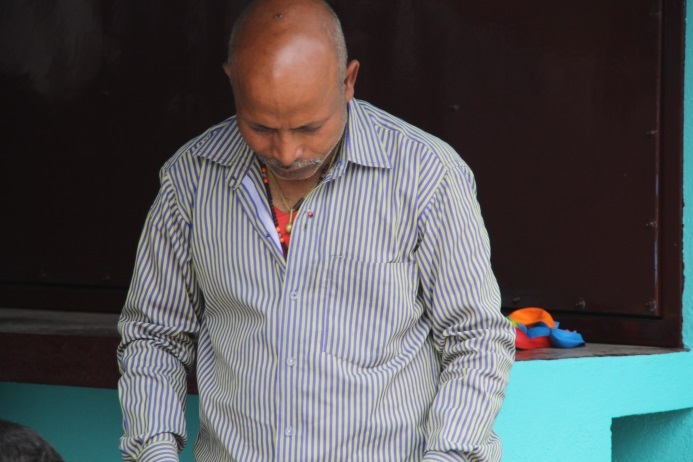 By 11am Chham and Rabindra were on their way and by late afternoon they had found a truck and driver, had it loaded with 2000lbs of food and set off for the village which lay at the top of a mountain range a good 5 hours distance. The “road” up was loosened by rains and barely supportive. After a few hours it was dark and dangerous to continue and so they stopped at a house they had passed and asked for shelter for the night. They slept in the cow shed, received a hot meal of rice in the morning and continued. 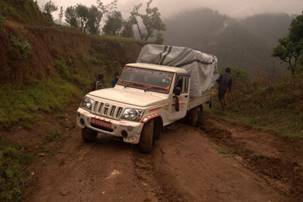 The rains came, the truck repeatedly got stuck and slid precariously close to sheer drop offs. A few people walking up to villages were given rides and used to push the truck each time it was stuck. 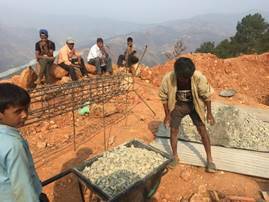 The driver wished to stop after the progress was so utterly slow, but Chham and Rabindra were able to coax out the best in him and shared their enthusiasm for not quitting on these people starving up ahead. They continued for hours more and finally reached an impasse. One of the riders said the village lay another 3 hours hike up the mountain. Chham and Rabindra paid him to go to the village and let the people know to come down and collect the goods and then waited. After 5 hours they saw a trail of people making their way down the steep incline on switchbacks. 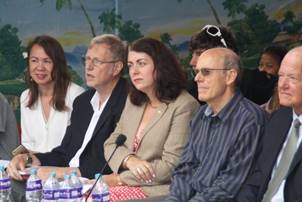 Soon they were surrounded by the villagers. Chham had the newspaper article with him which had a photo of one of the villagers and his son; he used this to find the boy. It was late in the day now, but the rain had stopped. 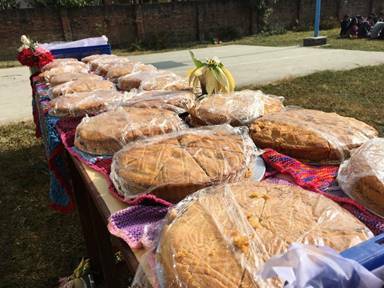 The food was unloaded and the villagers made ready to carry it home, they were deeply thankful; they felt witness to a miracle that Chham and Rabindra should show up with so much food for them. 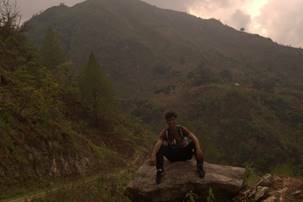 Mission accomplished, Rabindra and Chham breathe in the beauty and serenity before starting down towards home. 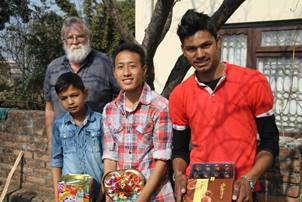 They arrived late the next day, exhausted, but pleased to have helped people. "Our children do not talk so much about life, they just live it; they do not talk about giving a gift to a friend, they just do it; they don’t think about carrying the school bag of another who isn’t feeling well, they simply take it; there is no pretense, no calculations. They simply choose to engage everything straight from the heart. “We have choices in life and each and every one of us has so much power. If you choose to live a positive, optimistic life, to help others, to love your family and friends, to think ‘How can I make a difference in someone’s life every day?’ then you will make that difference; not only in their lives but in the quality of your own. It does not take a special person or a rich person; it just takes a caring person." Thank you for the time you have spent reading this. It is all too easy to overlook the remarkableness of some people. 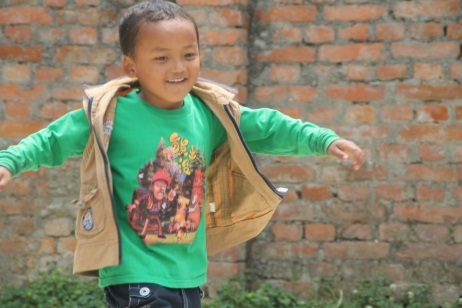 Hari Nepali is a good illustration; he is one of those who in his quiet way keeps the roof of a small society from sagging by his constant cheerfulness and good energy. 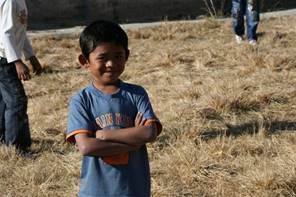 Hari spreads himself out well; he is always there in any group, a little on the periphery, watching and smiling. You don’t always know he is there until your gaze is drawn to the emanation of joy from the little guy whose smile is contagious. 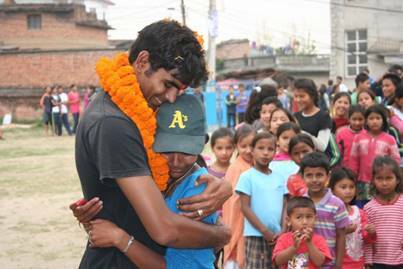 Hari was part of the six boys and six girls that Nepal Orphans Home rescued from a small orphanage abandoned by those in whose care they had been assigned three years ago next month. 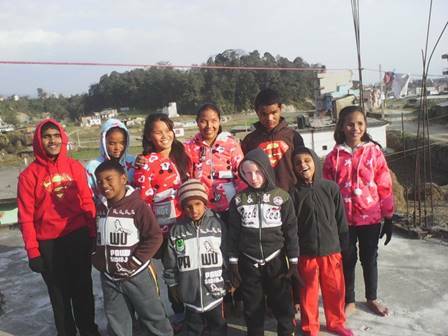 All 12 of these children have contributed so much to Papa’s House and are exceptional in many ways. 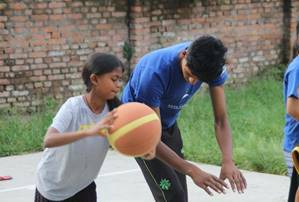 Some are very talented in sports, or school work; some in overcoming physical challenges with humor and determination; Hari is a natural at building others’ confidence with an encouraging smile in the most sincere way. Ask others what they would like to be when they grow up and you will see their eyes, like a magic Eight-ball, bring “doctor or social worker” hazily to the surface; ask Hari, and, his grin widening a bit, quickly replies, “bus driver!” I can see and hope that one day Hari will be our bus driver; Hari will shepherd our Papa’s House children where they are going, swinging the door wide open from his seat and smiling his Hari smile down upon the next generation of Papa’s House children stepping up and into his carefully driven bus. 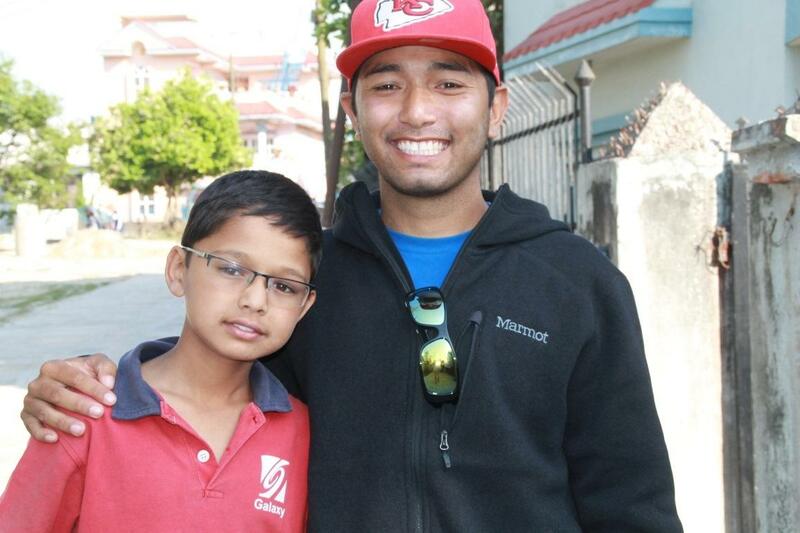 Hari Nepali, future bus driver for Papa’s House. More than seven years later Hari is about to complete class 8 with a great command of English and grades slightly above average. 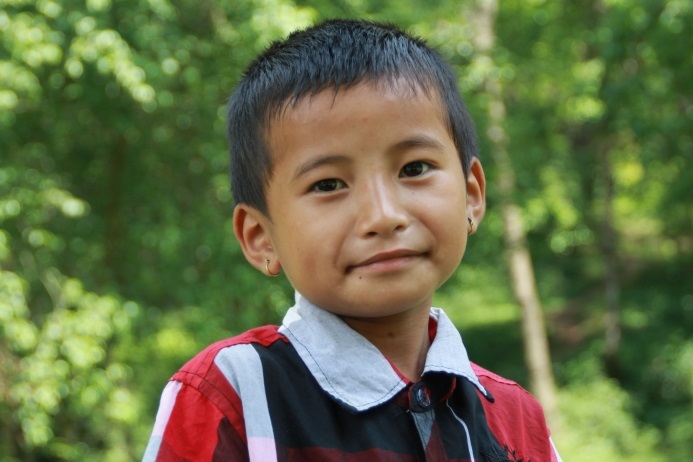 His academic accomplishments are noteworthy when you consider that he had never been in school before his rescue and began then attending an English medium school while not knowing any English at all. However proud of Hari I am for his academics I am more so for the truly fine person he continues to be. 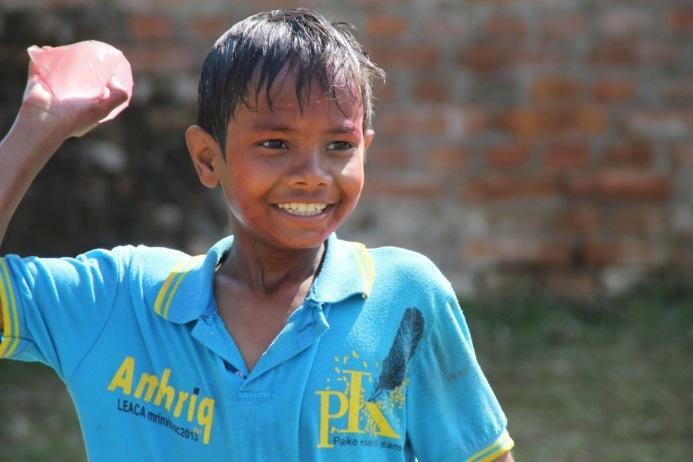 There is no pretense with Hari; he knows how to be happy and how to make others happy. Last month I asked Hari if I could interview him, which he found pretty comical. 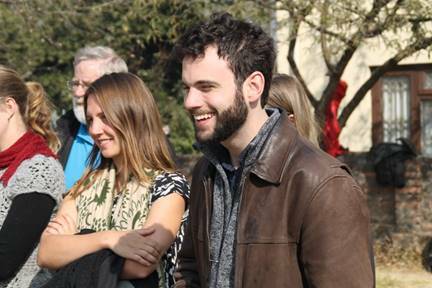 “Why would you want to interview me?” he asked with his disarmingly sincere grin before we sat on the steps one Saturday for an impromptu session. Hari has changed so very little from the Hari I wrote about above, but here is the conversation we had. I asked questions and he delivered off the cuff responses without much elaboration. What do you remember about your time before coming to live at Papa’s House? What have you learned since joining our family? Tell me some of the things you might want to be when you are finished with school? How do you wish to accomplish this? What qualities would you wish to have other people see in you? Can you give me just one word that describes for you living at Papas House? The time leading up to Christmas this year was much more relaxed and enjoyable with a further division of labor and a cut back in gift giving and expectations. 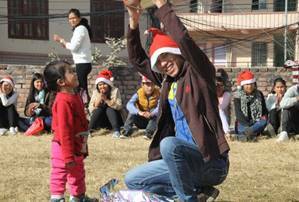 The children focused more on making special gifts for their Secret Santa sharing and on the program they would perform on Christmas Day. Christmas Eve is always the highlight and that will never change; the environment always becomes charged with the children’s heightened sense of family, caring and the mysteries of the holiday. There is a touching reverence in their eyes and voices as they sing Joy to The World and Drummer Boy in one voice; the air is filled with a solemnity and peace while we make our way through the 4 or 5 songs that flow freely, though inaccurately, from our sporadic rehearsals. As has been tradition for us, after a couple of hours of candle lit fun and hot chocolate prepared over a wood fire, (still our only cooking source), we left Papa’s House grounds in a long line all holding candles and singing as we made our way to the first house, Anita Mahato’s Imagine house and bid goodnight to the girls and staff who live there. 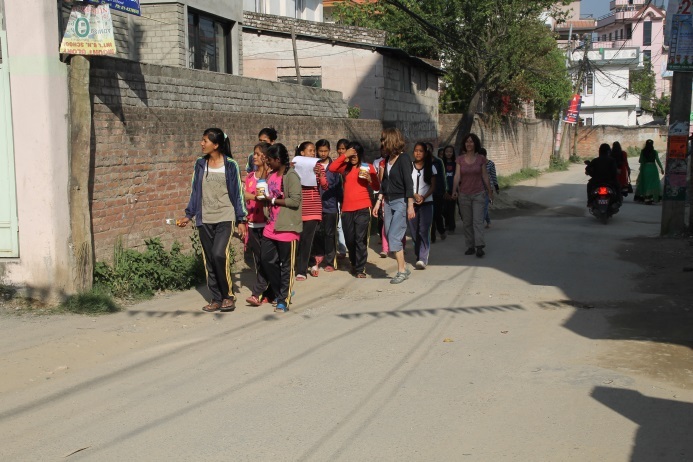 This procession continued until we were back to Papa’s House with only the girls and staff who live there. 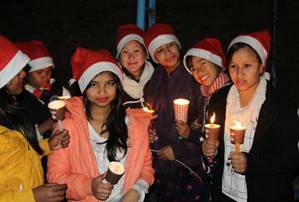 On route much of Dhapasi comes outside to wish us a Merry Christmas, many more this year as 185 of the women in the village feel a stronger connection to us as they come to our Chelsea Education and Community Center every day for free lessons in English, Math, Nepali and Computer. 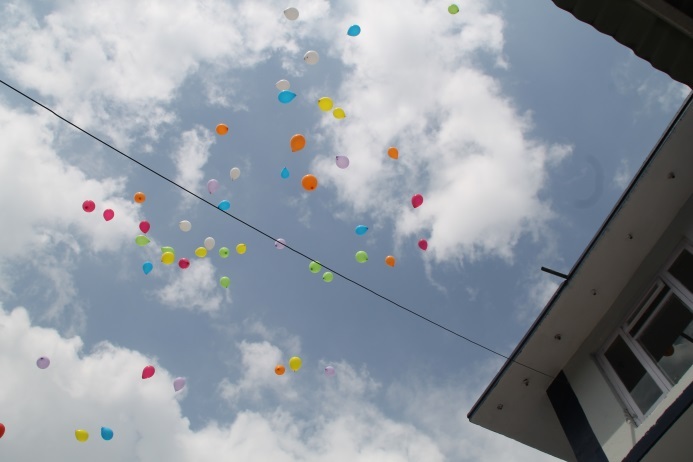 As we pass the Skylark School’s Hostel we are showered with colored confetti painstakingly cut, but freely tossed down upon us from the 80 students living there. Once home in their houses the children have their own traditions to uphold; these are a little different for each house and testify to the unity of each family unit. Christmas Day this year differed in not having all the children’s gift bags scattered across the frozen lawn. 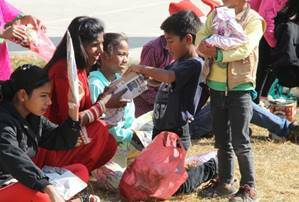 While the children, slept each house manager placed all the gifts under their own family decorated tree. 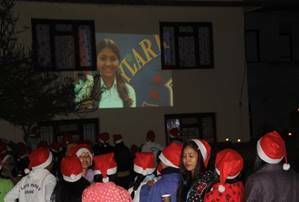 After a leisurely morning in their homes the children and staff all assembled at Papa’s House for their Christmas program and to enjoy a delicious meal prepared by all the staff and many of the girls in their own homes earlier in the morning and brought to share. 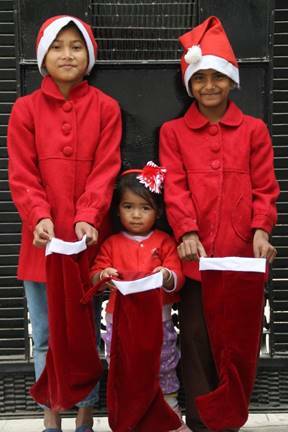 New stockings were made this year by our tailoring girls; the size I had suggested became a challenge to fill, but they were and then Santa managed to place or hang these in every room for the children’s awakening. Another wonderful Christmas come and gone in a year of adversity and triumph and above all sharing and comforting one another while the grounds continued rumbling beneath us. 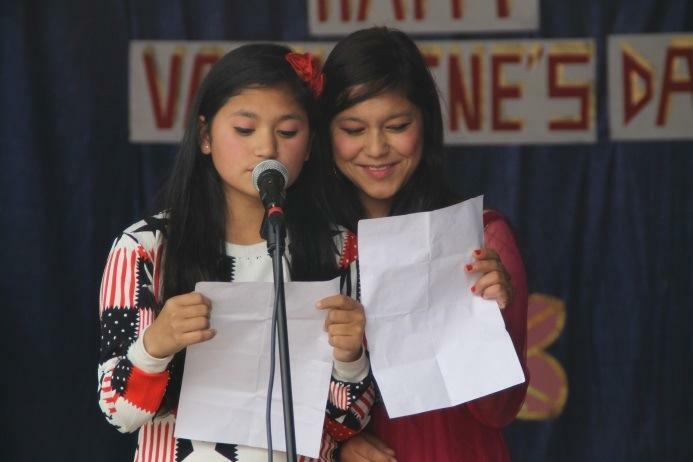 We frequently offer the children essays to write and most all enjoy entering the contest. Our most recent one was “An asteroid will be hitting the earth; the planet has 14 days left. How will you spend your time?” The children’s essays were impressively well thought out and creative, some humorous, others beautiful, and very touching. 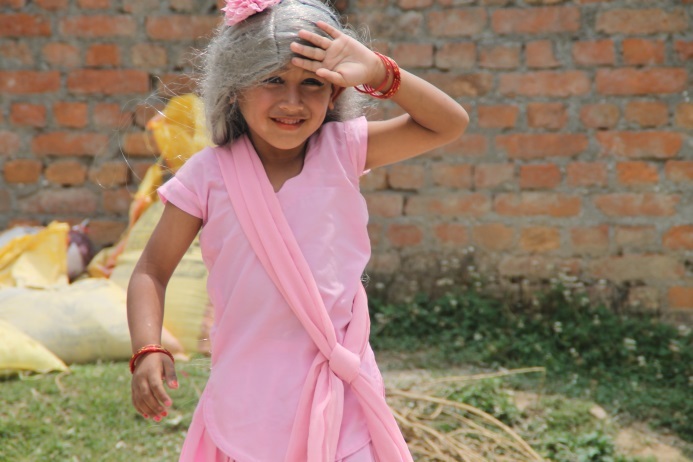 Many of the children wished to spend time with elderly people to learn what it is like to grow older; there were some who wished to create something that would live on after them, and in many cases this involved making memories for others to remember them by. Many would busy themselves trying to find people from their past to say thank-you or I am sorry, but all said that when time was almost out they wanted to be with their NOH family because this is where they know love is real; they want us all to be together in the end and together they will not have any fear. 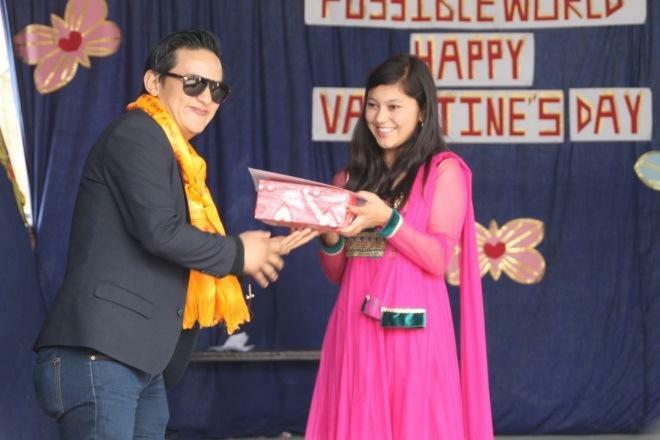 Dawn Kumari Gurung has been with me from the very beginning. 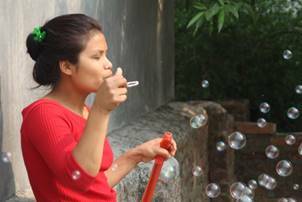 She was the cook and Didi in the first orphanage that I found and she helped me in our efforts to free the children from their hideous life. We have been through wonderful times and times of unimaginable nightmares together; and in all times she has been solid as a rock, calm, pragmatic and determined. I don’t know of anyone who works harder than she, in illness and in health, she simply refuses to stop. In April when the earthquake came it was at tiffin time and I was cooking. Once we had collected all the children from all the homes and calmed them on our large playground, suddenly home to all our neighbors, she and I went about fixing food for everyone, shoulder to shoulder, in silence, both knowing that we needed to be the ones to keep the children safe, to ease their fears, to get a routine restored, to smile and laugh again and joke with them about it. 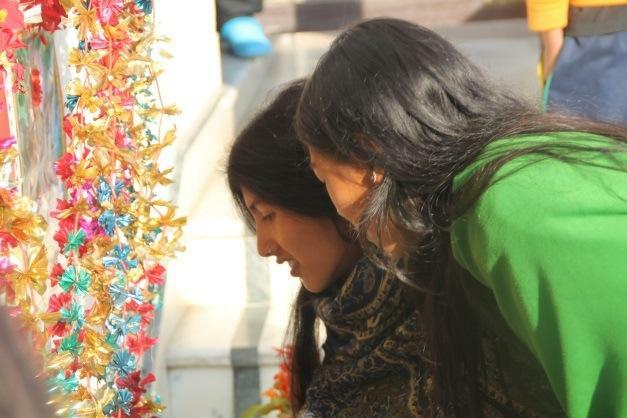 Dawn Kumari has always been my anchor, a place to find resilience and resolve. 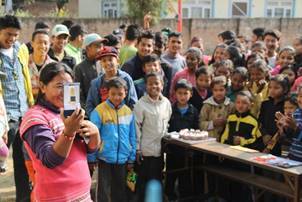 So it was with great pleasure that we surprised Dawn Kuamri after lunch one day with a tribute to her over 10 years of quiet performance, always shoring up the homes, each and every day, never seemingly put out by the hardships life in Nepal renders more often than blessings. Late last fall we received a shipment of absolutely stunning quilts by professional quilter Silke Steuxner. 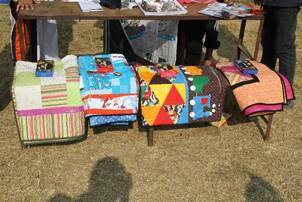 Silke had only heard about us from friends and had become a FaceBook friend to NOH and Volunteer Nepal and this was enough to inspire her to create these beautiful quilts, over a year in the making. 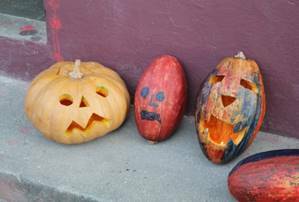 We had been trying to decide how to distribute them and settled upon having all of the children vote for the one child that, since winter began, has been the most helpful to the house managers and the children within. 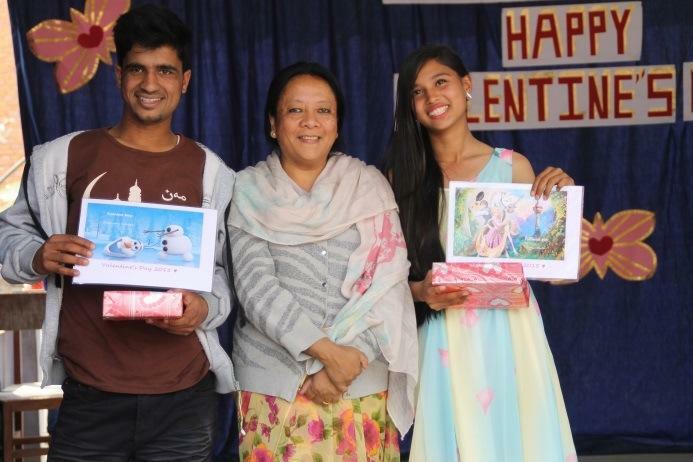 The four winners pictured above are Anupa from Harmony House, Anu from Sanctuary House, Kamana from Imagine House and Roshen from Possibilities House. 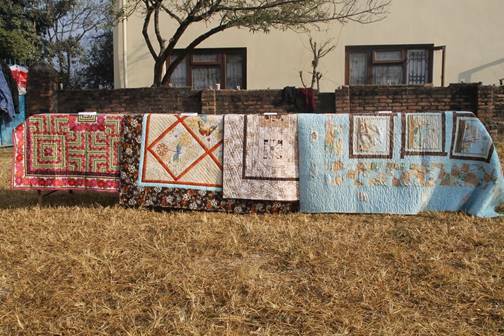 There were other smaller quilts as well which went to our smallest children. There will be more “Children of the Season” though never again prizes as great as these. Silke has recently returned from a quilting competition in Japan where she placed second. 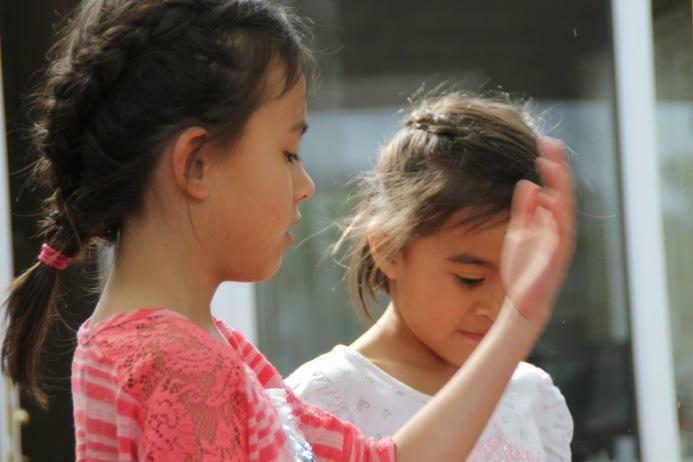 NOH has been blessed by its many friends and their special way to reach out to the children. 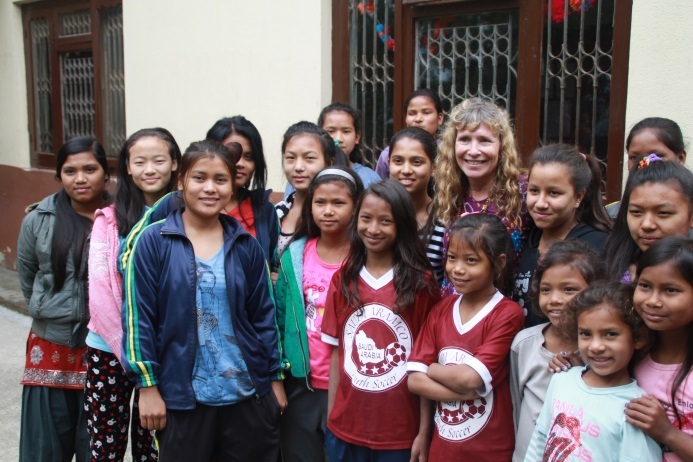 Carlyn Doan is a volunteer from many years ago who returned to Nepal this year with her sister. 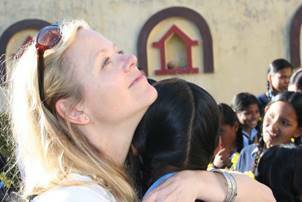 Carlyn has been supporting a young man, now in college in India, since meeting him as an orphan in one of the orphanages that we were helping then and where she did her placement. 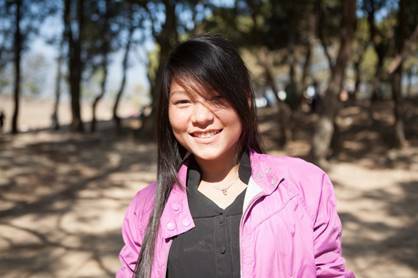 Both Bir Jung and Carlyn have done very well in the years in between and Bir Jung has a great future ahead of him because of her. 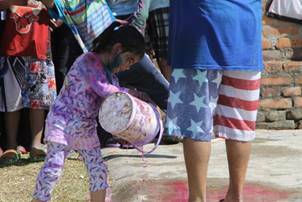 They came on a Saturday morning bringing dozens of t-shirts and tie dye materials and taught the children tie dying. The caliber of our volunteers has always been very high and they continue to affect the lives of those they met here for long after they have returned home. Our Chelsea Education and Community Center, founded by Glenn Detrick, has a new Director, Michael “Abraham” Triozzi. 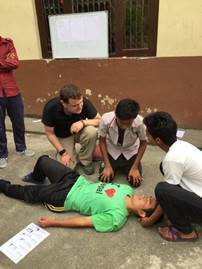 The former Director of Volunteer Nepal returned to us to serve while awaiting his induction into the Peace Corps this fall. 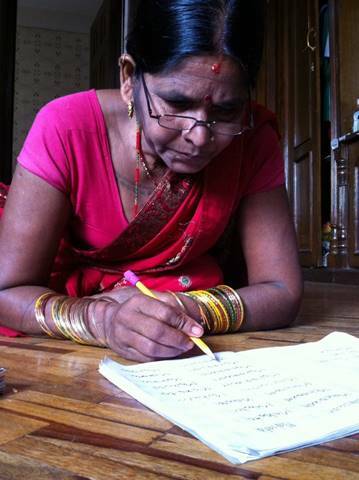 We have expanded our Adult Learning Center to include Nepali and Conversational English to supplement the English, Math and Computer literacy courses that began almost a year ago. 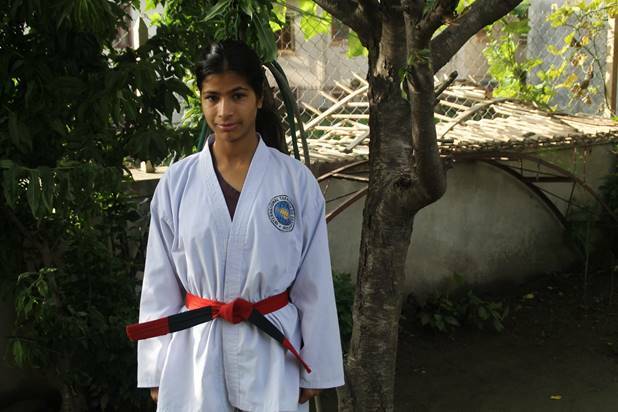 185 women now have daily classes with us. 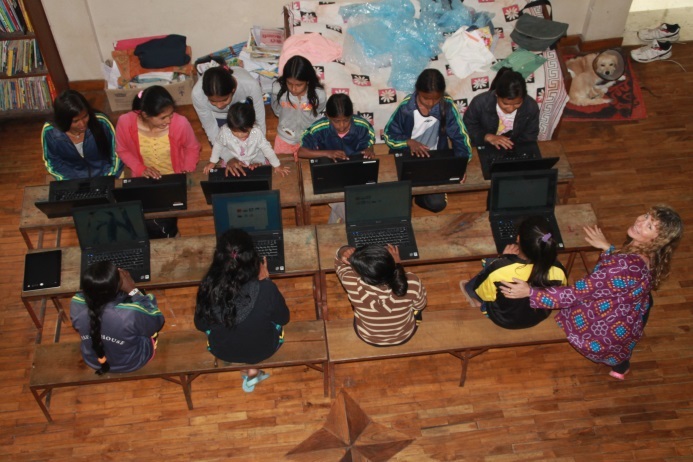 Our children also continue to develop enriched knowledge of math using the online Khan Academy math program and various computer language and hardware courses. Tailoring is a staple that continues to turn out very accomplished seamstresses. 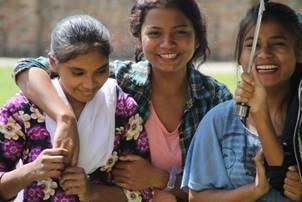 We have six girls who have formed their own tailoring business and, when not working for us making uniforms, curtains, sheets, pillow cases and the children’s Kurta Sulwars, they receive orders. Thus far they have sent Kurtas of their own design to Germany and Australia. 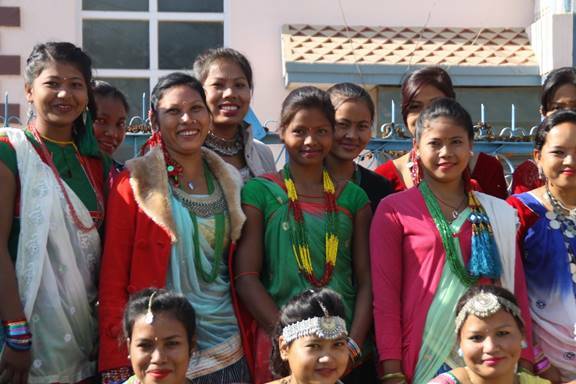 Two of these girls also manage a local tailoring shop. 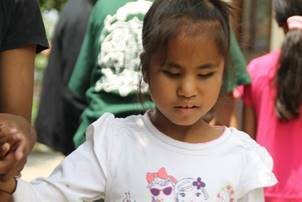 We are very proud of what the CECC has accomplished over the years for our children as well as the community; the difference it has made to each facet is one of the very best of the many outreach programs of NOH. and Puja reading “Chelsea’s Story” one Saturday afternoon. 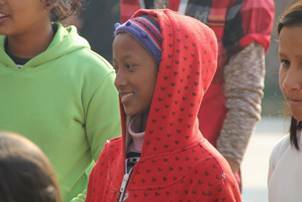 On January 27th I, along with Anita Mahato and Hope boarded a plane bound for America. 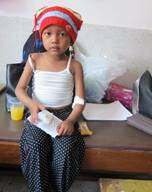 Hope had been accepted as a patient at Shriners Children’s Hospital. This is one of the finest medical facilities anywhere and they offer their services for free to children from all over the world with serious medical situations. I am writing this update from Boston, Massachusetts, where we have begun our work with Shriners. On Thursday morning, February 25th at 8am, Hope will undergo revision surgery. She will remain in the hospital, with us, for two days and then be able to return home to my brother Bob’s House in Jamaica Plain, for an estimated three weeks’ recovery. We will then go to Branford, Connecticut, and be received by NEOPS, the leading prosthetics device makers in New England, to be fitted with state of the art prosthetics. 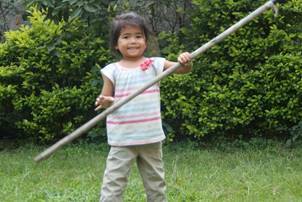 Both Shriners and NEOPS accept patients like Hope for life. 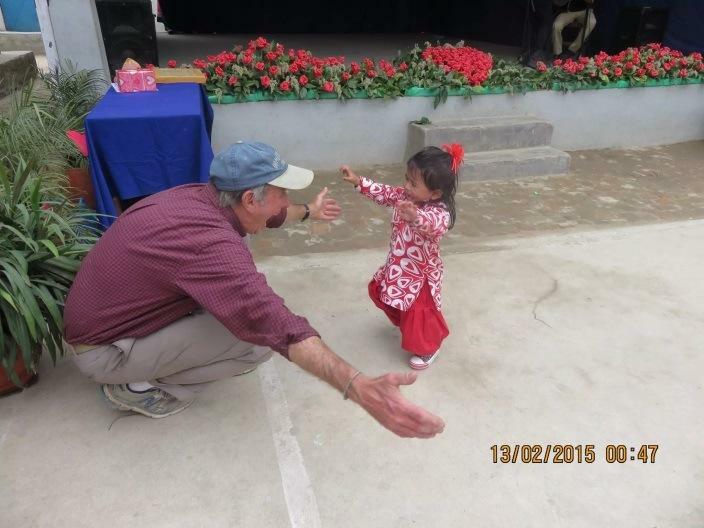 As Hope grows she may require more surgeries and she will need larger prosthetics every eighteen months or so. We left for America early enough so that we could visit family and friends from Florida and on our way up to Boston. 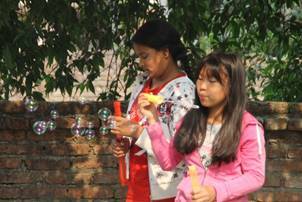 This opportunity for Hope is a dream come true for all of us at Nepal Orphans Home. 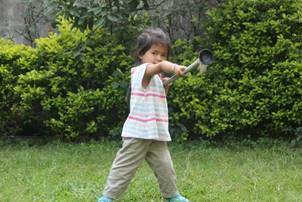 Hope is a truly remarkable little girl who has further galvanized our very large family and opened hearts wherever she goes. We have five weeks left of school this year. 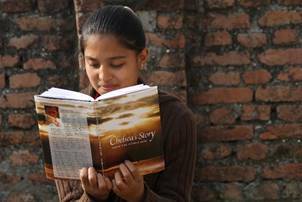 In another two weeks our twelve Class 10 children will leave school and do home study in preparation for their final exams that will allow them to proceed on to college. Last year only 43% of all students in the country passed the exam. In the history of NOH we have had only one student not pass the exam, but she did so the following year. We have had three students not qualify to sit for the exam 5 years ago but they have since all passed it in the first division. Twelve students this year will join last year’s four, the previous year’s seven, the year before four and the year before that our first. 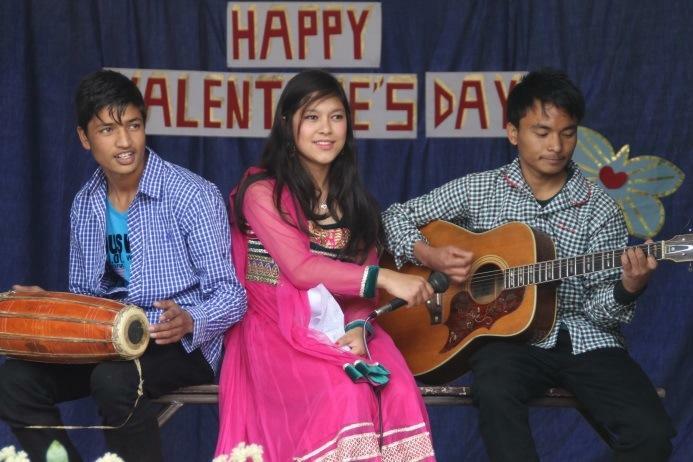 Of those sixteen students one dropped out after two years in pre- engineering, one has finished and now works as a Volunteer Coordinator for Volunteer Nepal; three have gone on to university with one working part time as a guide for Volunteer Nepal and the others continue in college. 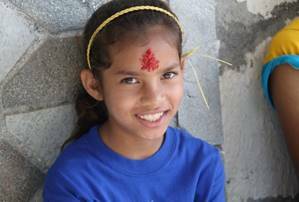 When we send this year’s twelve to college in late June they will make a total of 25 of our NOH children in college or university. The numbers begin to grow much more quickly thereafter. Worry as all parents do about their children finding their way and being prepared, we have thus found it unnecessary. All of our children have fulfilled our expectations in their academic pursuits as well as following our suggested guidelines for securing part time work while in college and living successfully in the college transition houses we set up. Each of these students has already proved to be exceptionally kind, caring and happy; several are class leaders, some academic leaders, others winners of superlatives or house captains chosen by their house mates for their helpfulness and ability to understand and get the job done. 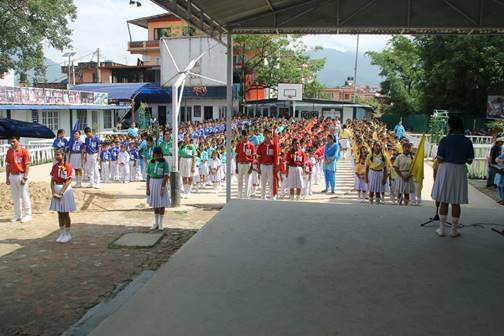 It has in many ways been a much more difficult time for this year’s graduates having lost so much school due to the earthquakes and political problems of Nepal. But I feel confident that when they sit for their exams in a little more than 3 weeks’ time they will be the cream of the crop. And that is it for this February update. 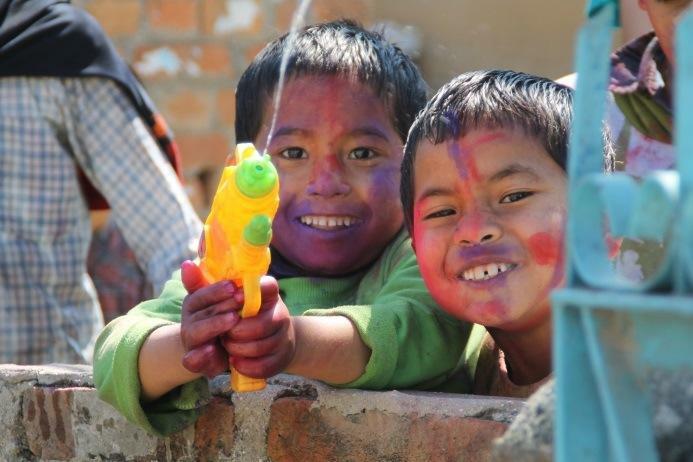 I begin this update a couple of days shy of Tihar, the caboose of this month-long train of festivals and celebration. I hope to conclude it by Wednesday, Laxmi Puja, the pinnacle of the festival of light. It is a day carefully prepared for by every household no matter how humble. 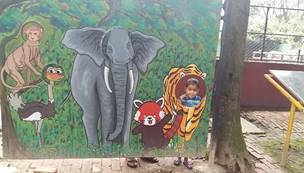 Laxmi, the Goddess of Wealth will be guided into the home or business by a pathway of small candles beginning at a Mandela painted outside and culminating in the room where money is stored. In my first few Tihars, candles were all that was used and its low flickering glow under lighting the faces of those gathered offered a reverential stillness and beauty to all. Now Christmas lights left on through the night drape many homes and businesses, and our pre-dawn walks, when there is power, are in a dazzle of blue and green energizing the otherwise gentleness that beckons before dawn. 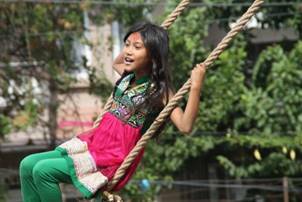 Nepal goes from one calamity to another, never collecting its breath between. We are shortly about to enter what may arguably be our most unforgivable crises in recent history and it seems too late to stop it. 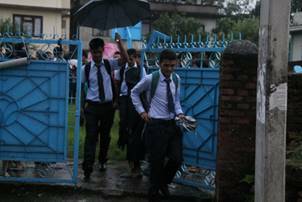 Ignoring the task of rebuilding Nepal and taking care of its people in the aftermath of the back to back earthquakes, the government focused only on writing a constitution which alienated the simple folks who toil in back breaking labor in the fields along the border of India that feed the nation. They are, by way of average estimates, 40% of the population. In response the people have left the fields and massed at the border, closing the trade routes from India, the sole provider of petroleum products as well as medicines and most of the staples a small landlocked country depends upon. Because of this, the shelter and food supplies the people of Nepal’s higher elevations have been waiting for since the earthquakes have not been able to get delivered by the foreign relief agencies accepting this life saving task from a government otherwise engaged. Many people are about to enter a nightmare of freezing temperatures without the shelter, food or supplies to last till spring. 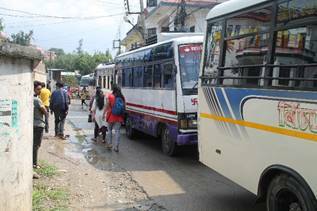 Meanwhile in Kathmandu and along the industrial belt, the lack of petrol, diesel and cooking gas has brought the nation to its knees. 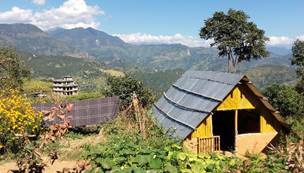 There is no abundance of wood for cooking and no mechanism for delivery of products, no diesel to run generators which power everything from hospitals to grocery stores to the internet. School buses will cease to run and public transportation becomes scarce and overburdened. The shutdown has been very effective, but thus far has only brought about a match of will. 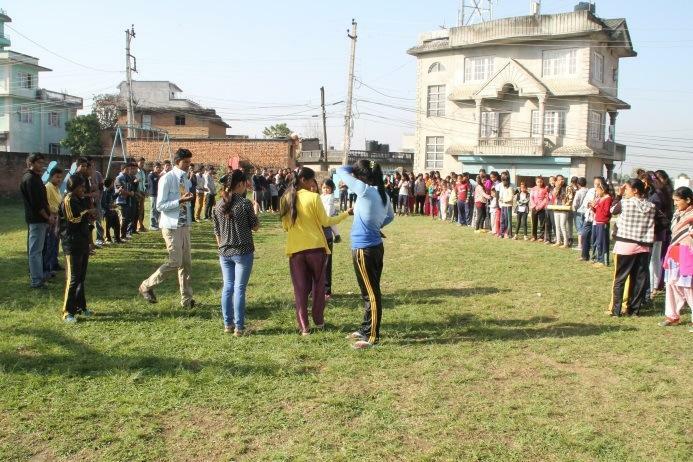 The new government of Nepal has dug in its heels against altering the biased constitution and the Mahadesi have grown stronger in numbers with unofficial support of India. Meanwhile we learn to do without, a lesson valuable in countless ways. Necessity brings evolution in creative and satisfying ways. 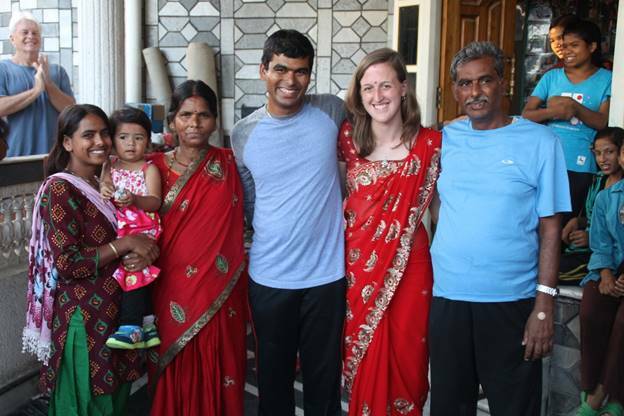 A little over three years ago Vinod Mahato, big brother to Anita and Sunita, left the only home he had ever known and boarded a plane for America to marry his girlfriend of many years. Vinod’s long goodbye, here with Anita and 34 hours later his arrival in North Carolina. 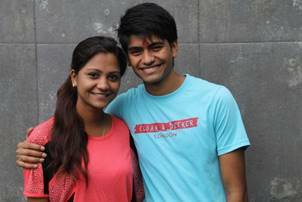 Vinod and Alecia fell in love when they first saw one another in Dhapasi in 2008. 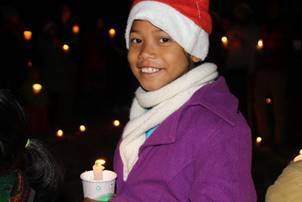 Alecia, along with her mother Marcie, were volunteering; it was Marcie’s second time with us. Both Alecia and Vinod were determined to complete college and graduate schools and exhibited tremendous patience over the following years while trying to arrange Vinod’s visa. 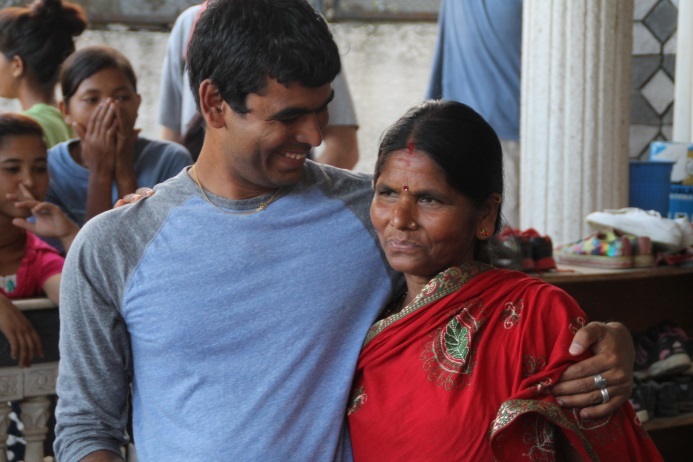 Vinod left here with a 10th grade education, but once in America set to work. He received his GED and began college. 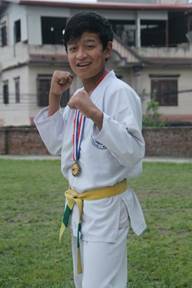 His grades have always been excellent and he has won the hearts of school administrators and has earned awards and scholarships. He is now at North Carolina State University as a junior majoring in Business Administration. Both he and Alecia have kept their eye on their goal, lived frugally, balanced several jobs with school and study, and somehow have sustained the energy to arrive where they are today. Vinod came to work for NOH nine years ago as my indispensable right hand. 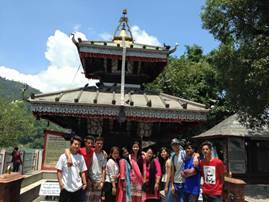 It would be a wonderful journey to have them back with NOH after their academic goals have been met. 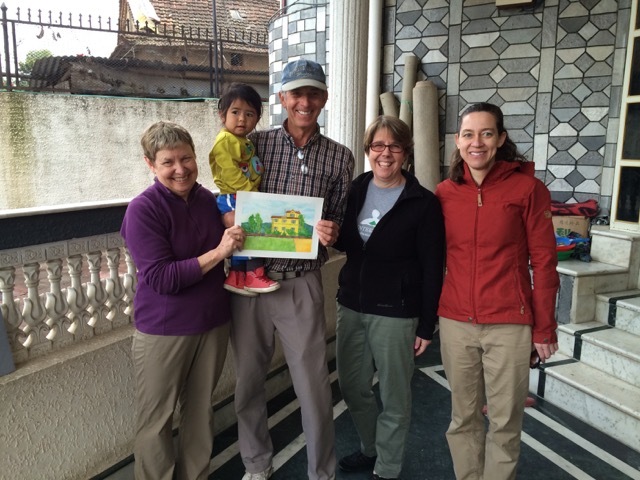 ​Vinod and Alecia returned this past summer for six weeks, shown here with Anita and Hope, his mother and father. 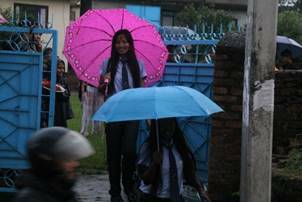 This past July we assembled in the early morning drizzle to offer our blessings to the children on their first day of college. We have only three this time around, but next July I will be writing about 12 more going, and a scant 20 months hence 20 more bound for college. 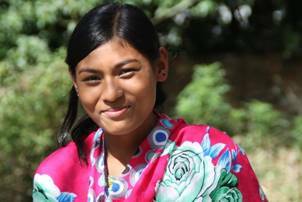 On August 13th we welcomed Sarita, shown here with her mother, into our home. 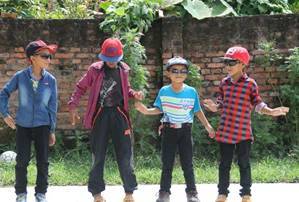 They are from Gorkha. 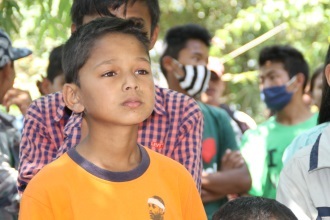 While our older son Chham was in his village after the quake he learned about Sarita and how she lost her father and brother in the earthquake’s landslide which wiped out their entire village. 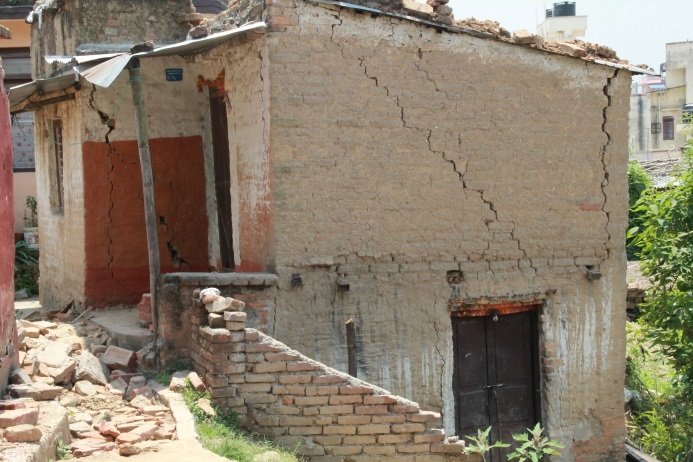 Chham’s village suffered the same fate, as well as Dawn Kumari’s, my first employee. 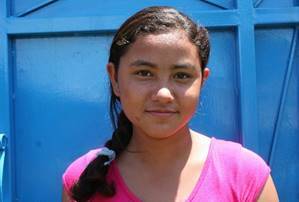 Sarita’s extended family has suffered many deaths and her mother’s health is very poor. 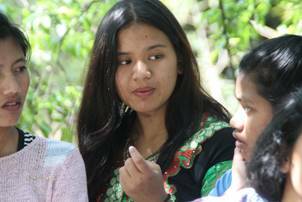 Chham interviewed many people to make sure that all he had been told was completely true and then called me and asked if we could take her in. When Chham returned, he did so bringing them with him. 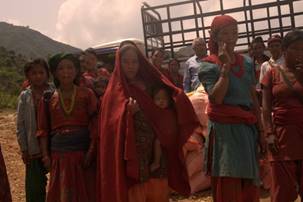 The mother then left to return to her village where she has absolutely nothing and must start over again with other surviving members of her family. 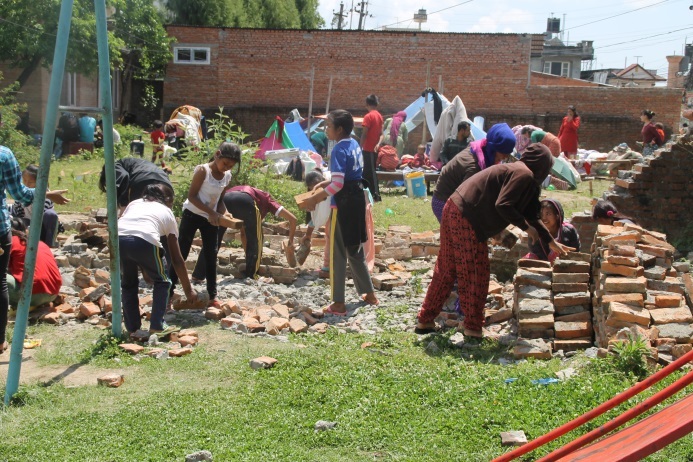 NOH and Possible Worlds together have sent a relief package with Chham to build a small home for his mother and contribute towards a small school for the children so that they can begin to return to a pre- earthquake routine while the adults try to rebuild their village. We were contacted shortly after the earthquake by “Clowns without Borders”. 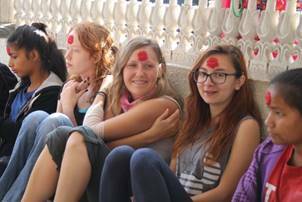 This is an international group of volunteer clowns who last year traveled to 50 areas steeped in conflict, like Syria, in order to give the children a few hours in which they can forget about their lives and have peace and laughter fill their hearts. Through many e-mail exchanges I learned a bit about the individuals who came to us, and I was so impressed by their full time occupations and accomplishments in contrast to their dedication to this cause. After their performance they spent a few hours with us over lunch and I could not have been more honored or humbled by their sincerity, kindness and compassion. Incredible individuals with an incredible organization, this day helped to further separate all of us from our not so distant past; the laughter was uncontrollable and the memories lasting. 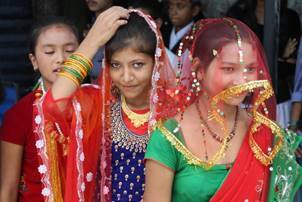 Teej this year was held on September 16th. This is a celebration for women; they dress in their very best after a predawn bath, fasting and prayer. The married women pray for the long life and good health of their husbands. I had thought that the single women and girls prayed for an eventual good husband, but that thought has been corrected this year. 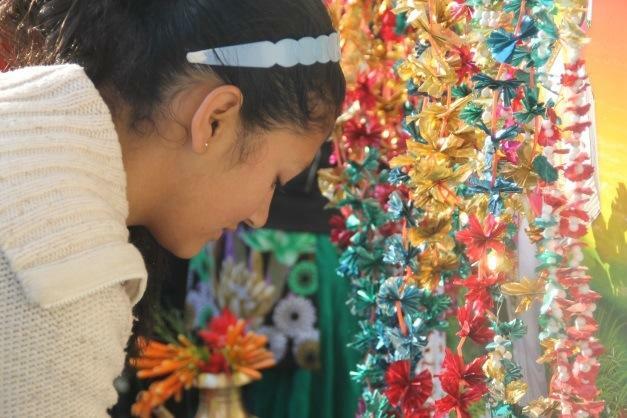 I don’t know what they pray for; their participation may simply be festively inspired solidarity. 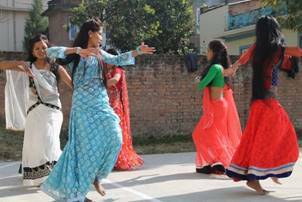 From dawn to the dark of evening, married women in groups will be found endlessly dancing at neighborhood temples, then return home to break their fast and sleep. 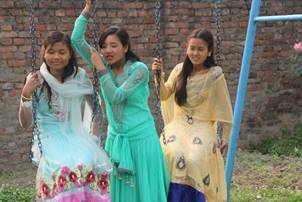 Below are some of our daughters in celebration of Teej. This year we had a special guest for Teej. 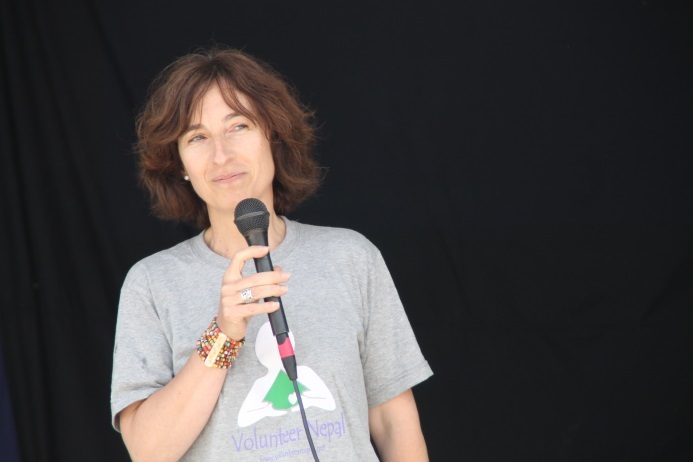 Dr. Helena Teixeira, a semi-retired eminent plastic surgeon from Portugal with 30 years’ experience in burn care, came to us as a volunteer. 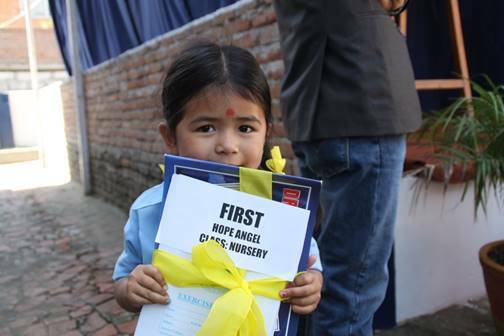 We had arranged for her to spend her time with our good friend Dr. Shankar Rai who began a hospital several years ago to help burn and cleft pallet patients regardless of ability to pay. These two distinguished surgeons learned much from each other during a month’s service together. Further, our daughters all had a chance to relax in her company and absorb some of what it takes to be such a fine role model. 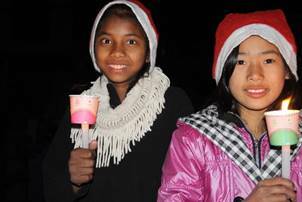 The above photo breaks between stories are the girls of Sanctuary House. 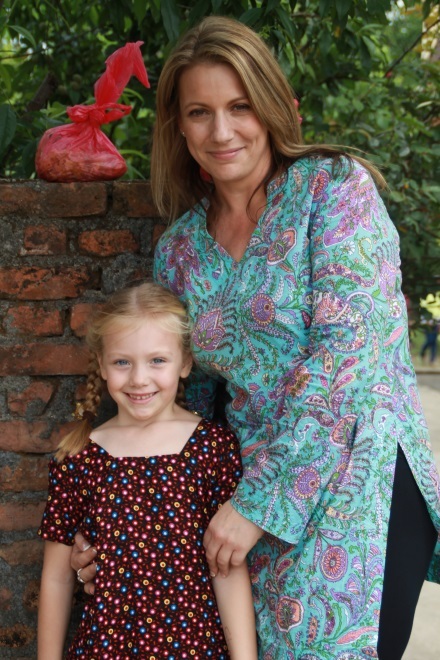 Sanctuary House was named after the wonderful charity Sanctuary For Kids which began several years ago from the inspiration of Amanda Tapping and Jill Bodie. They had heard about us from one of our volunteers, a dynamic young man from Scotland who was helping Amanda with her website. 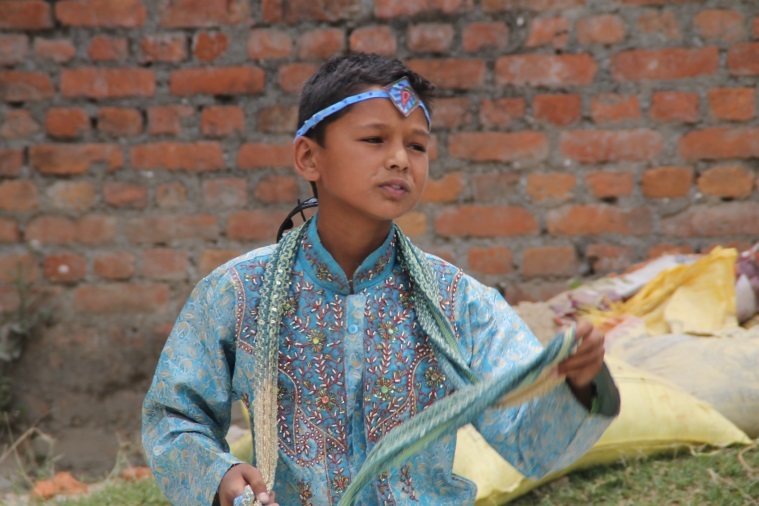 His praise was rewarded with a visit to NOH by Amanda and Jill which culminated in our being selected as one of the Nepali charities they wished to support. NOH never was able to buy the land we wished and planned for; it was simply too expensive and the original grant remained untouched all these years in our bank account. Then a few months ago we learned of a great house on a double lot that was supposed to be available for lease. I went to speak with the owners and they said they would not lease the property, but would sell it. They were charitable in the price they offered to us and I passed this along to the NOH Board of Directors who approved the purchase. I wrote to Amanda and Jill about it and asked if perhaps we could use their original grant for the purchase and they wholeheartedly agreed. 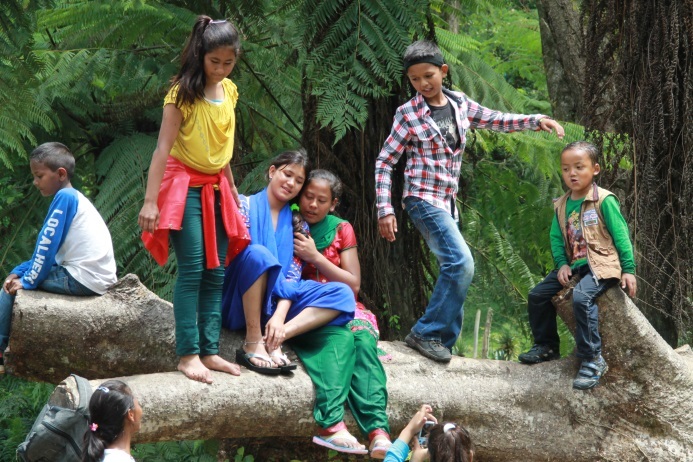 We had been looking for a new house for the boys after the earthquake, as well as for the Sanctuary girls. 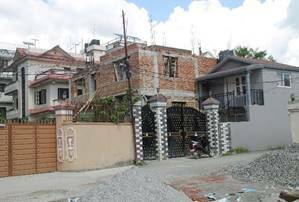 We found an ideal house for the girls a few months earlier and so decided to give our first owned residence in Nepal for use of the boys. Thank you, Amanda and Jill. 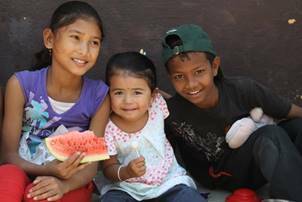 Please discover the special work being done by Sanctuary For Kids. 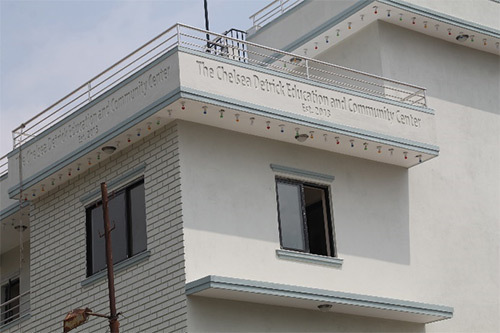 The Chelsea Education Center (CEC) was renamed the Chelsea Education and Community Center (CECC) when we began teaching English to the women of Dhapasi close to 5 months ago. 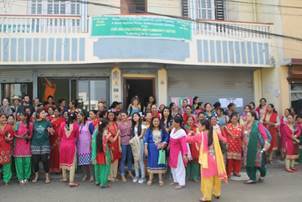 One hundred and twenty women attend daily classes of fifteen each. 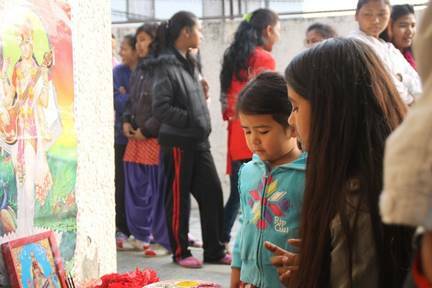 These women are dedicated students who can be seen looking up from their homework in front of their homes or in their shops to say “good morning,” smiling infectiously as I pass by. 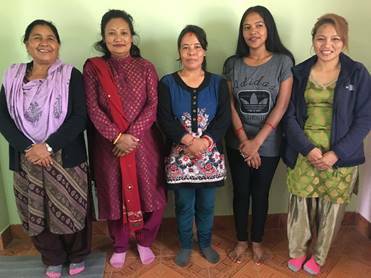 After the Tihar holiday ends we are starting to teach an online math program to 65 more women, many from the English classes. The course has been designed to introduce them to computers, allow them to practice simple English and to learn domestic and small shop accounting. The staff of the CECC. 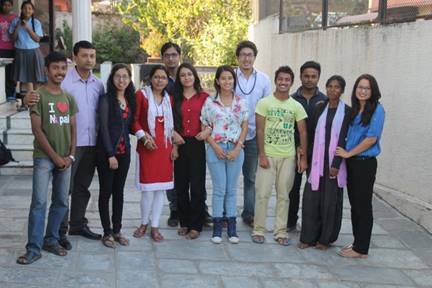 Missing is our daughter Kabita Karki. 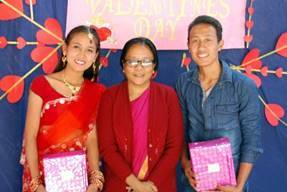 She, along with yellow-shirted son Ashok, teach English from 11am to 3pm after they have finished their college day which runs 6am till 10am. They are of course paid faculty and are very popular among their students. 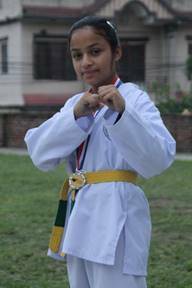 We have a new batch of 18 Taekwondo students who recently received their yellow belts after six months of preparation. 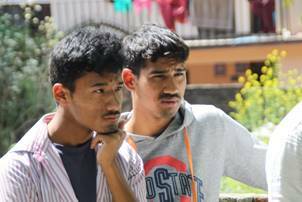 Our original group had lost its longest attending students, Saroj and Chham, when they decided to quit due to college scheduling problems. The remaining 16 tested a couple of months ago to receive their black tip and their next grading period, in another 8 months, will earn them all black belts. Waiting their turn, grading for their black tip & new group before earning their yellow belts. 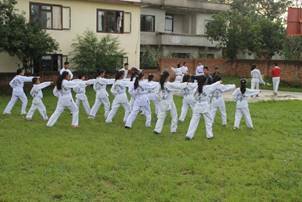 We began Taekwondo as a daily morning practice in 2008. 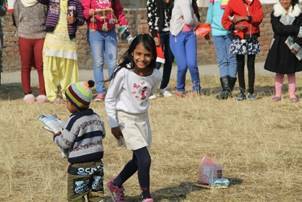 The children have shown a strong commitment enduring predawn sessions in the cold of winter and heat of summer as well as time lost to early morning study, but they all are achievers and handle all aspects of life well. Our sewing group has been working hard. 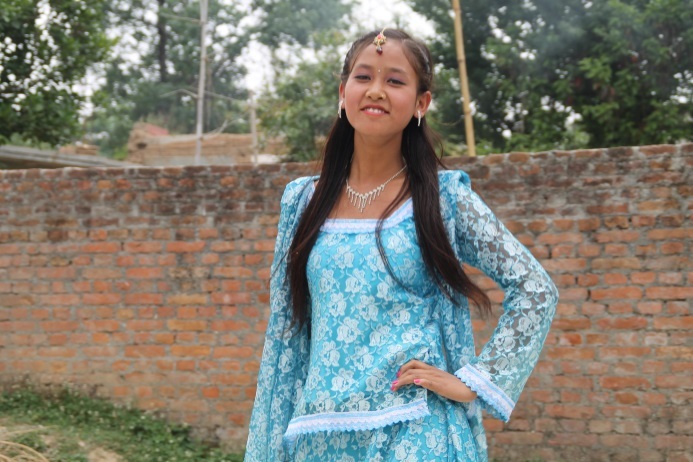 They stay busy making all of the children’s uniforms and kurta sulwars and they have dabbled in design of clothing that emphasizes originality. 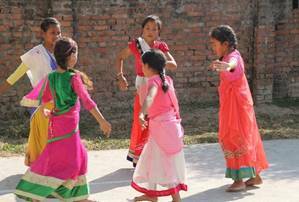 We had applied for a grant to have our children make all the uniforms for the Ramechhap School we support, but lost out for this year. 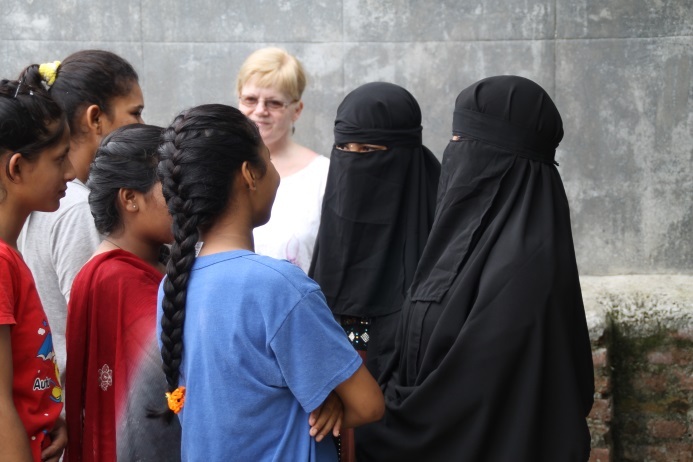 We are presently working with two former volunteers from Switzerland and Germany who spent time with the girls and have ordered 10 “original” kurtas. The girls finished them and they are now with me waiting sending. 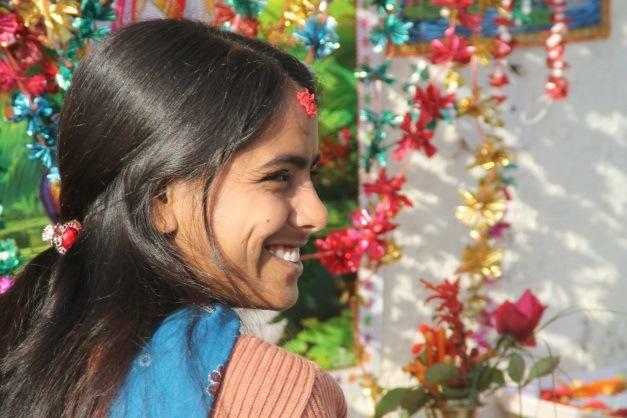 Sunita wearing one of her designs. We are selling these in a market making price of $10 plus shipping. The girls keep all the money and pool it to help grow their business. Please consider making orders. The array of fabrics here is quite good, many of the designs ordered from our volunteers were with the idea of pullover beach wear or après beach with jeans. To order, please simply write to me with questions and style suggestions. We use a sizing chart for western women found on the internet, but will happily work from your own measurements. 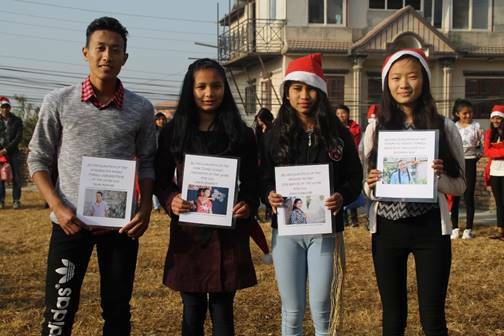 Missing from the photo is Samjhana who remains in school and works only on Saturdays. 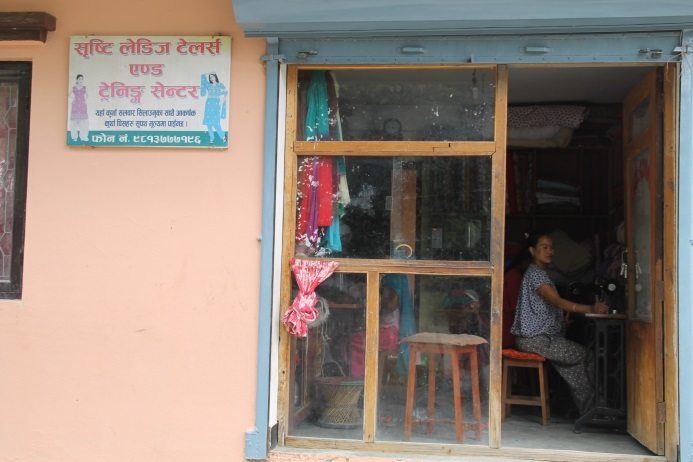 Amrita and Puja have been hired by our tailoring instructor to work in and manage her second shop. 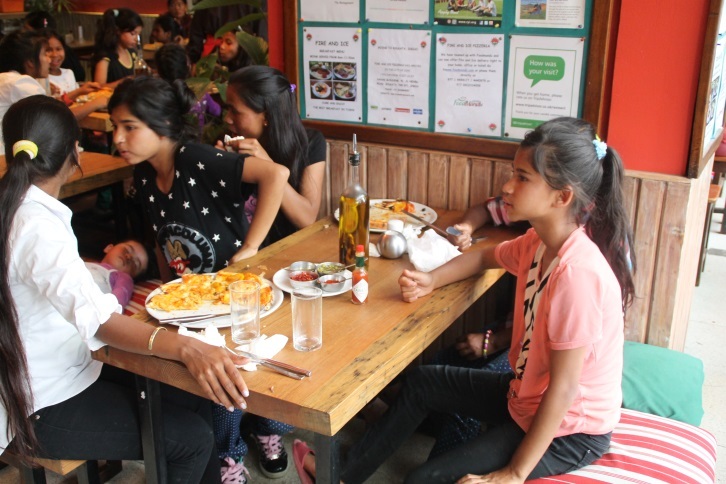 Sunita and Kamali help us at tiffin time by running the sales counter at Café Hope, our school café; Sanu augments her tailoring income by taking care of my house and garden every other day and Lalita goes to the shop at 11am after her college classes finish. August 29th was “Brothers Day”. 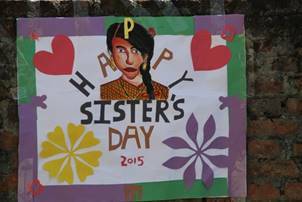 The girls organized a day to make all their brothers feel special, appreciated and loved. 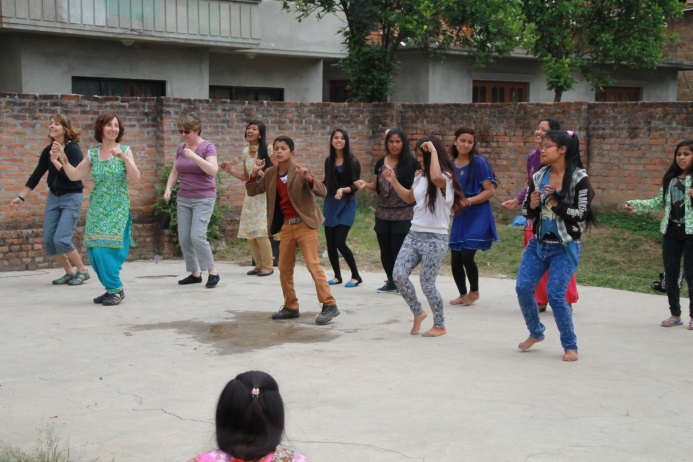 It was, as always, a fun day with singing, dancing, theater, games and laughter. 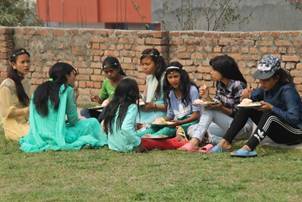 The girls prepared all the food for a many itemed lunch eaten picnic style on the grounds at Papa’s House. Two of our many real brothers and sisters in our family, but the children all have a deep feeling of fraternity with one another. 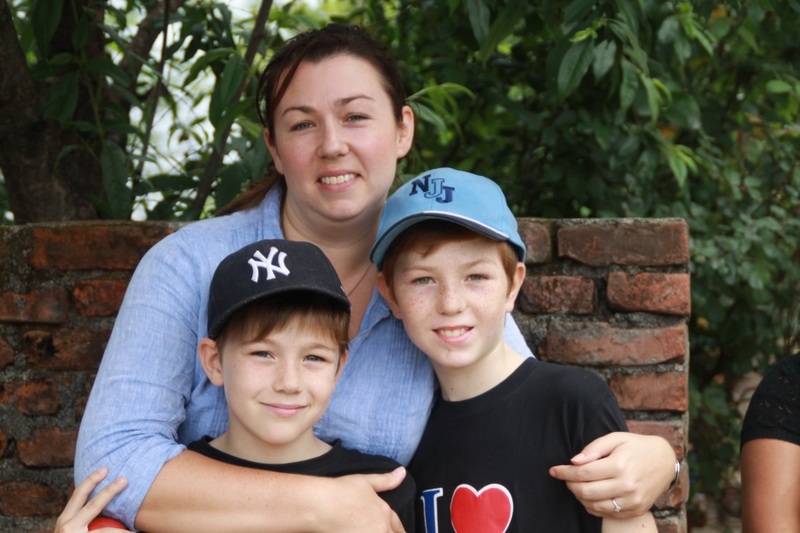 Jennifer Hyett has been a returning volunteer for several years. 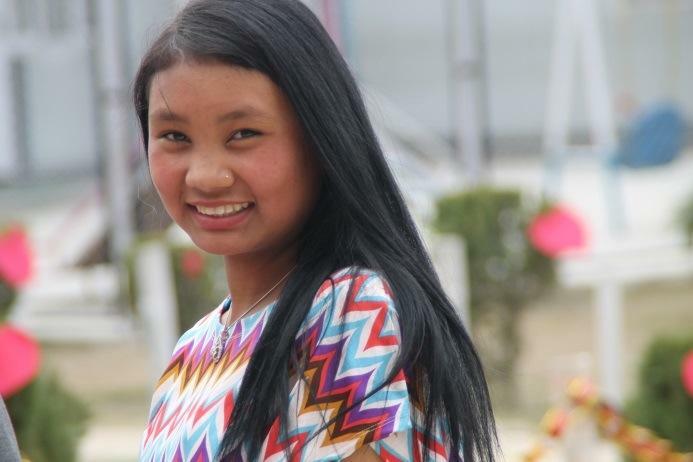 Her primary work here is with “Our Children’s Protection Foundation,” a small orphanage near us that we have been helping for a few years now. This past visit Jennifer brought her mother Elizabeth who is 100% Scottish determined and kept up a heady pace of work both at Our Children’s and with our children. 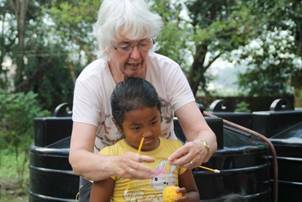 Some of the most rewarding times she spent here, for our children, was in knitting with them. 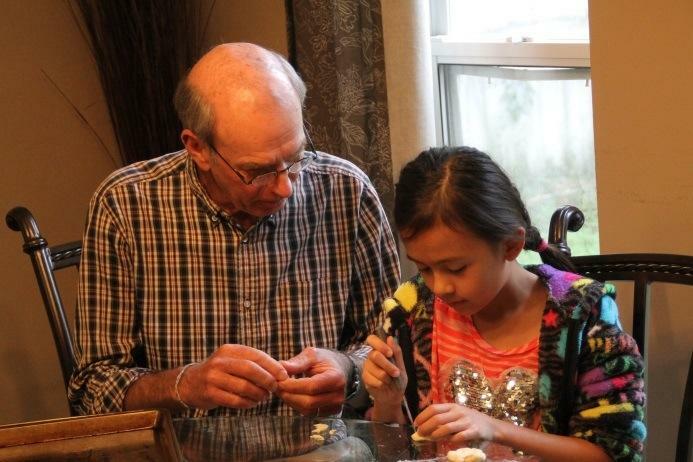 We love volunteers like this and would encourage other retirees to consider the same. Sisters Day came on October 3rd this year. The boys outdid themselves in planning and performance. It is really nice to see how the boys, on their own, put together a program, practice it for a month, older boys helping with dance routines and skits by the younger ones, and everyone truly admiring the individuals’ effort. 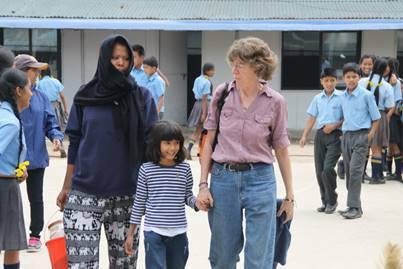 Our Book Club has had the leadership taken on by Deb Norton and Jacqueline Crowe, two Australian women whose husbands are in Nepal with the Australian Government. The club meets after school every Tuesday and Thursday. 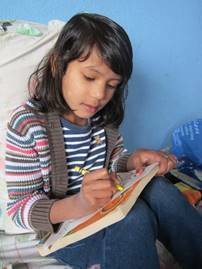 The children are discovering the love of reading and becoming good readers in the process. 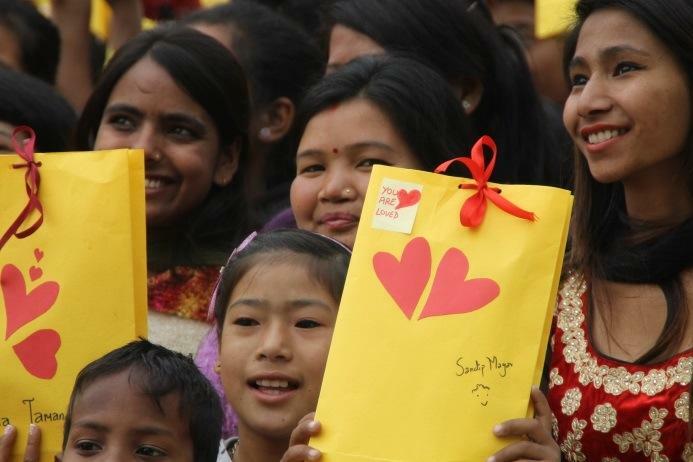 We really appreciate the time, love and effort these marvelous women are giving which goes well beyond the classes themselves, but into the heart of our homes. ​The Book Club. Deb Norton in white with Jacqeline behind her left shoulder. 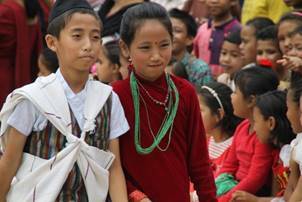 On the morning of October 16th 55 of our children boarded a bus back to their villages in Dang district, a 12-hour ride into a simple, farming, mud hut, hand-to-mouth existence from which they came what seems a lifetime ago. 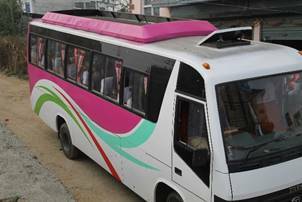 With the previously mentioned petrol problem, we had a very difficult time chartering a bus; it took days for the owner/driver to accumulate the necessary diesel. For the first time in 8 years I did not go with the girls; I was unable to find petrol for the scooter and in Dang no petrol existed either so my work there would have been impossible. 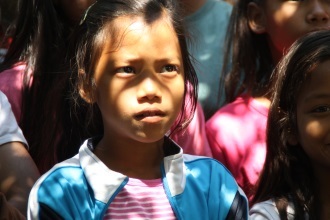 In the days before, we managed to get thirty-five other children back to their far-cast villages. It is never easy to say goodbye; the closeness of the family is expressed on these mornings in tears. 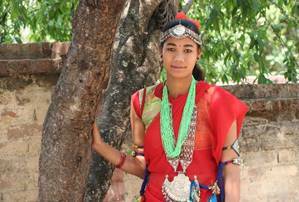 Going back to their villages is a personal choice. 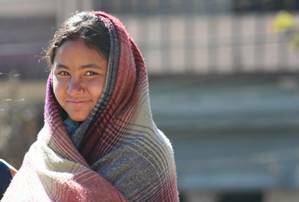 They are often not appreciated and are made to feel a bit alien in a family fractured many years before when they were sold, a family worn down since by severe poverty, illness, alcohol, illiteracy, and death further hardening them as their numbers dwindle. 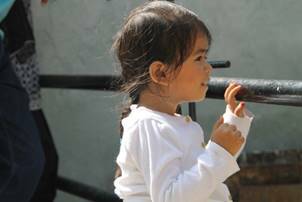 To me it is a hallmark of our children to continually return and quietly roll up their sleeves and help where they can while often under the disparaging comments of a non-nuclear family bitter in spirit. 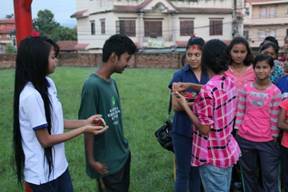 We celebrated Dashain on October 22nd sharing the day and traditional Hindu feast with several of our volunteers. A much smaller family, we had a light and warm time together, but each of us lost at times in thought of those not with us. 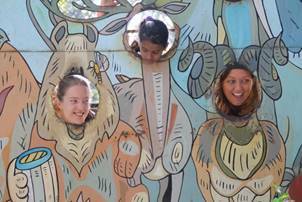 A day at the zoo, October19th. The animals, we found out, sleep at midday. 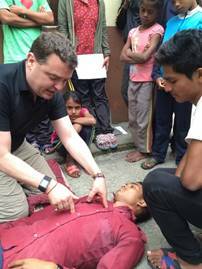 Today we had an arranged visit by Chris Ellis, a Sydney Australia Emergency Room Doctor, who had met Deb Norton and was eager to come and teach a course in first aid. The information was comprehensive and covered everything imaginable, delivered in a very lighthearted way which the kids and I will remember for a very long time. 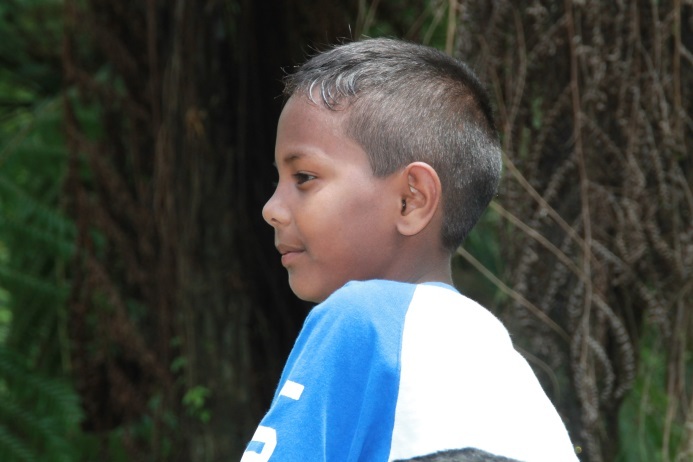 Our patient Kamal had a pretty bad day suffering everything from a common cold to brain infections, diarrhea, vomiting; he was burned and choking, had a severed artery, a cut vein and he was in an auto accident near the end. Thank you very much for your wit and wisdom, Dr. Chris Ellis. 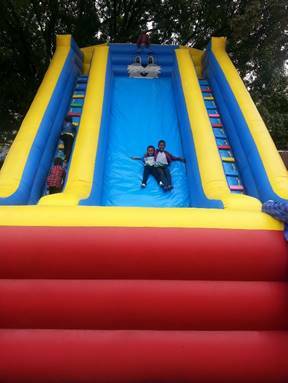 Children’s Day was held on September 15th at Skylark School. 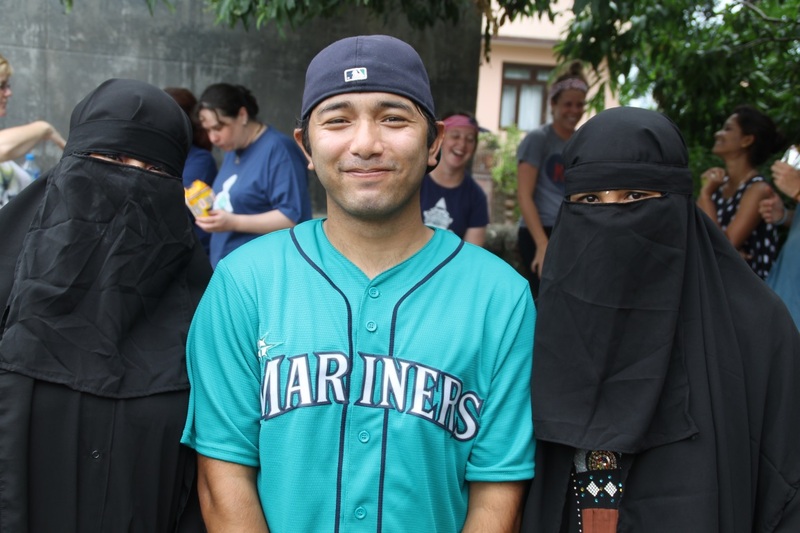 Among the day-long festival there was a costume contest. 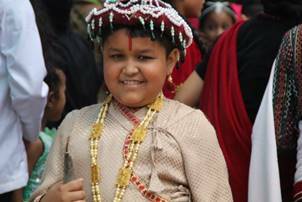 The children dressed as characters in Hindu scripture or in their native dress. 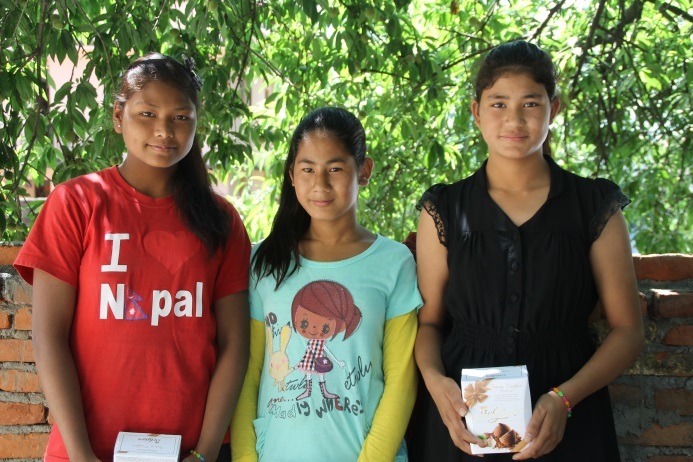 Anita, Imagine House; Cila and Deepa, Sanctuary House and Sam, Possibilites House. 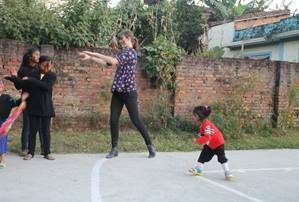 The three girls came to us as young children and grew into this role, Sam has been working for NOH for around 5 years in different capacities and makes an extraordinary manager for the boys. Missing from these story breaks are the girls of Harmony House, known here as Papa’s House, and those of our college boys’ house. All the children’s photos and names can be found in the gallery here on the website. 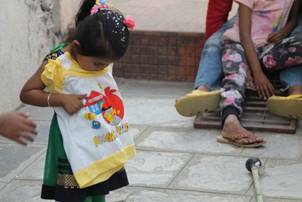 Nepal Orphans Home received an incredible outpouring of donations after the earthquakes, designated for earthquake relief. We were deeply touched by the faith in us to properly distribute these funds as directed by the donors as well as by the sheer display of kindness and compassion from several hundred donors. 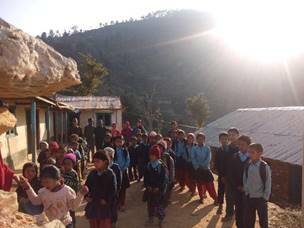 We have left to distribute the funds earmarked for rebuilding the school in Ramechhap, though a lot of other Ramechhap relief was immediately dispatched after the earthquake. 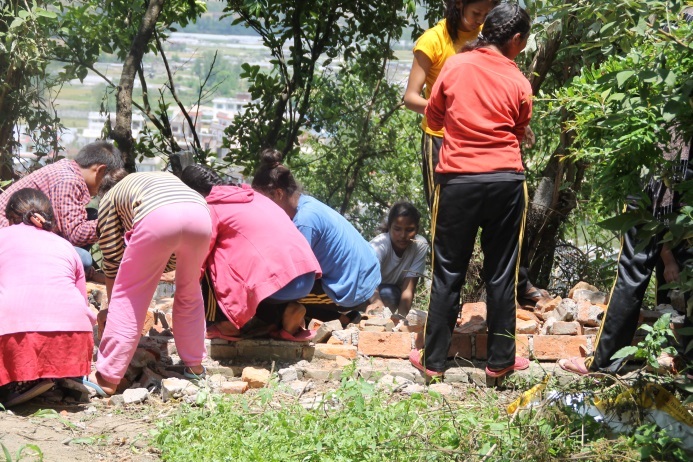 The school rebuilding has been a long process, but now with the monsoon over, the engineering for the school finished, and the government’s position on school rebuilding participation noted, we will begin construction. 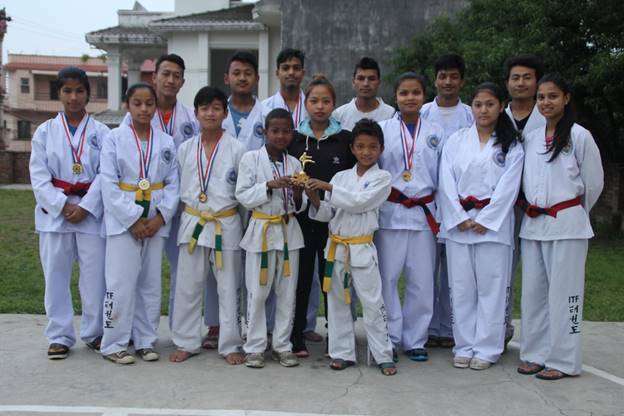 The Final Term of the 2014-2015 year at Skylark School saw us take the first position in 4 classes out of 10; 2nd position in 7 classes out of 10 and 3rd position in 3 classes out of 10. We believe that the children’s hard work, love of learning, and the existence of the Chelsea Education Center have all contributed to these excellent results. 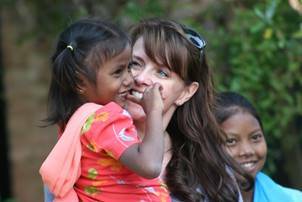 Laurie Levine of the NOH Board arrived from Sydney, bringing her abundant love for the children. Laurie manages at least one trip each year. Laurie is a teacher, speaker and author of books meant to help us to live a better and more purposeful life through spiritual affirmation. 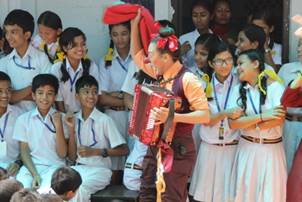 She has delighted in watching the children grow into such radiant and accomplished young people. Returning volunteers, accompanied by their children this time, were inspired originally by Laurie. Our friends, Fuchsia and her very special sons Noah left and Ridley, and Misty and her precious daughter Charli brought a lot of insight, love and joy to our children. And Hope found a big friend in Misty’s partner Clint who offered her endless entertainment. 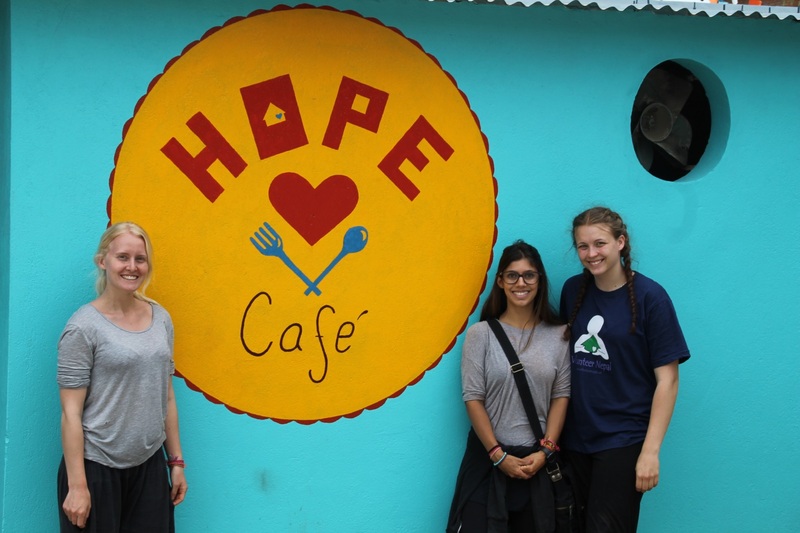 Three wonderful young women (Linn on left from Sweden, Mariana from Brazil and Erika also from Sweden, but only here meeting Linn) who met as volunteers two years before and stayed in touch, reunited again at Volunteer Nepal and among many projects for the kids found time to decorate the café. Also returning for their third or fourth time my beautiful cousins Anne and Liz, their close friend Cici and bringing with them for the first time my Aunt Judy, her niece Meghan and friend Kelly. 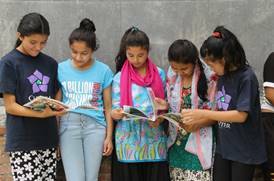 This group had been planning their trip for quite a while and wasted no time in bringing books, art and dance to the children’s days. 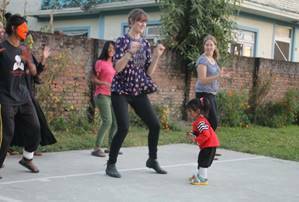 Anne and her two daughters had been a part of the Billion Rising Dance phenomenon and decided that we should hold one in Dhapasi, so they managed to get the others trained in the dance and upon arrival began preparations for it. 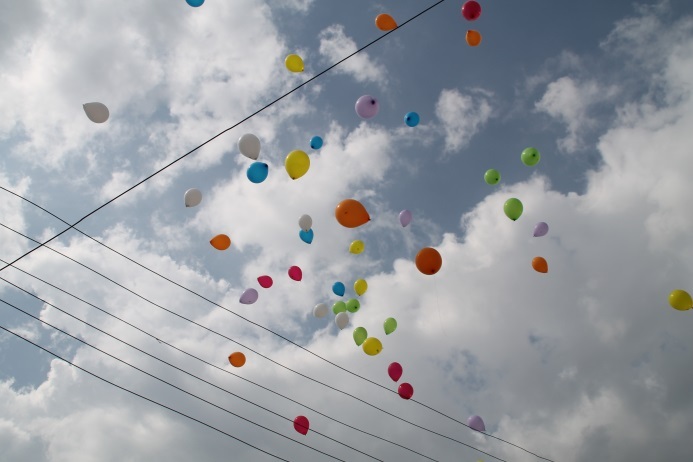 And finally a radar filling release of balloons rising along with the consciousness of each attendee watching with eyes shielded against the sun until the balloons left our sight. We then turned our attention to bonding over more grounded joys: strawberry, pistachio, chocolate and vanilla ice cream. 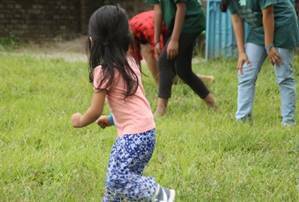 Moments after the first quake, after being sure that the children and staff at the house where I was were safely together in our open ground, I raced on the scooter for Hope. The road was littered with debris, people dazed and bewildered, wide eyed and incredulous; dust filled the air where buildings moments before sat purposefully, it seemed so random. In those moments, not knowing what I would find reduced my life to one simple knowledge: love is all there is. 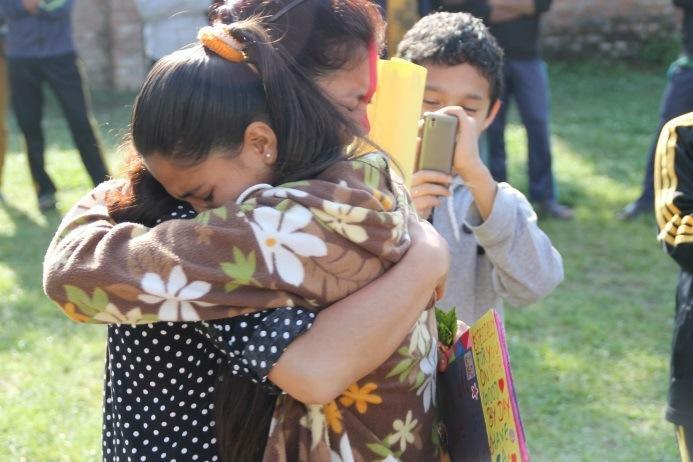 I prayed so hard to a God I hardly know, “Let them be okay.” When I found the house still standing I came through the gate and in a distant corner of the yard Anita was holding Hope who was crying, surrounded by the children who were all terrified. I ran to Hope and when I took her into my arms she hugged me so hard and stopped crying and just held on. Then she wanted to tell me what happened and did so by holding her fist in the air and shaking her body as if suddenly possessed by St. Vita’s Dance. I had to laugh and then she did also, and I knew we were going to be okay. 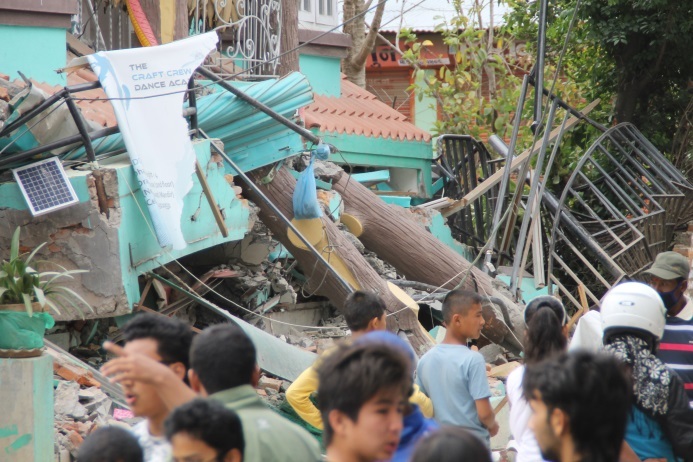 Thirty minutes later I had been able to go to each of our houses and make sure everyone was okay and then guide them back through streets filled with broken glass and rubble to be together on our main ground. All the security walls that surround every house were gone and our main ground, large as it is, was filled with people huddled together. When all the children and staff were together we were okay. We sat in a tight circle and ate the lunch I had earlier prepared with 2/3rds of it surviving and rode out several very powerful aftershocks; there was strength and comfort and even some private humor among the children and staff that helped them get to a point where, with gratitude for our good fortune, we were ready to move on. 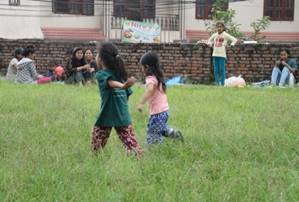 An hour after the earthquake I asked the children to circle around and as they did I took some photos. 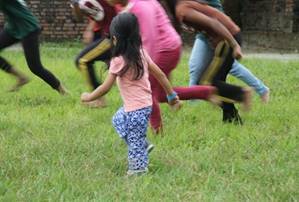 Each of these children felt attacked by the earth; the floors they were on buckled and rolled, leaped and lurched sideways, violently throwing them to the ground. These small people felt they were going to die. The night of April 25 was perhaps the longest night any of us had ever experienced. 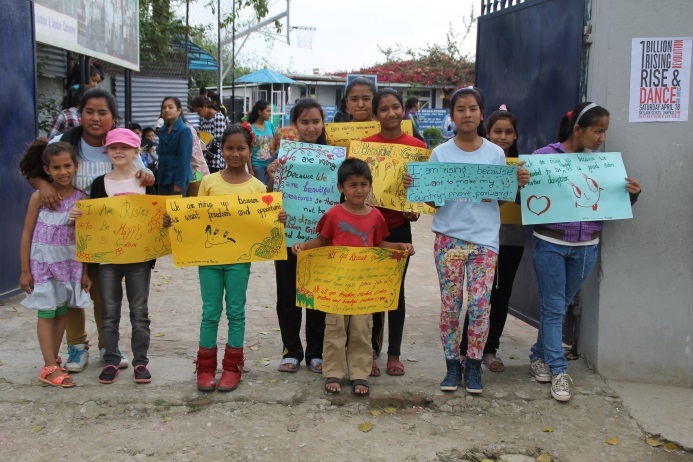 I had convinced all the children that they were safe and that nothing so strong was to come again, there would be aftershocks but not enough to do further damage. 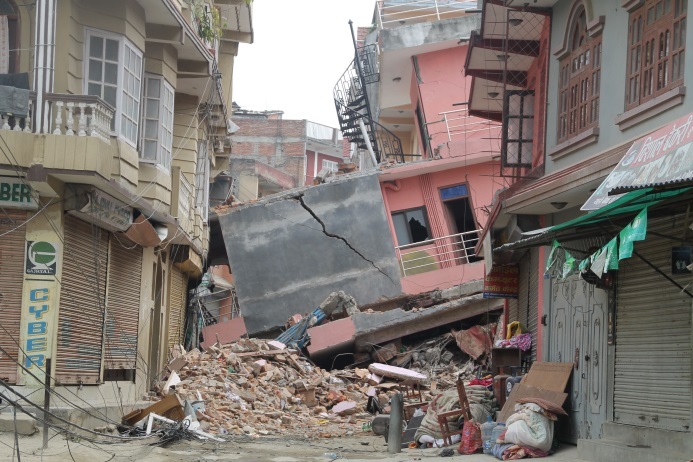 There wasn’t a soul in all of Nepal I think sleeping indoors that night and as we saw, it took 6 weeks to get people who had homes back inside. 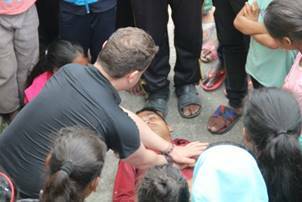 Sleeping outside was not safe for all our children and the children trusted me when I said we would be fine. In each house the children slept in a single room together near the front door. Several times in the night a sound like a barrel of rocks rolling out of control down a metal gangplank would pierce the night, the floor would shake us like a pebble in a miner’s sifter. Outside the community would wail as if the end had come. There wasn’t any electricity, so water which comes from a well by pump was nonexistent. But the underground tank in my house is kept full, so we spent a couple of hours in a bucket brigade bringing water to the main house. 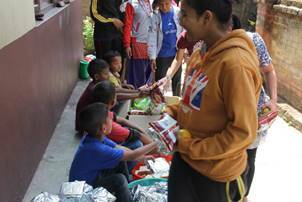 Midafternoon on the 25th, Sam, Anita and I bought as much gas, dhal, rice, and biscuits as we could and got those distributed among the homes. 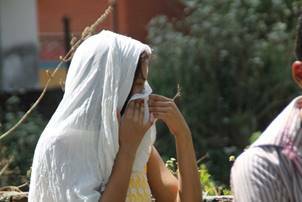 We bought lots of medicines in anticipation of the suggestion that Kathmandu might become a breeding ground for disease, and we had earlier purchased masks. Then the shops closed their shutters and remained closed for some time. 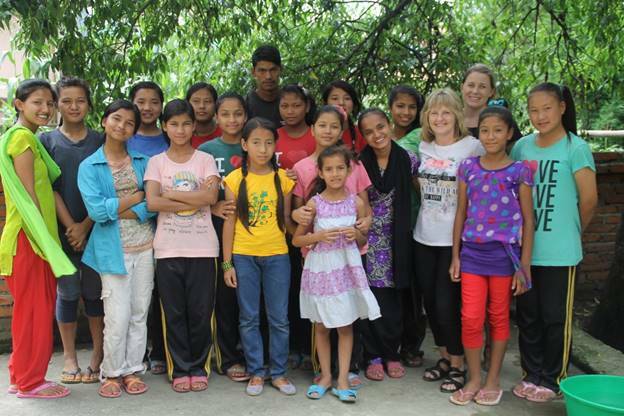 We divided the girls of our Sanctuary house into two groups and had them sleep at the other two girls' houses. The boys split their time between the ground floor kitchen and outside under a tarp they had set up. 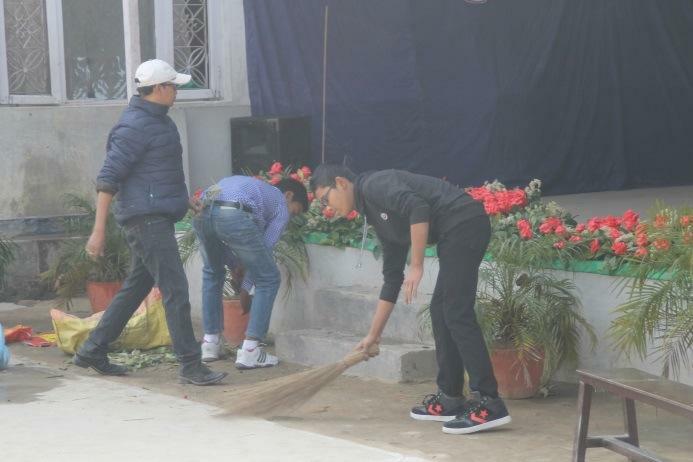 We began clean up on the second day. 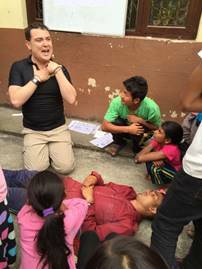 Neighbors under their tarps watched listlessly, their faces drained. The confusion of the neighborhood was keen, everyone grim. 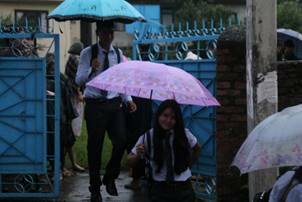 The rain would come and go and the certainty that another massive quake was soon upon us was all they spoke of. 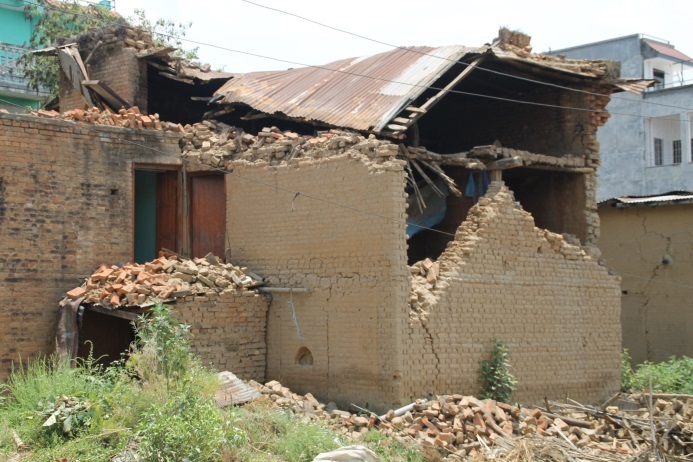 When an aftershock would come you could hear voices rising together in panic, moaning until it subsided. But with each passing day we grew stronger and accepting that whatever will be we are together and will not dwell on it. We stayed busy. Nights were long; all the children huddled together in a communal area near the door, but gallows humor prevailed. 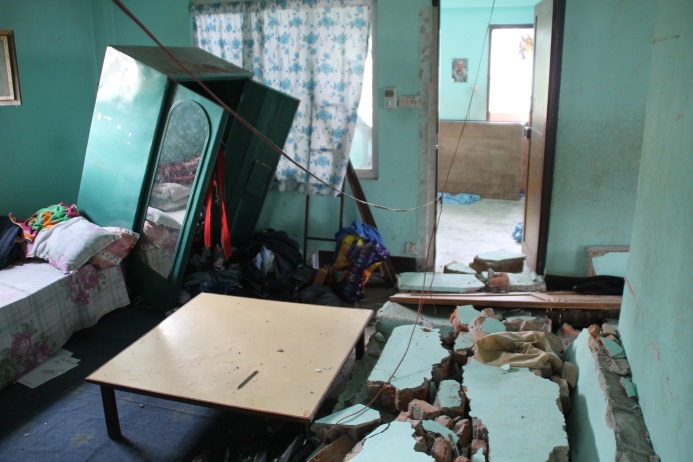 Loud aftershocks in the night were the worst and we welcomed early morning. Each day at five am, like before, we would go for a walk together, visiting the other houses and greeting neighbors in passing, spreading as best we could a sense of good cheer and lack of worry. Hope’s Birthday! We decided to celebrate it well. For a few hours all was forgotten, the kids talked, danced, had ice cream and cake, took lots of photos and laughed. During these times when we all get together we find parting at the end difficult. With the frequency and strength of aftershocks and continued talk of odds favoring a massive earthquake coming at any time, things grow quiet as we part company. Many of us try to keep the atmosphere easy, but I see the children searching the eyes of their brothers and sisters as they shake hands and say something light that betrays their concern. 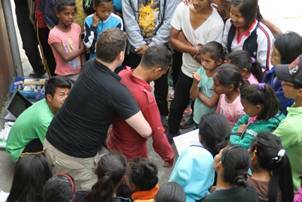 Today we welcomed into our family a brother and sister who had been orphaned a few months previous. 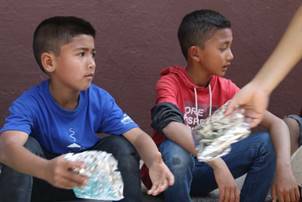 They had been taken in by a woman and her two sons temporarily while searching for a home that would accept them. None would. They were at our gate last Saturday at exactly the moment the earth started punching and kicking up through the surface, and sat with us for a few hours before walking back to their own home which was now a pile of debris. 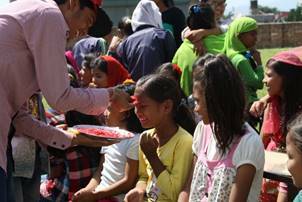 Today, at the same hour as a week before they again were at the place where our gate once hung and walked in to see the ground filled with happy children. On the previous Sunday as we sat around talking after our early morning walk, we decided to have a fashion show to be held on the following Saturday. 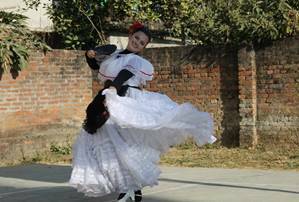 All were invited to participate in an age-divided event that included Best Dress, Best Hair, Best Make-Up, Best Catwalk, Most Original and Most Transformed. 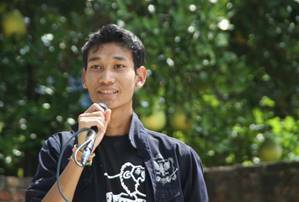 Dhiraj, our resident tech wiz, handled the music while Kausila and Bumikha were our MC’s. The skies were clear, the children in the audience very supportive and fun, the participants showing off some truly unique ideas were gorgeous; 21 children were awarded prizes, and we had another opportunity to forget what lived underneath us. 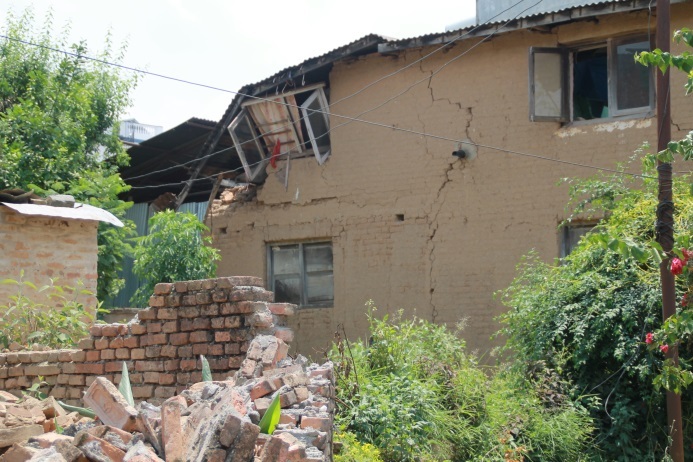 A second earthquake came and finished off buildings previously damaged. These pictures were taken from the yard of Papa’s House. Everywhere one looks this is what they see, reminders of the moment are the children’s new landscape. 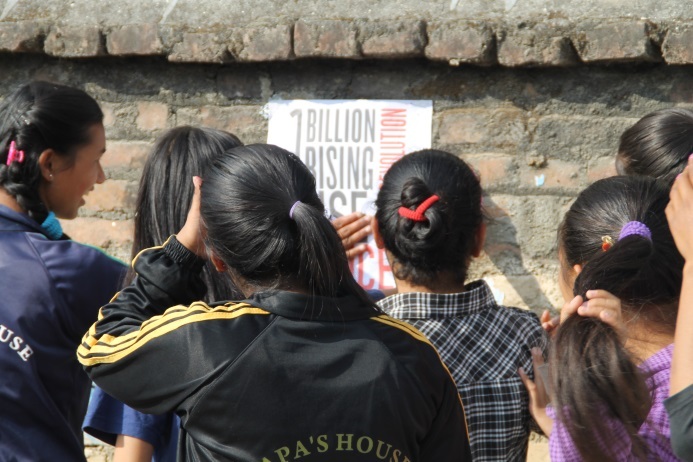 It had been over two weeks, aftershocks come loud and quick so many times in the day and night and everyone, including scientists, maintain that they would not be surprised to see a magnitude 9 anytime. It is a huge setback emotionally that after a couple of weeks when you have accepted aftershocks as something to live with, another earthquake hits. 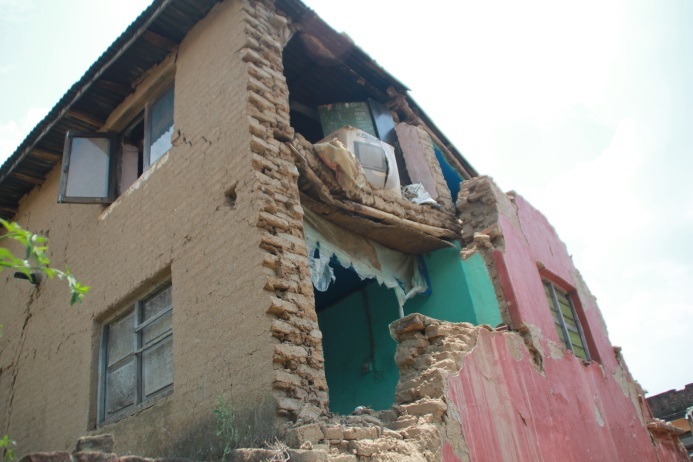 This one made buildings sway to a point you feel you must be imagining it, and then again aftershocks which make you wonder how much more our houses can stand. Despite the new earthquake we forge ahead with plans. We are together and after lunch we gather the children around to award the prizes for our latest writing contest “My life in Five Years” We enjoy having writing contests; all the children enter them and we save their entry and put them into their permanent file to read over and share with their own children one day. We rented buses to take us to The National Botanical Gardens. The ride there pierced through the widespread destruction of the quakes, but the last 5km was on a narrow road under a canopy of trees where the sun comes in sprinkles through the bus windows and everyone feels as if they are entering an enchanted forest. We found the parking lot empty and the small staff of the gardens surprised by our presence. We had the place to ourselves and took full advantage of it. It is my dream to be playing in a tidal pool in Maine with Hope. It will be early fall and bursting with color; sea smells and a warm sun like a loved one’s hand on our back. The Gardens is a beautifully manicured and thoughtfully designed 100 acres or more with a stream meandering through it. The water runs cold and shallow over small rocks and in some places collects in quiet swirling pools. Hope and I stopped by one and there we felt stones and watched our hands glide along the rocky bottom. A pleasant prelude to my dream. We walked the length and breadth of the gardens and strolled through the greenhouses; we placed no demands on the children, but they all stayed close, perfectly happy to follow along and be together. We found a good spot for our picnic and everyone pitched in to make a light task of it. After eating we lingered, quietly soaking in the warmth and sounds of nature. After some time we fought our inclination to sit forever and rose to the uninspired business of heading back to the buses. We arrived at the gates to some panicked employees asking us to go and sit a spell longer because an earthquake would be here soon. This is the world we live in; people exercise such a willing departure from reasonable thinking. We convinced the jittery staff that we would take our chances and asked them to open the gates. We boarded the busses and drove silently back home, everyone deep in their own thoughts. I decided to try and find a safer place for as many children as possible. 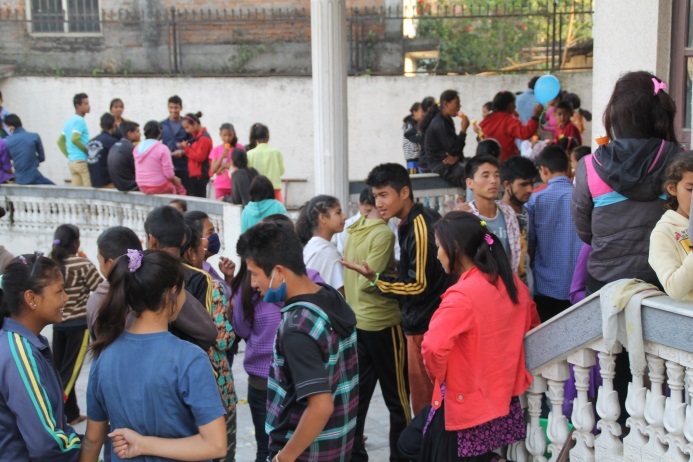 Yesterday was spent calling relatives of our children who live in areas that have not been affected by the earthquakes. 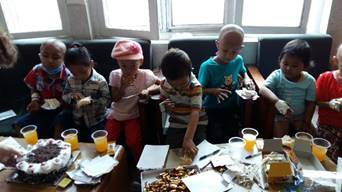 This constituted about 80 children. We hired the same bus which took us to the gardens and had it come this morning. 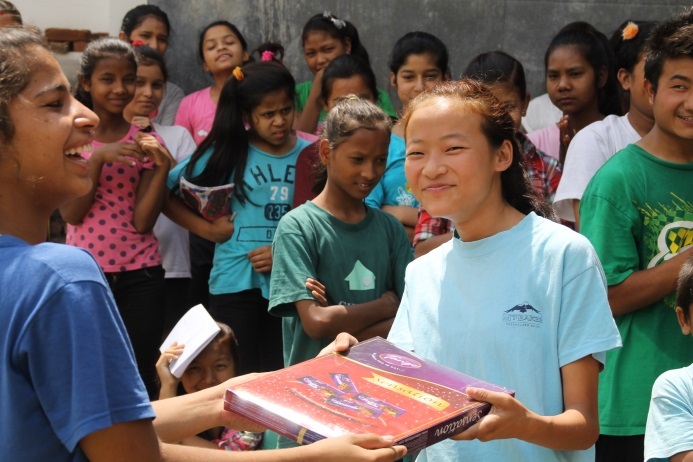 We loaded up 50 of our girls whose villages are in Dang where not a hint of trouble has come and, with Papa’s House manager Anita Chaudhary, sent them back until things settle down. By nightfall we had said goodbye to another 30 children. 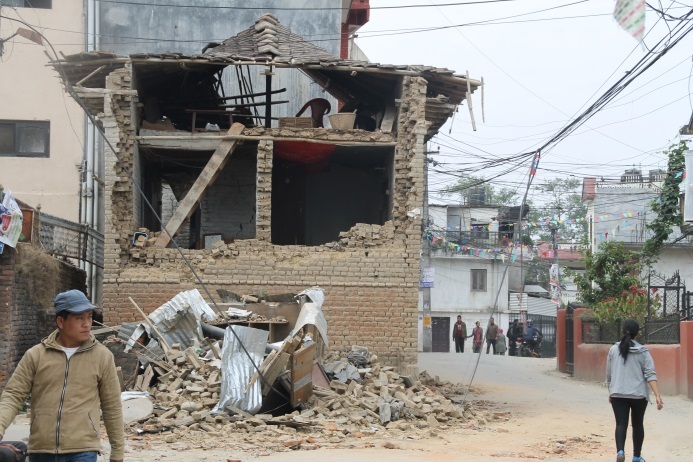 After the second earthquake, the little bit of ease that had crept back into people’s feeling of security was replaced with a fresh new wound. 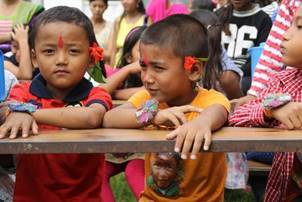 Plans to reopen school were scuttled across Nepal’s affected districts. 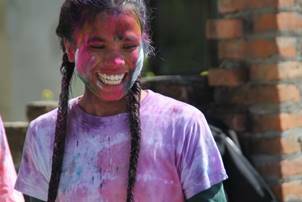 We had a paint crew inside the Sanctuary girls' old house and they quit work saying they did not want to be inside the house at this time. It took three weeks to get them back to work. Our remaining 55 or so children combined into two homes and we had fun. Our days were busy with work on the new Sanctuary House, or in the gardens, or in removing our old wooden beds and carrying them to the carpenter who had bought them and then carrying the new metal beds to each house and getting them set up with the new mattresses. We cleaned every room thoroughly when replacing the beds, played games, took long walks at sunrise and ate well. 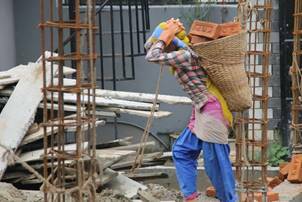 Kathmandu is growing deserted and, with few willing to work, supplies are getting short. 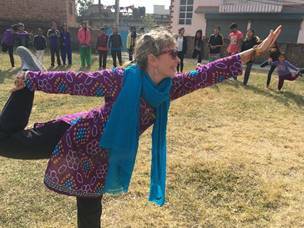 We arranged for a bus to drop us off at a place in Thamel called “The Garden of Dreams,” two acres of high-walled compound filled with coy ponds and Roman-influenced gazebos, meditation areas and places that invite one to lie down and sleep. Sadly we found all the architecture roped off due to severe damage, but the grassy areas were green, the fish swimming happily and the sleeping areas welcoming. These are gardens designed to induce quieting the soul, to speak softly and to generate smiles from the heart. We brought along all the day staff and their children as well. After our spirits were refreshed, we walked across the street to “Fire and Ice,” a legendary tourist pizza palace. We had earlier made arrangements and gave a preorder of 61 pizzas; we were treating ourselves to an extravagance that was to please all our senses. One thing about an environment of pervasive concern: it helps you to let go just a little and enjoy some simple pleasures today, not tomorrow. Once we are comfortable with the knowledge that there are many tomorrows yet to come, we can make up for these unordinary indulgences. All of our children are back and we have enjoyed our Saturday tiffin together. 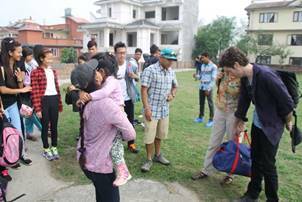 The returning children had to get reacquainted with the daily aftershocks while those who had remained felt like old veterans who could offer a sense of calm and sage advice. 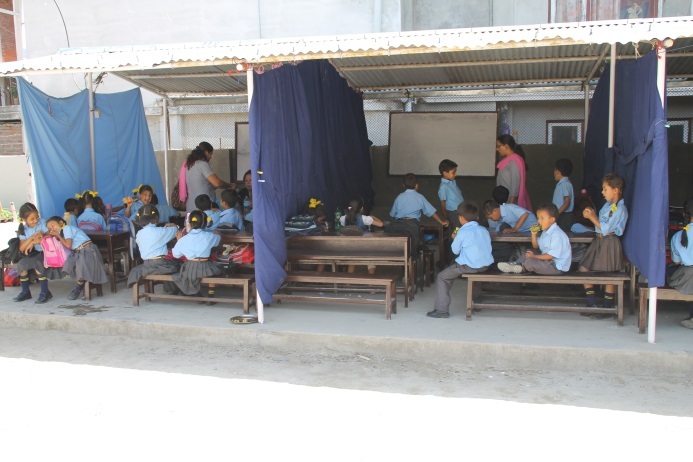 School began again on Sunday the 31st, the largest classroom building at Skylark which has three floors was deemed unsafe and so temporary classrooms were cobbled together. 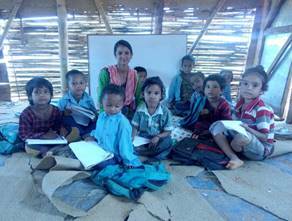 Teachers drifted back in from their villages and bit by bit we are getting to where a full complement of them are where they should be most of the time. June seemed to have swept through as uninterrupted as tumbleweed across the desert. 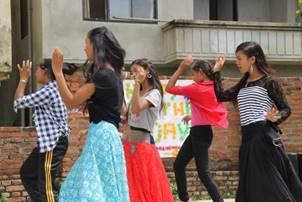 We had the winners of the “Me and My Earthquake” writing contest receive the admiration of their peers and their prizes one Saturday, another Saturday we had a celebration of June Birthdays. Saturday lunches were different and fun, mostly tasty ones of assorted color, my trademark. We welcomed back many far cast members of the family. 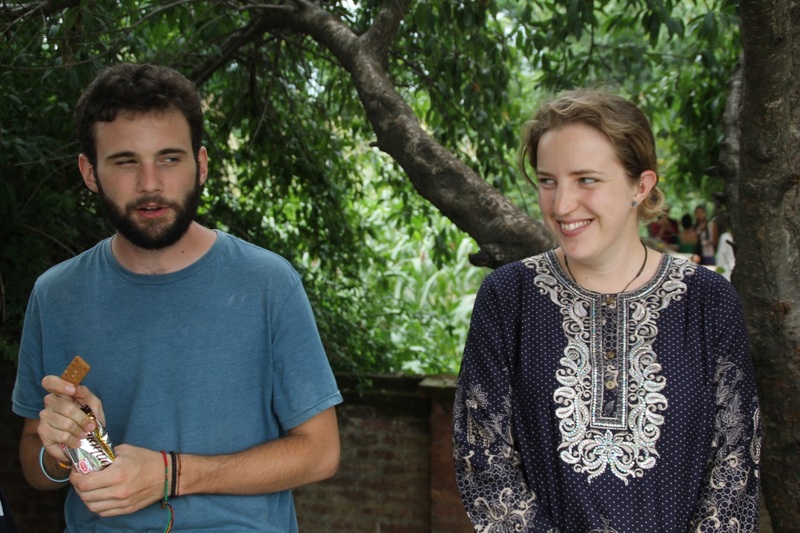 Our former Volunteer Nepal Director Michael Triozzi came from a break in his graduate studies in Italy to manage the boys' house while Sam was in America; he also stepped in to manage the Volunteer department while Eileen is back in New Zealand for a spell. Michael is still here and more narrowly focused on Smiley the dog and the Volunteer department followng Sam’s return. 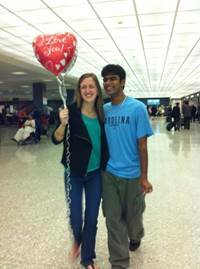 Vinod and Alecia have returned after three years spent in college in North Carolina. 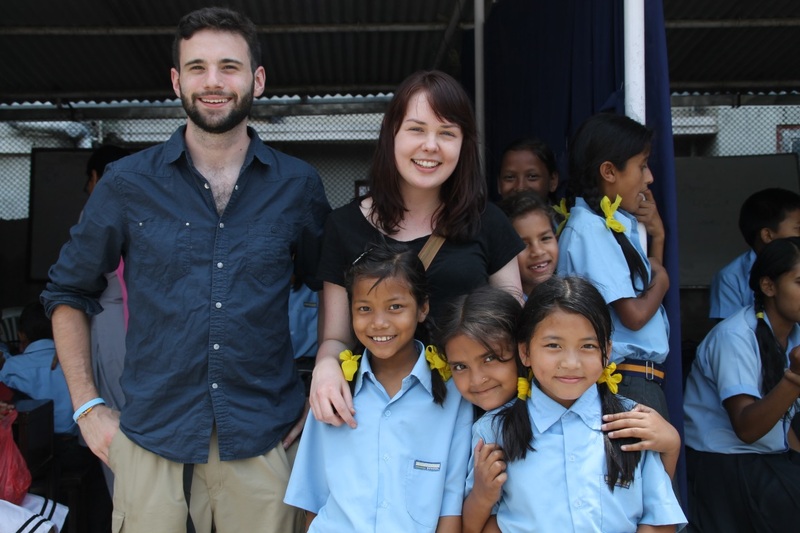 They will be here for six weeks and both are working hard to help with the children. 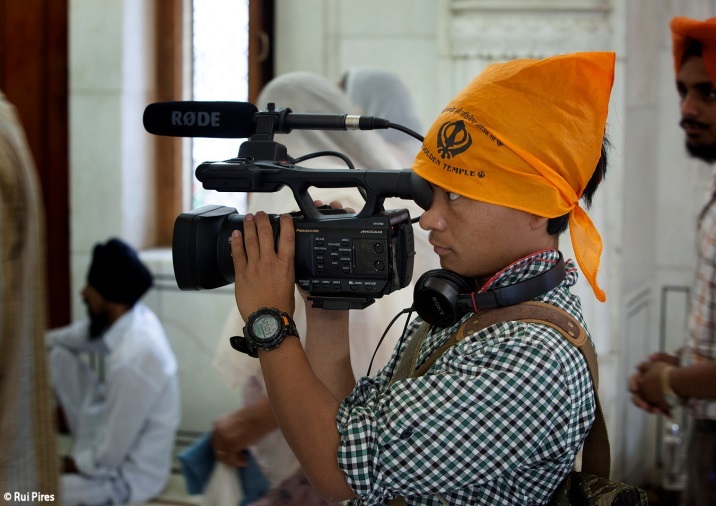 Chham was invited to accompany the internationally recognized photo journalist Rui Pires and learn how to be an assistant during a three-week trip by train to a few cities across India. Rui is a good friend to NOH and in a previous trip got to know Chham well. 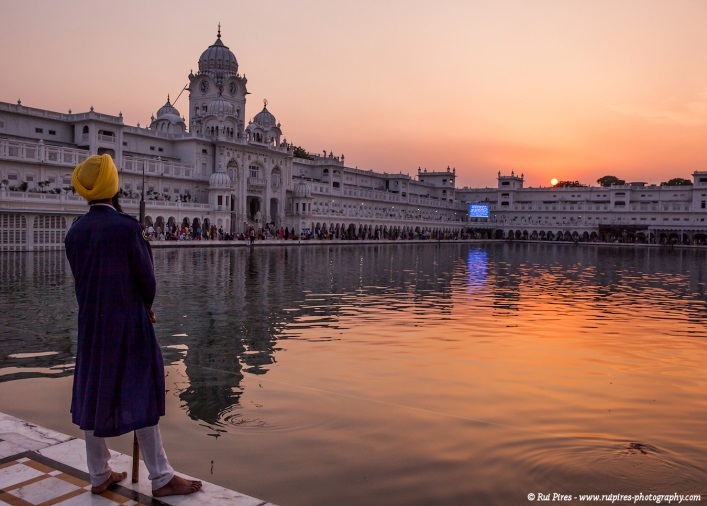 This was a wonderful opportunity for Chham to travel and learn about the different cultures of India as well as developing a keen eye and passion for beauty and how to capture it on film. The following photos are all taken by Rui and kindly shared by him with us here. Rui Pires has for two years in a row won the International Humanitarian Photographer of The Year award; we are humbled to call him our friend. 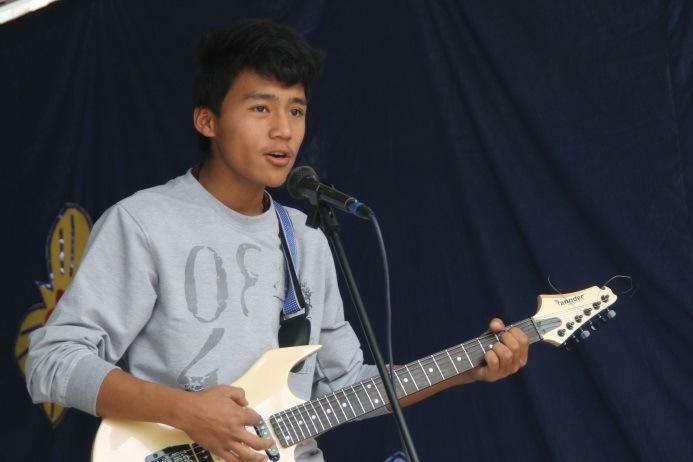 One of our newest sons Bimal is not only exceedingly kind and polite but he possesses an array of creative talents. 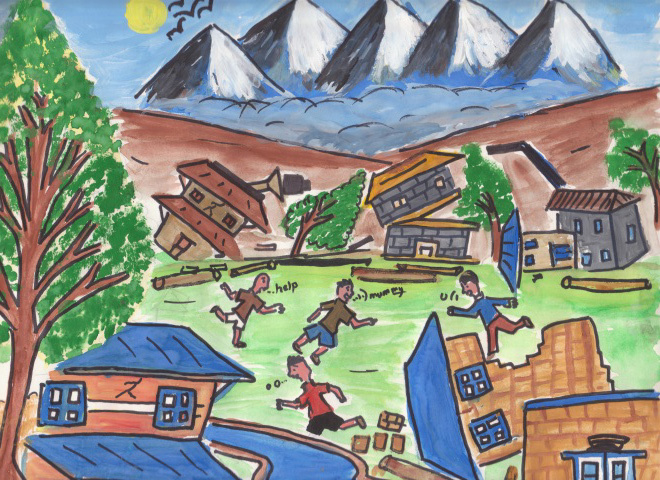 After the earthquake I encouraged the kids to express their feelings and Bimal did so both in writing and in a painting shown here. I was so impressed by it that I shared it with friends online. One thing led to another culminating in someone wishing to purchase the painting for $500 and wanting to see more of his work. 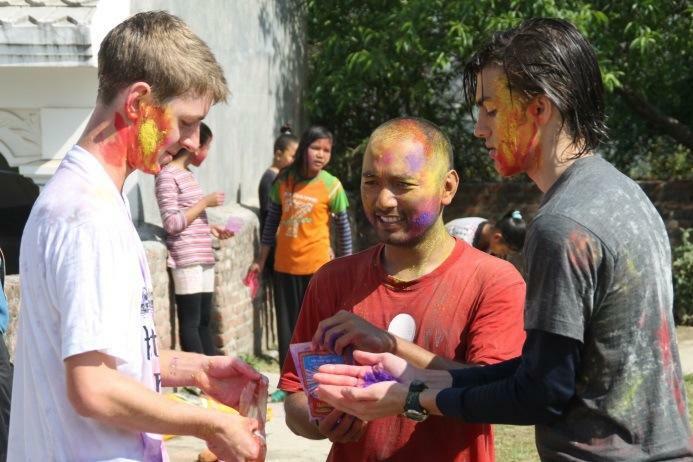 They had a friend traveling in Nepal at the time and he was supposed to come by to pick up the painting, but never did. 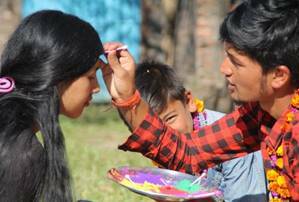 Bimal was not the least bothered by that, he paints he says because he likes to. This has been a long update, the last 10 weeks running between uncommon and surreal. To live on top of a rumbling earth that pierces up anywhere at any time it pleases has a way of changing one's perspectives on life and maybe that is its silver lining. The aftershocks continue. We partially rate our days by the Richter scale; the children have become adept at accurately sizing up each aftershock and becoming knowledgeable in suggesting our distance from the epicenter and depth of each. Morning greetings usually include “Did you feel last night's?” Many are now sleeping through them. We have managed to keep to as normal a schedule as possible throughout this time; in reflection it has been good. 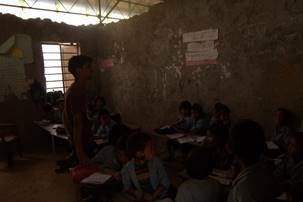 As soon as the Chelsea Education Center teachers were able to return they did and so we continued with our afternoon classes. Ted Seymour, who spent about 6 weeks with us from January and who is the person responsible for bringing the Khan Academy online math program to our children, returned in June to further work with our children. 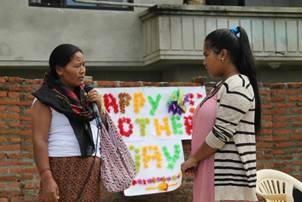 We are at this time developing an adult education program at the Chelsea Center which will teach math and English to local women. The response to our flyer indicates great interest. We hope to have the program commence in the third week of July. 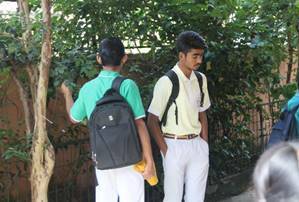 Our 2nd year college student son Ashok will be the teacher. His college classes run from 6-10am each day and the Adult Ed classes will go 10:30 to 12:30pm. 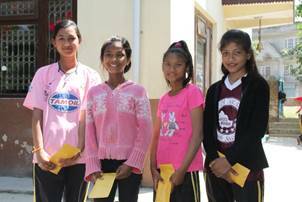 We had seven girls who this year formed a tailoring group. They are doing really well and make all our uniforms and kurta sulwars. 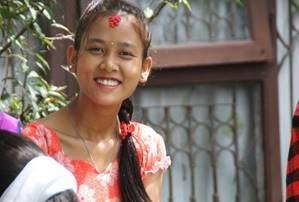 Amrita, who had received the most training, was asked by our tailoring teacher to manage her new shop and has thus hired her away. 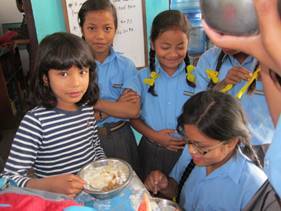 During the day if any of the remaining six girls have a question, they either go to Amrita’s shop or our teacher Goma’s shop for help. She has wanted to attend nursery school so we take her for 30 minutes when school starts and again at lunch time. She is a quiet observer of the rules and behavior and when some kids get a little rough, she has learned how to find safe territory. When we walk in the door she usually asks me to sit near it while she ventures deep into the classroom. Hope at tiffin time in the nursery. 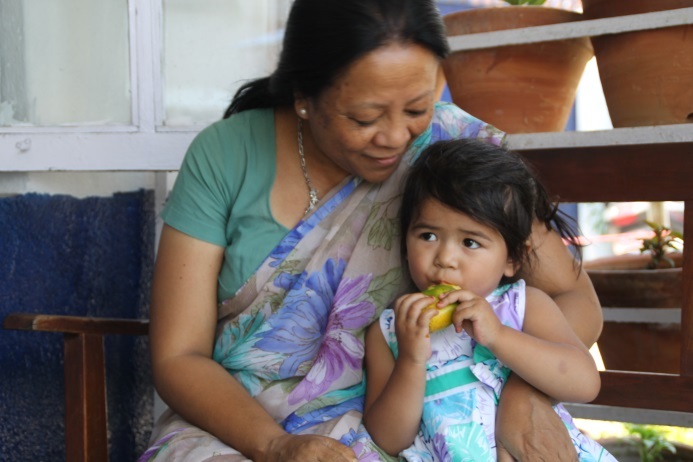 The Principal loves Hope, even when she is eating a mango on her lap; here Hope is wearing a dress that Mrs. Rai bought for her. And with that I wish you all the best. I have not yet adjusted to saying 2015, seems like a pretty big number when I reflect back over my life as a teenager growing up in Maine in the 60’s, which doesn't seem so long ago. As youth we look to the future, as we age we remember the past and in our middle years we become a bit wall-eyed. Memories to the mind are like distances to the crow; they are short flights. 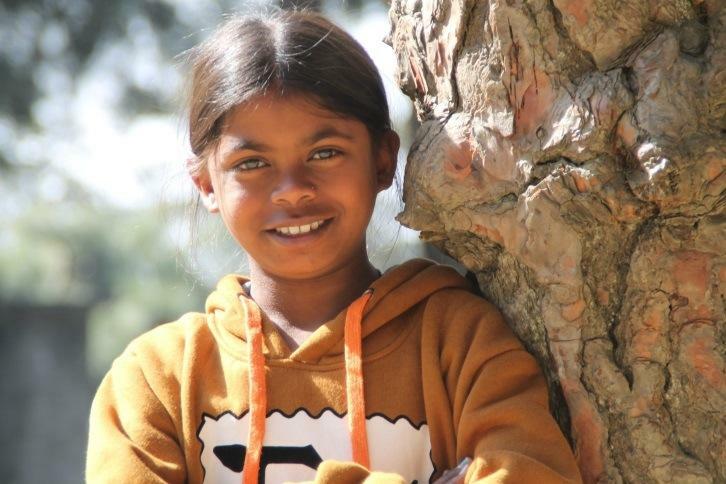 In the last update I wrote about Gita and our finding that she indeed had a deficiency in her growth hormone that could be remedied with daily injections long into the foreseeable future. Within days of the update being posted on the website we had a few people write and ask how they could help. This included a couple of doctors in Germany. 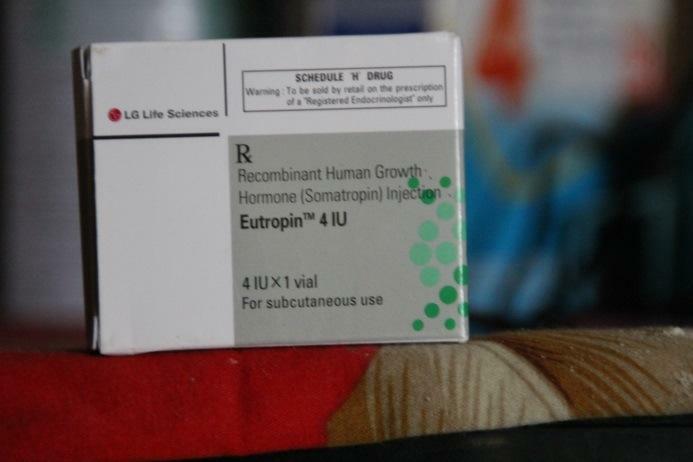 One family from British Columbia however immediately wired enough money for a year’s worth of treatment, following that with a letter of explanation. 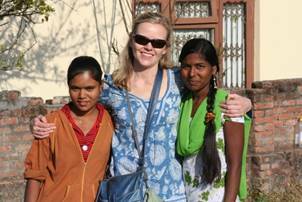 Julie and Stacy Owczarek have redefined acts of compassion. 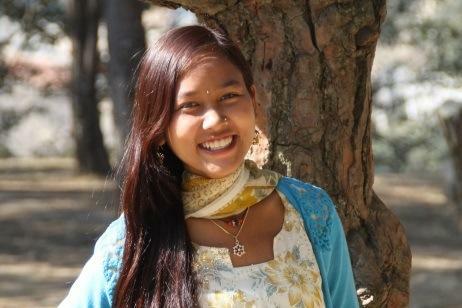 Gita is a real trooper; she is always smiling and indeed maybe more with each nightly injection as she feels it is a magical elixir bringing her closer to renewed growth. 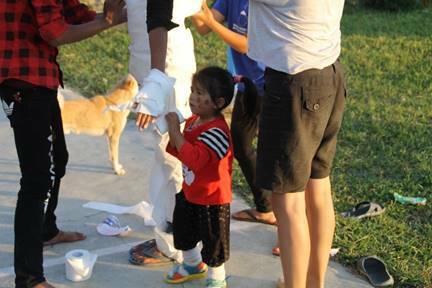 I began the injections and then trained her sister Sapana to do them. Gita herself is willing, but her fingers are a bit short for the task. Above in the dim light of a solar bulb Sapana prepares to inject her sister. The medicine is on the right. 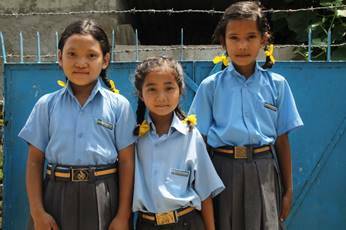 The bottom center shows sisters Sarita on left with Gita and Sapana before school. 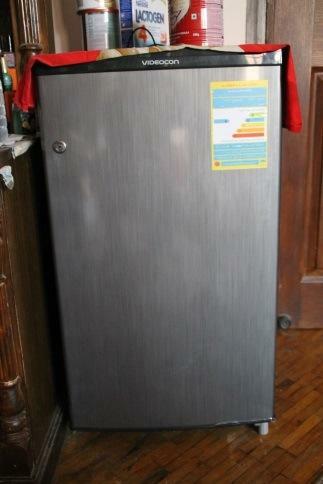 In order to achieve the best discount we bought a six month supply which filled the small refrigerator (the first purchased in the history of NOH) with her medicine. With our daily power supply being twelve hours, we only open the door once a day and hope for the best. 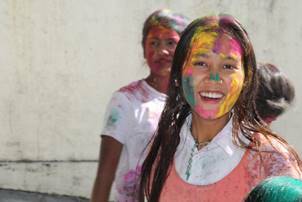 The first three months of the year are packed with Nepali holidays: January has the Maghi Festival and Saraswati Puja, February Valentine’s Day, March Holi and now in April we celebrate the Nepali New Year, which is the ending and beginning of the new school year. 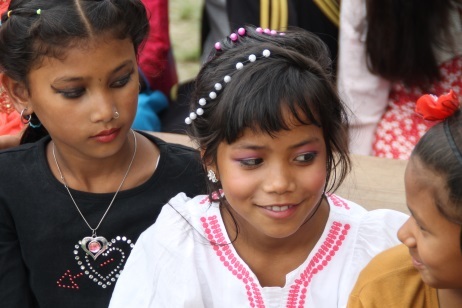 Maghi is the Tharu New Year; the Tharu ethnic group accounts for over half of our children. 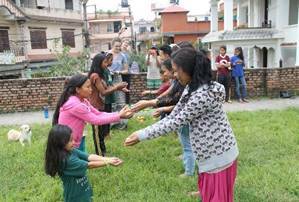 The day is celebrated by togetherness, dancing and eating finger-sized sweet potatoes boiled in very large pots. 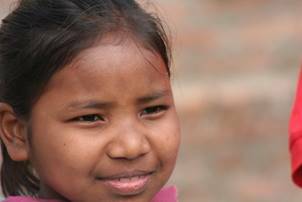 In the children’s life before us, it marked the day that middlemen would come to their villages and make contracts with the guardians on all girls 7 years of age and older if somehow any older girls happened to be there, and then taking them away. 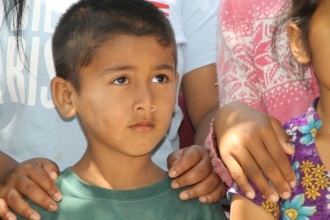 Here the children nestle into the certainty of their security and the love of their family. 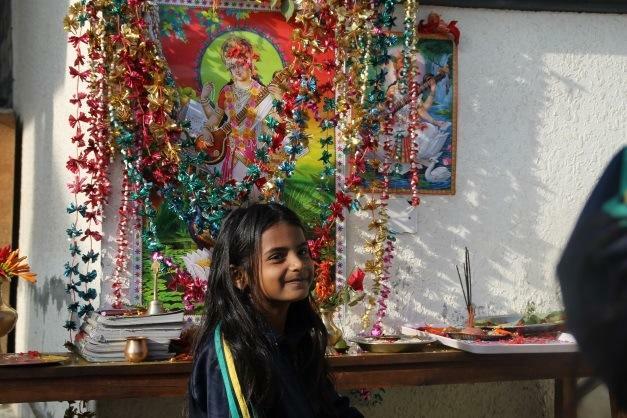 Saraswati Puja is a celebration in honor of the Goddess of Education Saraswati. The children all take this quite seriously. Anita Mahato and the girls in her home start the day before preparing all the foods associated with the occasion and rise hours before dawn on Saraswati Puja to bathe and finish setting up the shrine and plates of food to be offered on the shrine and eaten by all after they have offered their prayers at the altar. 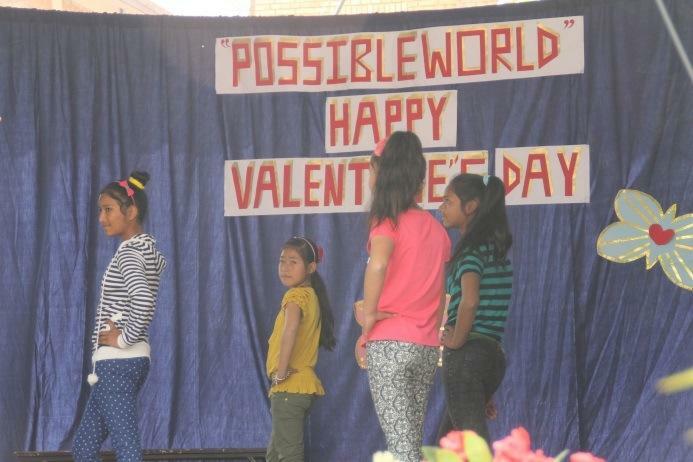 Possible Worlds (Toronto NGO founded by NOH Board Member and Filmmaker Toni Thomson) sponsored the annual Valentine’s Day celebration that keeps getting bigger and better. 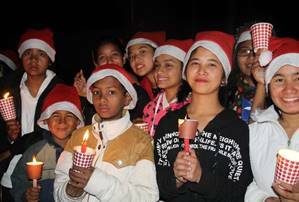 This year we asked Sharmila Rai of Skylark School to handle all the decorations. 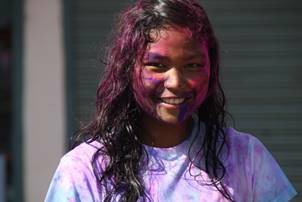 She has demonstrated in the past some pretty amazing artistic creations for other school events and has a love for doing it. 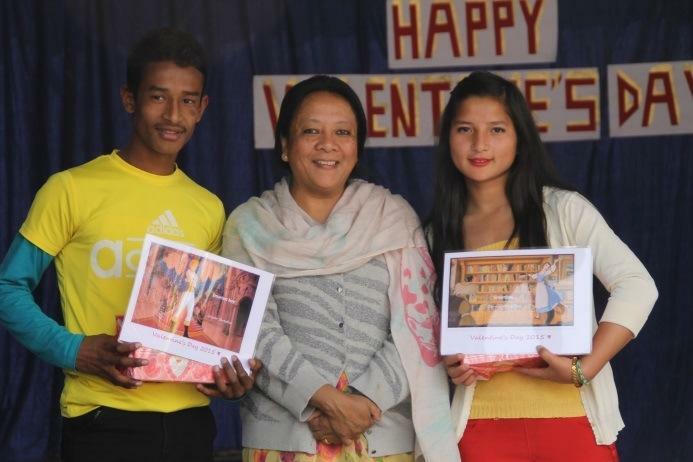 Our Volunteer Nepal staff headed by Eileen Witham and Sunita Pandey organized all the voting on superlatives, made individual bags for over two hundred children, lined up a guest of honor, bought all the prizes and awards, organized the program start to finish and worked with our café staff to deliver a special lunch. 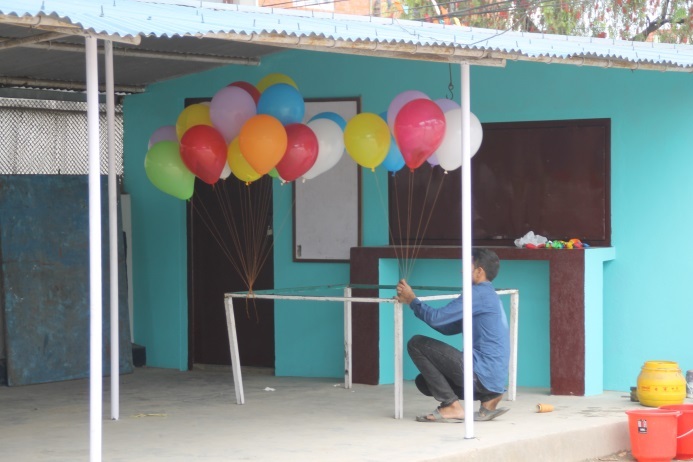 Sam’s boys showed up early at school to help Sharmila prepare the venue and they stayed after to take it all down again and return equipment to its proper place. These guys never fail to be there when asked and always bring good cheer to the task. 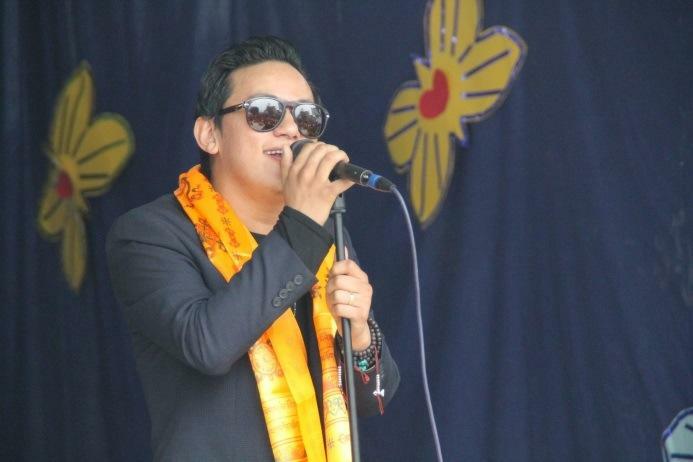 We were very pleased to have a surprise guest in one of Nepal’s musical legends Mr. Raju Lama who graciously attended and brought the crowd to its feet when he entered and took the stage where he had everyone swaying and singing along to one of his more famous songs. 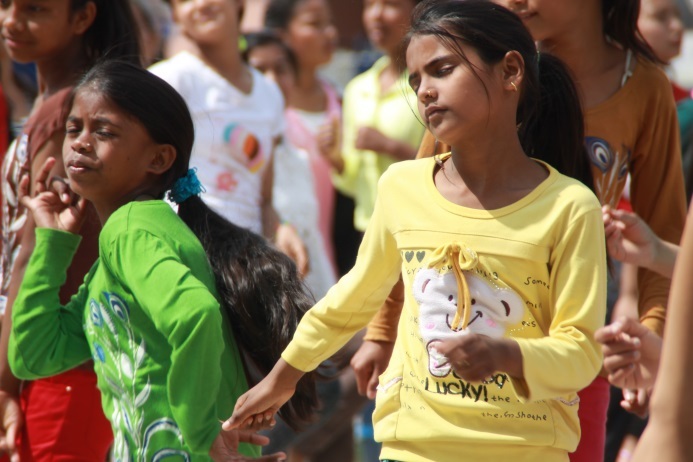 There were many musical and dance performances by children of both Skylark and NOH. 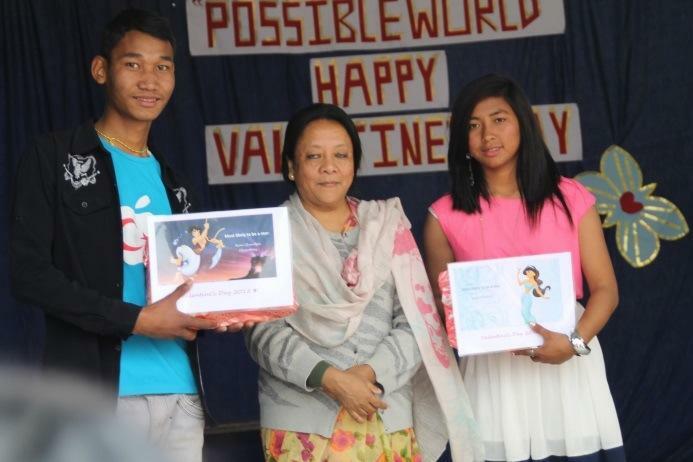 We are deeply grateful for the many years that Toni Thomson and Possible Worlds has supported the education of our children as well as ensuring a very memorable Valentine’s Day event each year. 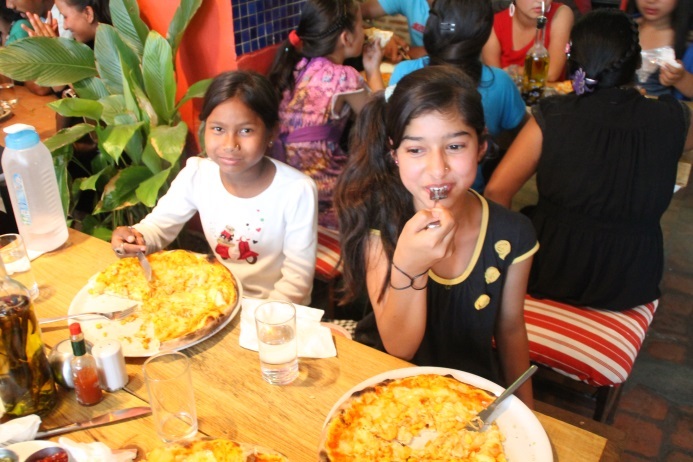 This is one of the days that captures all the children’s imagination and fills them with the happiest of memories. 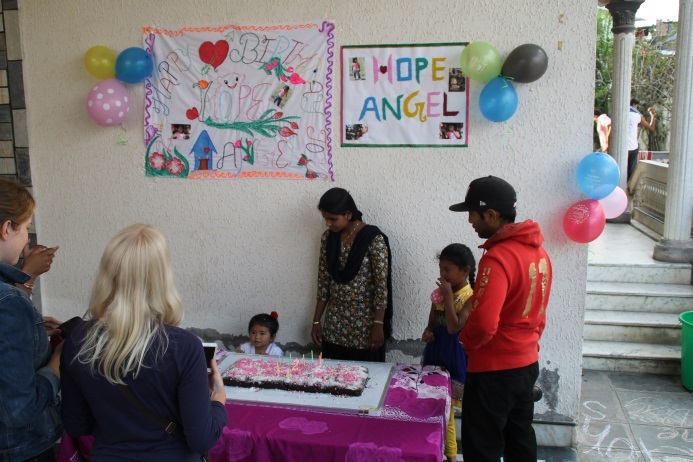 The day was full of surprises and excitement and one very special and completely unexpected performance by our Hope Angel. Hope and Anita were on one side in front of the stage and I on the other taking pictures. Suddenly Hope left Anita’s arms and started walking towards me, her first solo walk. The distance about 20’, I curbed the impulse to run out to meet her and with her eyes locked into mine willed her to make it all the way. These photos were caught by someone near and given to me the day after. Later we received many more perspectives as we found that a lot of eyes were on Hope and knew what was happening and all recorded it. Hope had a busy day. 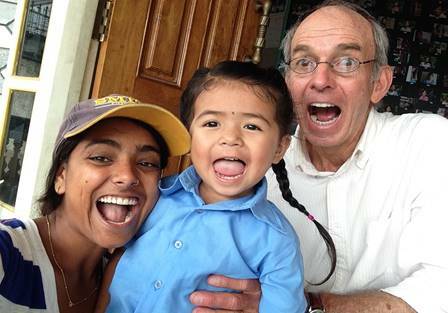 Here below she is sitting in the photo booth with the first grandchild of NOH Sujan, who is the adorable son of our daughter Santi who has returned to the fold and become the cook of Sanctuary House. 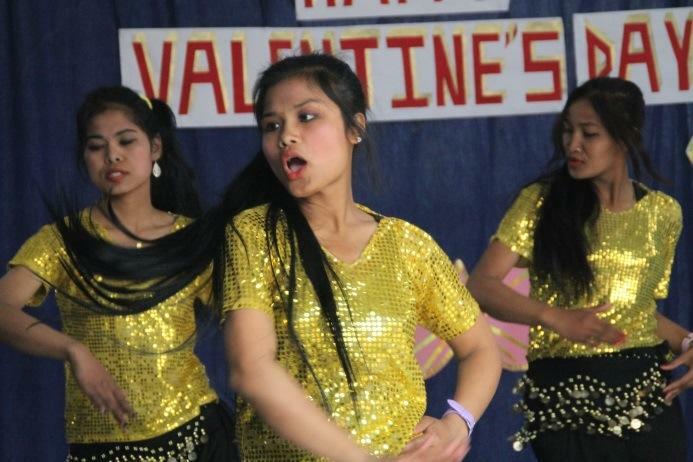 Random shots and some of Anita Mahato’s girls who choreographed their own dance. 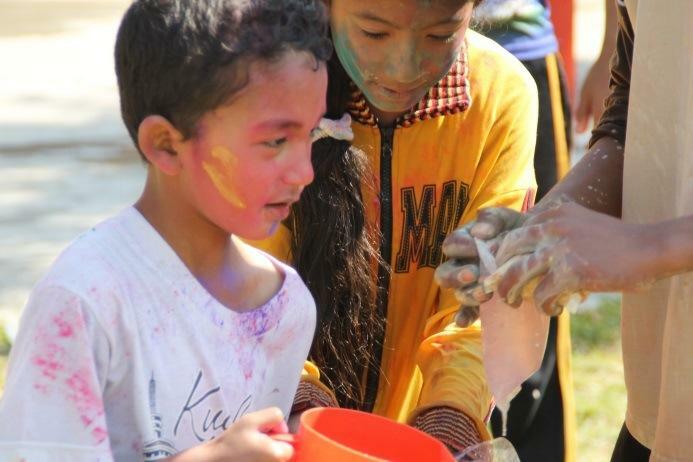 A day of water balloon fights and color which always attracts our more sporting volunteers. 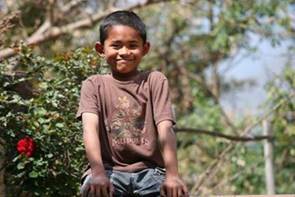 Chham Gurung is my second Nepali son; he was in the first orphanage that we rescued. 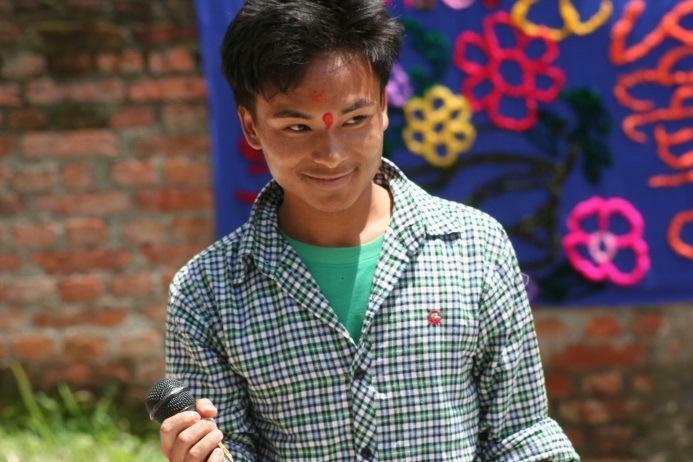 In 2014 before starting class 12, Chham decided he wanted to get a room on his own so that he would have the freedom to work both before and after school to help his poor aunt and her children. 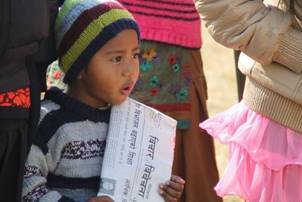 He accepted no money from us other than his college fees. 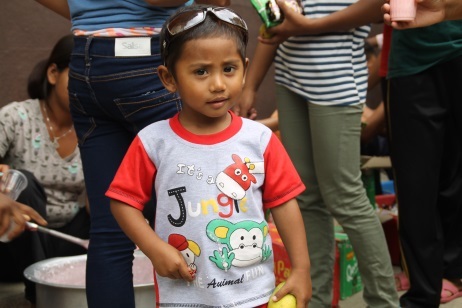 He found a little room nearby and would go to the wholesale vegetable market at 4:00 in the morning to find the freshest vegetables he could buy and deliver to his aunt to sell. With each day’s profits he was able to buy more and she sell more. She would sell out quickly because Chham picked only the freshest vegetables available. In the evenings, Chham became a door to door salesman for low energy light bulbs. 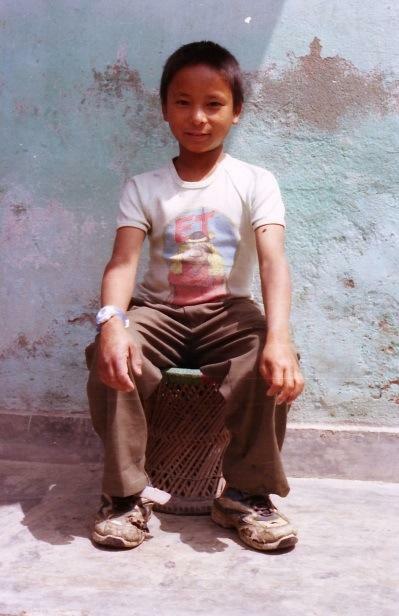 During school vacations he would go back to his village and be a porter for European trekkers. 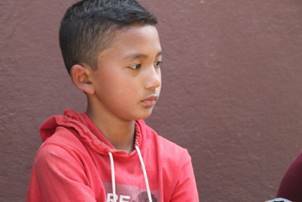 When Portuguese Humanitarian Photographer of the Year winner Rui Pires came to NOH to film the children, he met Chham and saw himself in him and the two became close friends. 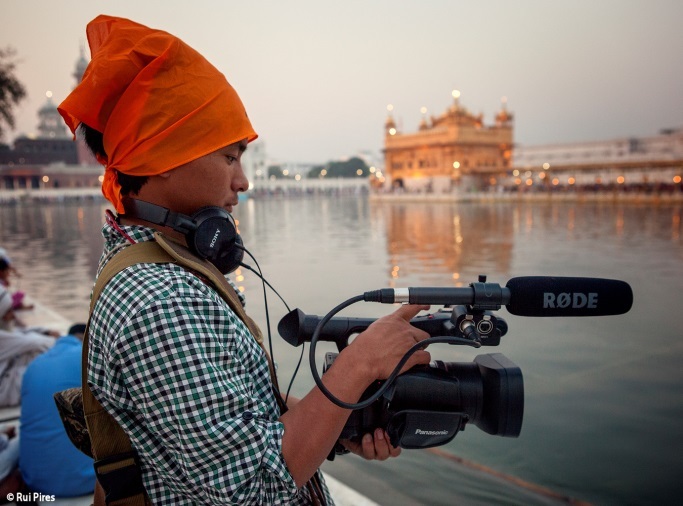 Rui is taking Chham next month to film at two locations in India for a month’s time. He will be teaching Chham the art of photographer’s assistant. 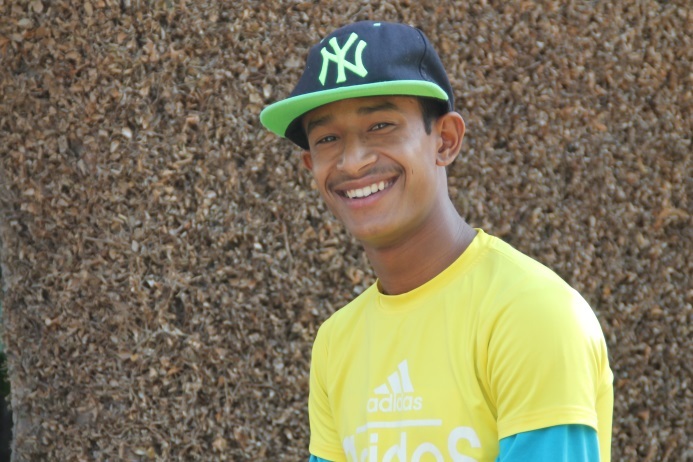 Just recently Chham, who has been doing porter’s work for a couple of years, was selected by the Nepalese government as one of 750 people to be trained as Licensed Trekking and Mountain Guides out of 2500 registered guides who applied. Chham, who is one of the strongest people I know for any size man, passed the two week course with flying colors in time to return to college for his final exams. 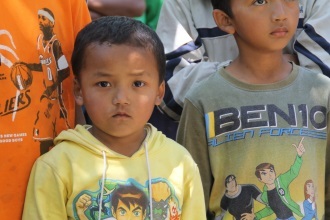 Chham has always watched out for little kids or those more vulnerable, or with few friends. 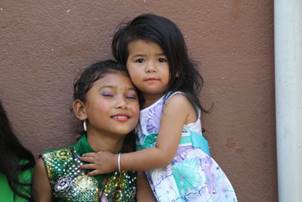 Kabita and her sister Apsara have from day one been very special to us all. Simply put, they are the best of the best. They are exceptionally close sisters with great admiration for each other’s character and achievements. I have written about Apsara recently, how sick she was when she first came and the week I spent nursing her back to health really bonded us. 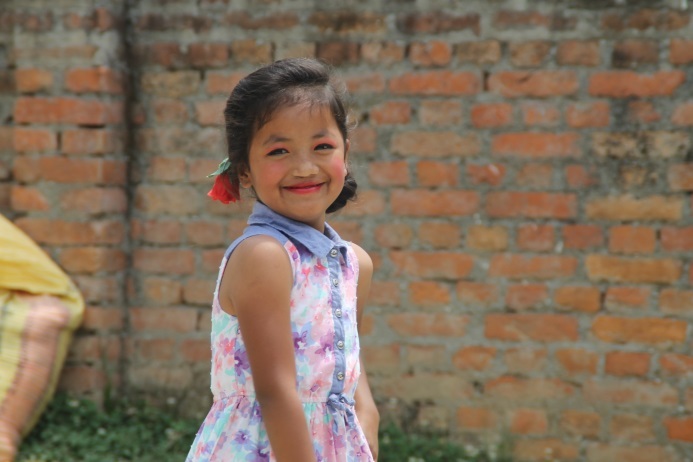 Kabita, even so young then, was very protective of her sister and had guided her through a very difficult time when they were removed from their home and brought to us. 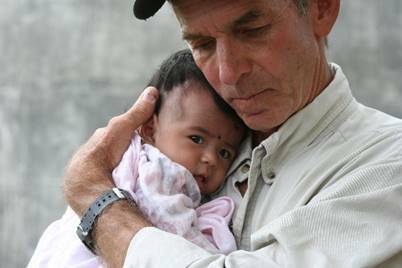 At her age and in her role believing that she was the only one to really care about Apsara, she watched me nurturing her back to health and she felt trust. In her innocence, she saw a guardian angel had come to insulate them from further harm. 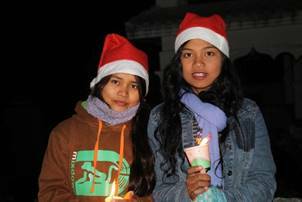 We have always been very close and it would be Kabita that I could turn to for the truth if ever there was a dispute. 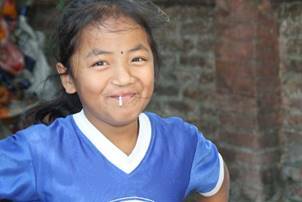 Kabita has worked very hard at school, putting in longer hours than anyone else and managing a respectable grade from it. 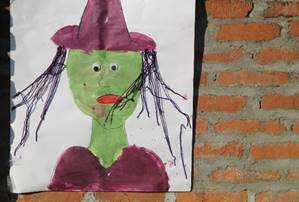 She has repeatedly been honored at school and at home for her character, and her house mates voted her to be their House Captain. 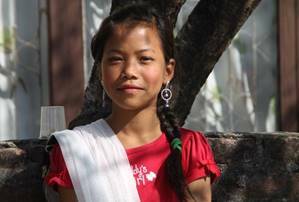 Kabita recently sat for her School Leaving Exam and now has three months of holiday. 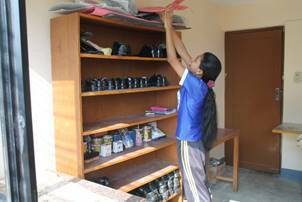 She and two other college-bound girls moved into the girls’ college house to begin their transition to independence. 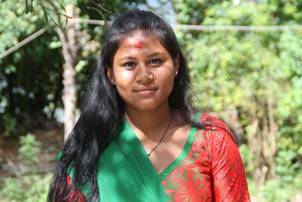 Last week Kabita came to see me and announced that she felt that she should go and help her mother. Despite events of the past, she has always loved her and felt sorry for her. 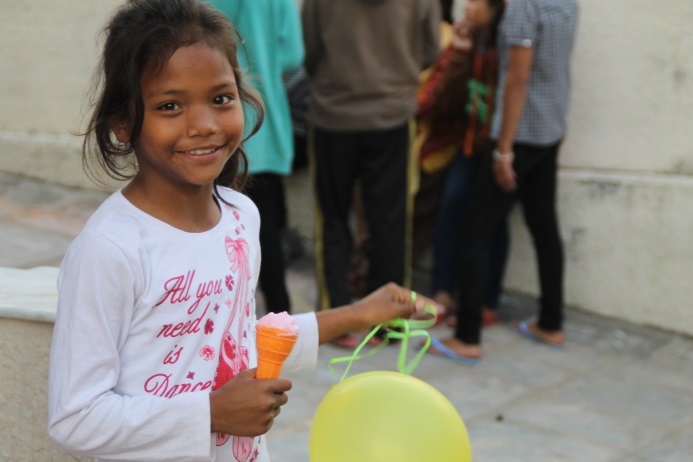 Her mother lives in a small room without plumbing; she sells items on the sidewalk to get by. 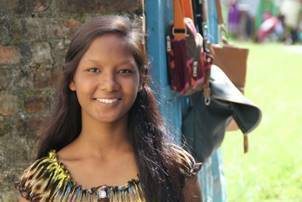 Kabita told me that she would get a job and take care of her mother and then when school starts she would work and attend a college near her if we could help with the fees. 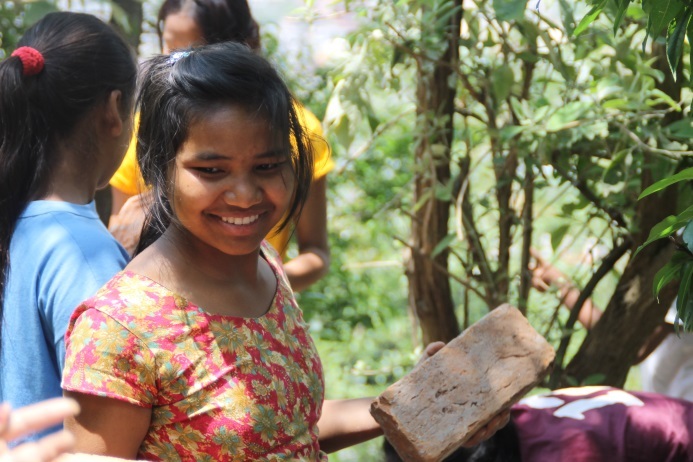 Kabita is leaving behind a comfortable flat with some of her best friends, all expenses paid and opportunities to simply study or work with us in some capacity part time. 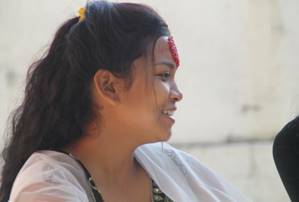 She is leaving what she has said has been a dream of a family and her sister whom she is so close to, because Kabita is the type who puts others first and feels that the right thing to do is the only thing to do. 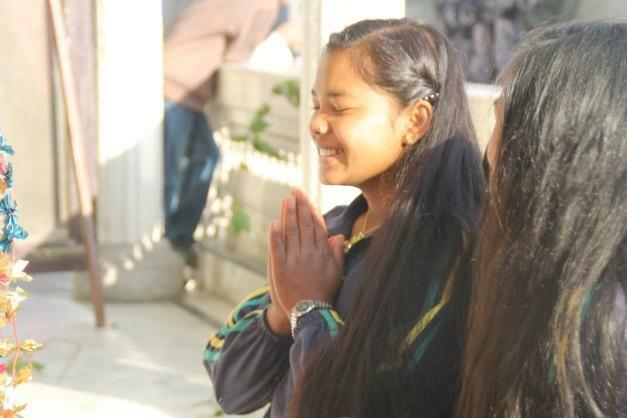 On April 1st, a line about 150 people long queued up to give Kabita a blessing and hug goodbye. She wrote beautiful letters to several of us and handed them over before leaving. As it is with all of our children we will always be there for her in both good times and bad. 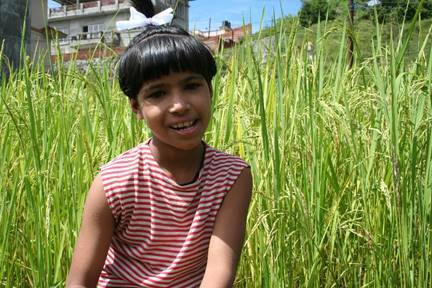 Puja has always been a confident and very funny little girl. 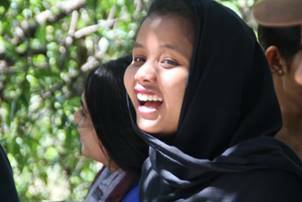 I believe that a sharp humor illustrates a person’s intelligence and I feel Puja is very intelligent, though she has preferred to hide it from evidence in more traditional ways such as school grades. 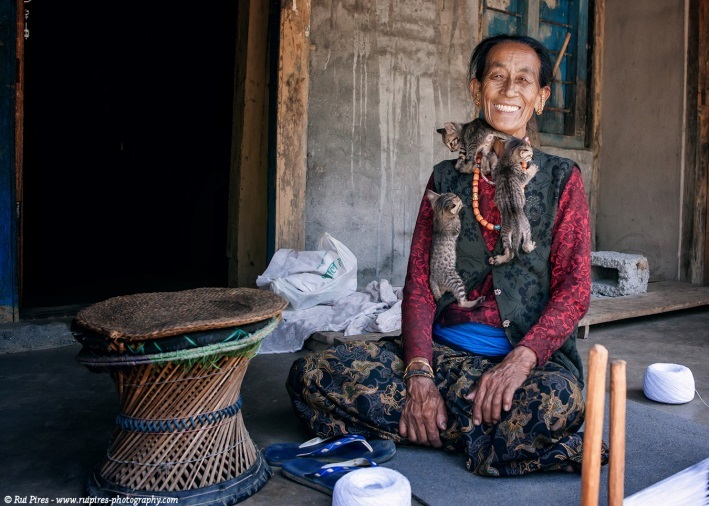 Pupu, as I have always called her, has been steadfast from day one that her life needs balance and she should not give an inordinate amount of time to study. She has been consistently in the middle of the class almost perfectly so, as if she had her eye on that mark and would tap the brakes a little if she thought she would exceed it. 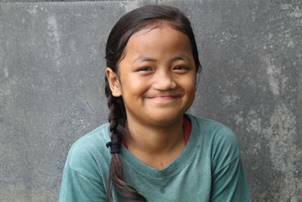 This past year Pupu was in class nine and she began to gain height and recognition from the boys for the striking metamorphosis taking place. 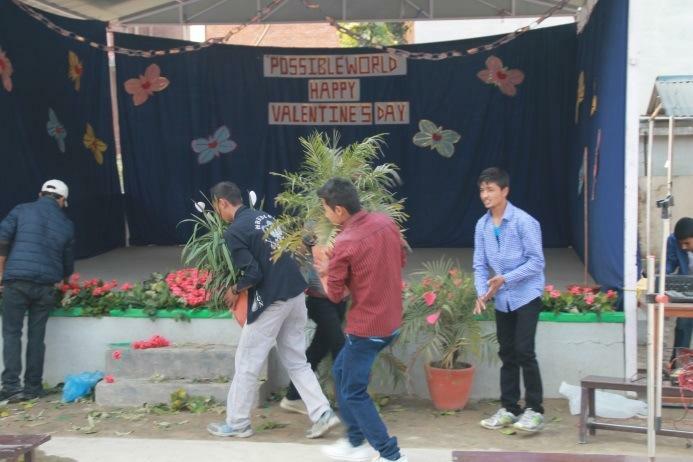 And something else started changing in class nine. 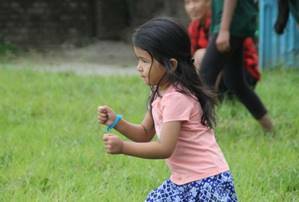 Her first term results had her leaving the middle pack and start to gain ground, she finished 15th out of over forty. She claimed it must be some sort of grading anomaly. Her second term she was 9th. “I don’t know what is going on,” she said with a dismissive shake of the head. In the third term she was voted Captain, a high honor by the faculty, for which only a few of our children were selected. I am watching as in a 5000 meter race, Pupu has pulled away from the middle pack with a couple of laps to go and has caught the end of the front pack whose runners turn their heads in disbelief to see her. Pupu smiles affably, but as they turn to resume their demanding pace they hear Pupu’s determined stride letting them know that if they wish to win she will be bringing them through new thresholds. The last lap is already in the books and we will learn this coming Saturday where she finished, but it is clearly no anomaly. 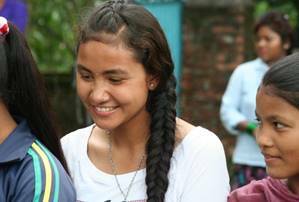 Pupu was roommates with Kabita and Apsara and after Kabita left, the house voted Pupu Captain and representative at the children’s council. And as you have read she was also voted the funniest girl in school; a year of accolades for a girl who has always had a well-rehearsed defense for wanting always to be right in the middle. I wrote the above in a letter to a friend at some point in January. We had three teaching programs that had been in planning for several months and were looking forward to their commencement in early January. Though I had thought that I had covered all the bases and the programs were sure to be resoundingly successful, I had in my optimism overlooked a potential fly in the ointment, the human element, and all three programs met with somewhere between never getting off the ground to helpful in a totally different but unsustainable way. A fourth program has more than made up for the other three and in hindsight I feel that had one or two of the other programs worked it would not have been as positive in its effect upon the children’s learning as the fourth program alone. Ted Seymour had come for a visit last fall and vowed to return. 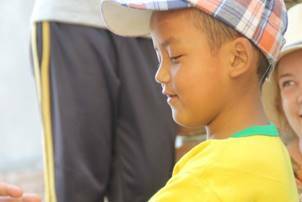 In late January he did, with the desire to set up the Khan Academy online math program for the children under our Chelsea Education Center. 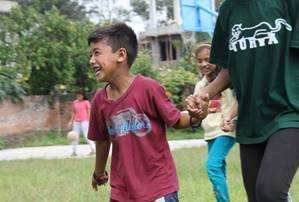 In a little over six weeks’ time, Ted accomplished our setting up five sessions of this individualized program for 55 children. 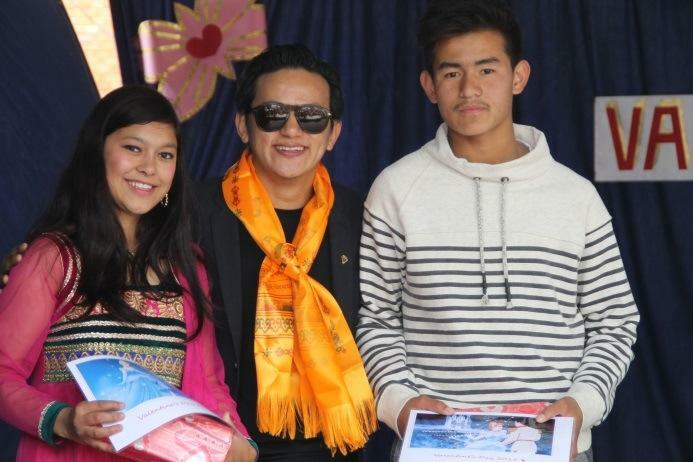 NOH, through grants and donations, bought an additional 22 laptops, battery and inverters for three dedicated Khan Academy rooms, and internet and routers for each. Ted interviewed and hired three young college math professors as coaches for the 11 children in each room. They assist our own son Dhiraj who is very advanced in his knowledge of computers and math and Anita, our math tutor from Skylark. 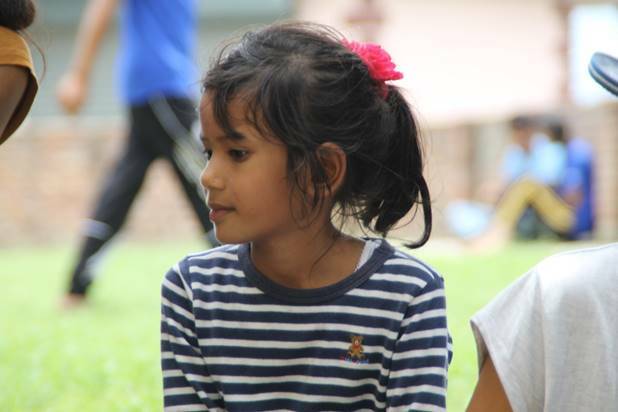 The Khan program is an amazing tool and the children have eagerly embraced it. In addition to this, we have considered utilizing the Khan Code Academy in our computer science curriculum where we presently serve 38 children in three different levels of computer science from basic learning of the MS WORD Package to web design and more advanced program writing. We have two extraordinary young teachers for these three classes and our Computer Hardware class is now taught by the trouble shooter for our ISP. All these new folks are dedicated to teaching and have developed great relationships with the children. 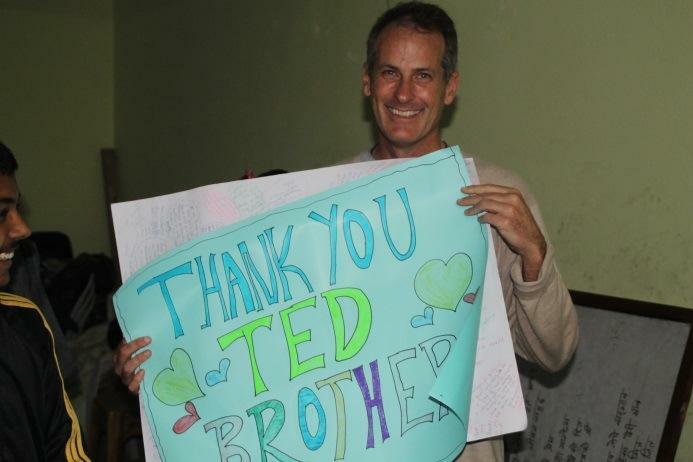 Though Ted has gone back to California, he continues to monitor the program and has joined the NOH board of advisors. 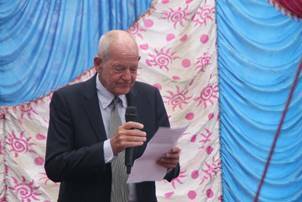 He is a very smart man who inspired the children with his calm, happy, fun approach to learning and we look forward to his return and advice in between visits. Dhiraj doing an introduction to potential students and one of the new dedicated Khan rooms. 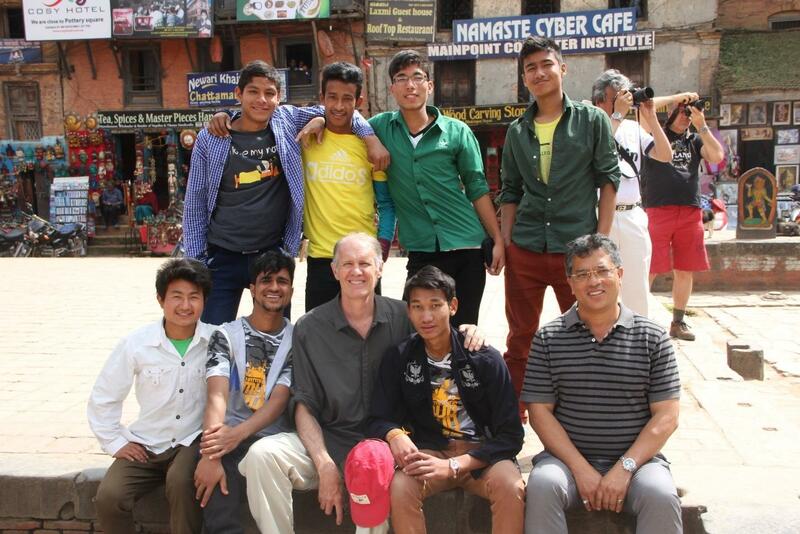 Several years ago we had the pleasure of meeting John Lambert who was leading a group of students from a Saudi Arabian private school on a trekking tour of Nepal. 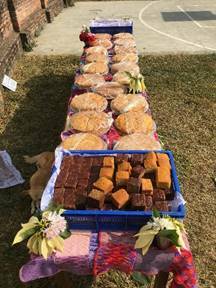 This had been arranged by a wonderful 16 year old volunteer with Volunteer Nepal named Sally Cai who was a former student of the school. 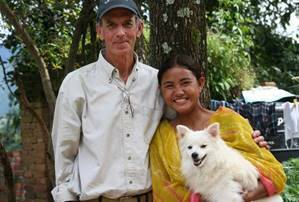 She contacted John who admired Sally very much and suggested that John’s trekking group spend some time at NOH, and so he arranged to do just that. 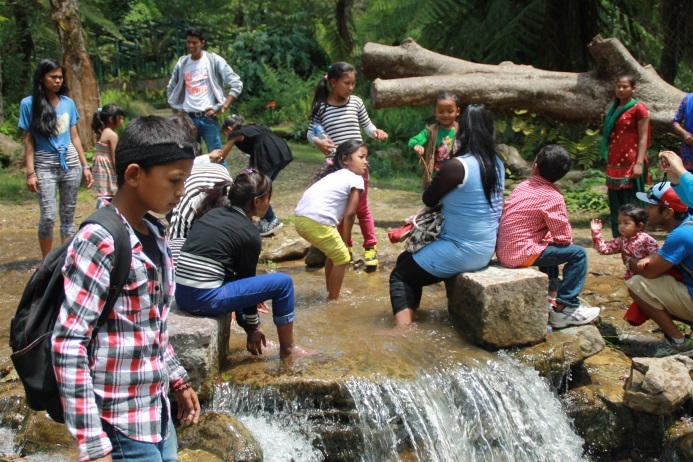 This year was the third year that the NOH children and ARAMCO children have spent a memorable day together learning about each others’ culture and developing friendships. All the ARAMCO kids are special, but I would like to make mention of a few standouts. 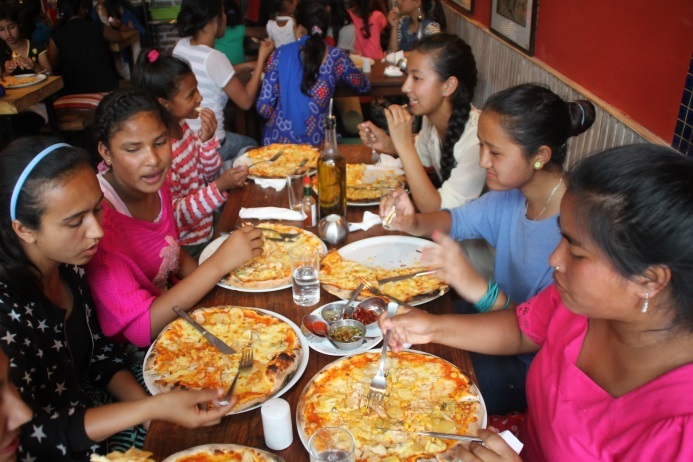 Two thirteen-year-old girls named Maya Dalia and Angela Hernandez did fundraisers before coming which netted $2250 USD. 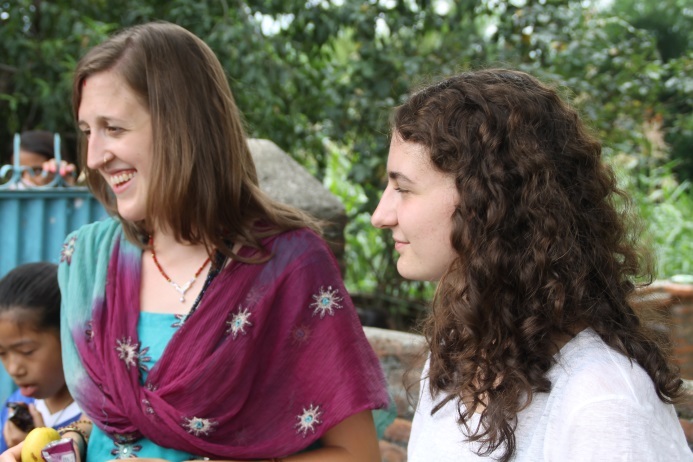 I have exchanged e-mails with these bright young girls who have lived in several countries in their young lives, and they reflect a maturity and understanding of the universe that is seldom found in college students. 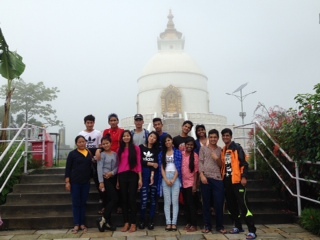 Their efforts were initiated and carried out alone; they illustrated a great understanding of business and marketing. 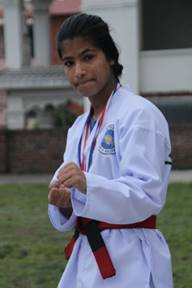 And a third student named Chiara Fitzgerald at 16 years of age has come twice with the school. On her own Chiara managed to collect clothes, games, school supplies, shoes, dolls, under garments and more, the total weighing over 300 kilos. 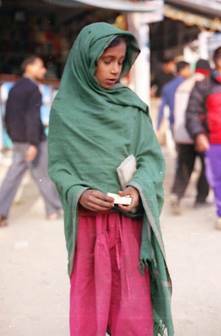 She paid for the baggage fares herself from her after school and weekend work. The items brought are absolutely beautiful and so useful. But Chiara was not done yet; she also brought a gift for Hope which may have required a separate seat purchase it was so big. My hat is off to these incredible kids and to their parents for having raised such generous and caring human beings. All three have pretty spectacular futures in store for them. The relationship with ARAMCO has helped me to gain three very good friends: Julie Brockish, who with her husband and children have finally returned to the Pacific Northwest where they are in their dream home in a beautiful area; Louis Spencer who retired after almost 30 years with ARAMCO as a teacher and who volunteered with us last October, a man whose company I enjoyed very much; and last John Lambert who like Louis retired the same year. 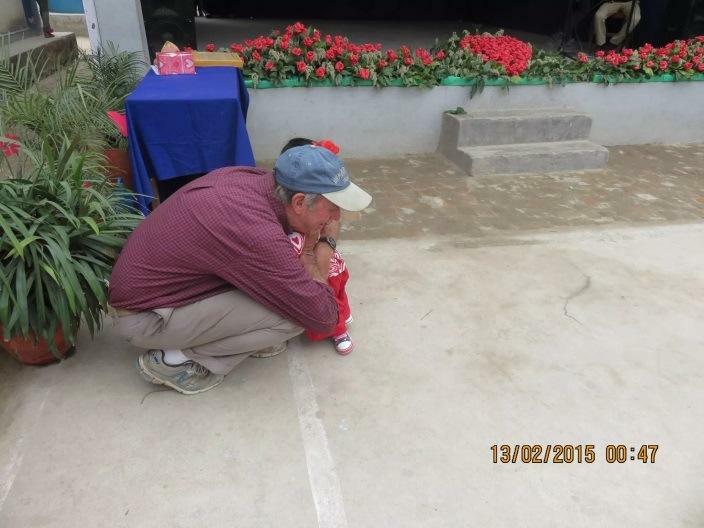 After the children were returned to Saudi Arabia with their school staff, John remained behind. 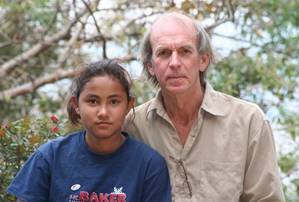 He has been coming to Nepal for close to thirty years and has many friends here from his early days. 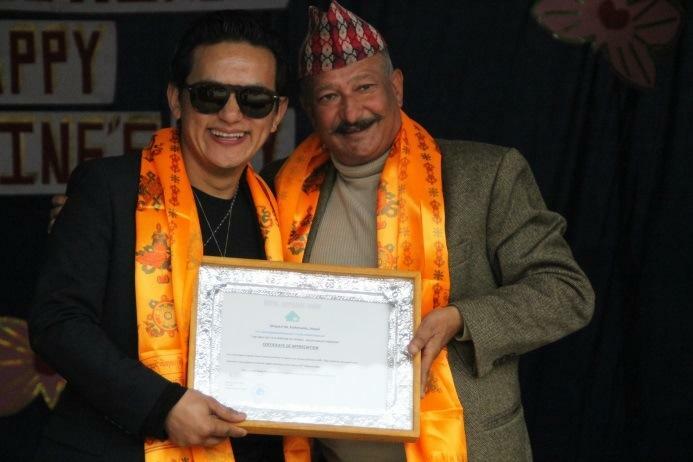 One of the best known trekking and mountain guiding companies in Nepal was started by his Nepalese friends. John wanted to take a group of our boys exploring one day with his friend and one of the owners of this trekking company. He wanted to expose them to a potential livelihood and have a fun day of talk and seeing new sites. 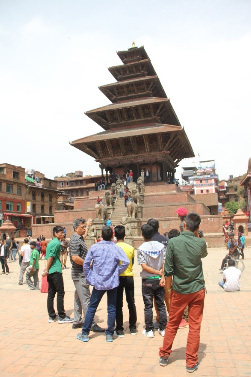 They picked up Sam and the boys early in the morning and headed out to Bhaktapur. John shared his life story with the boys and had his friend do the same, 30 years of friendship. 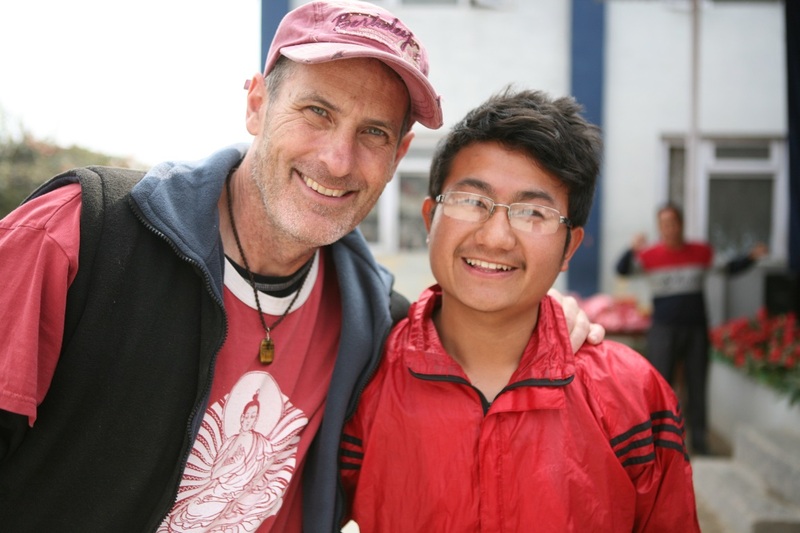 John has followed a unique path in his life from dropping out to playing professional basketball to exploring the world and finally settling in as a teacher for 30 years. John has a gift for listening to people and drawing them out. Our boys had a wonderful day and came back full of thought about John, their own futures and the infinite landscape that is their future and how not to be afraid to address it. In a nutshell, they came back eager and inspired. 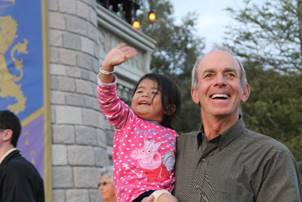 We really appreciate people like John who go out of their way to bring kindness, wisdom and good times to our children. 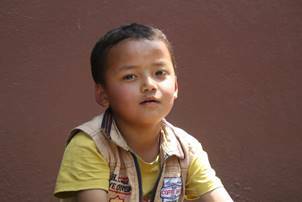 Nepal Orphans Home welcomes its newest son Bimal, who comes from Dolpa, where he has been in the care of a longtime friend of Volunteer Nepal. 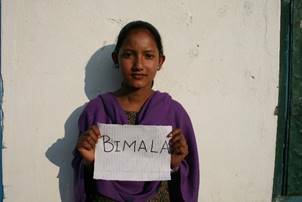 Bimal is a very bright 13 year old with a confident command of English. 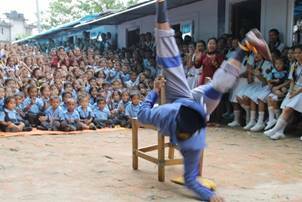 He will be starting in class seven when we return to school on the 19th of April. He is very polite and well-mannered with a pretty good sense of humor. Space has been made available for him in the boys’ home, after the opening of our college boys’ flat. Making names out of dough to place on our Calzone and bake; my daughter in law Jo is an amazing mom and cook. And my new best canine friend Ava, over 80 pounds of fierce protector of her family wrapped into the sweetest dispositioned dog I have met. I volunteered to babysit for her one day and thoroughly enjoyed a quiet tree-shaded backyard, a good book and Ava at my feet.